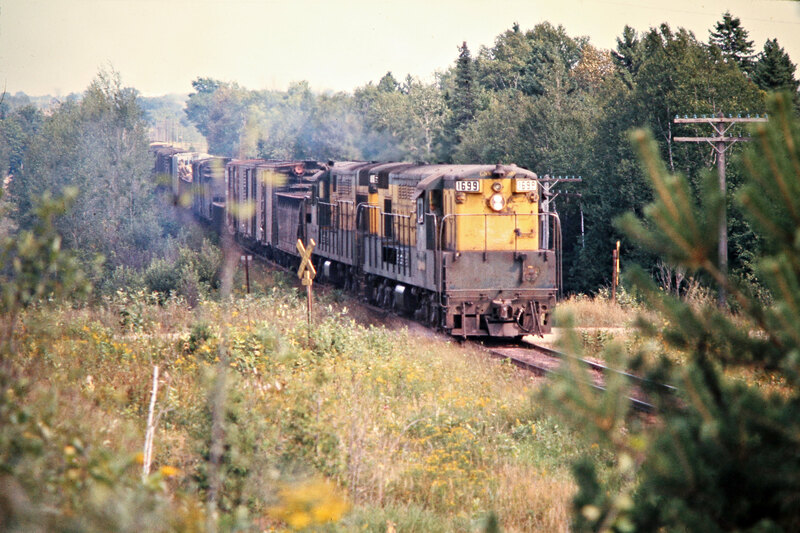 Southbound Chicago and North Western Railway ore train in Ishpeming, Michigan, on September 1, 1973. 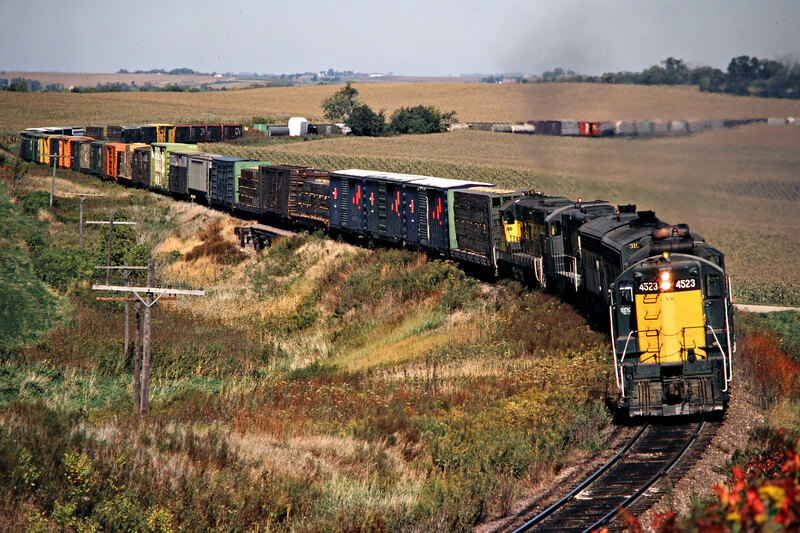 Photograph by John F. Bjorklund, © 2015, Center for Railroad Photography and Art. 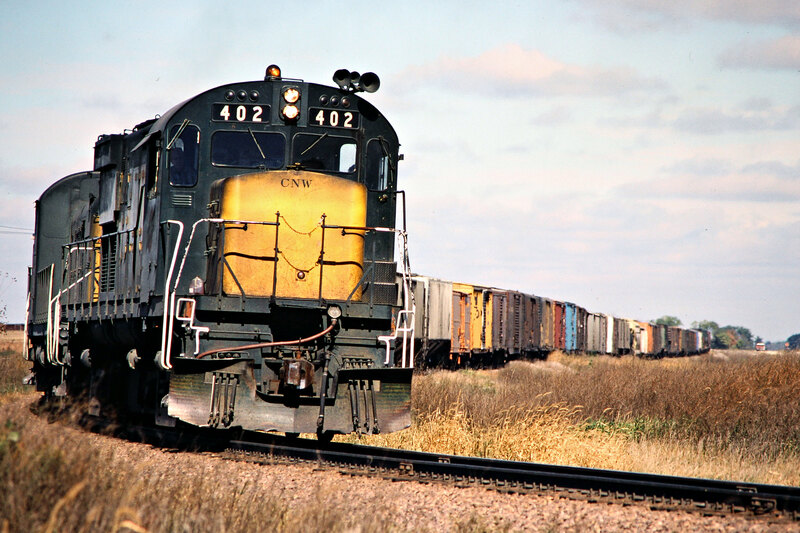 Bjorklund-24-04-05. 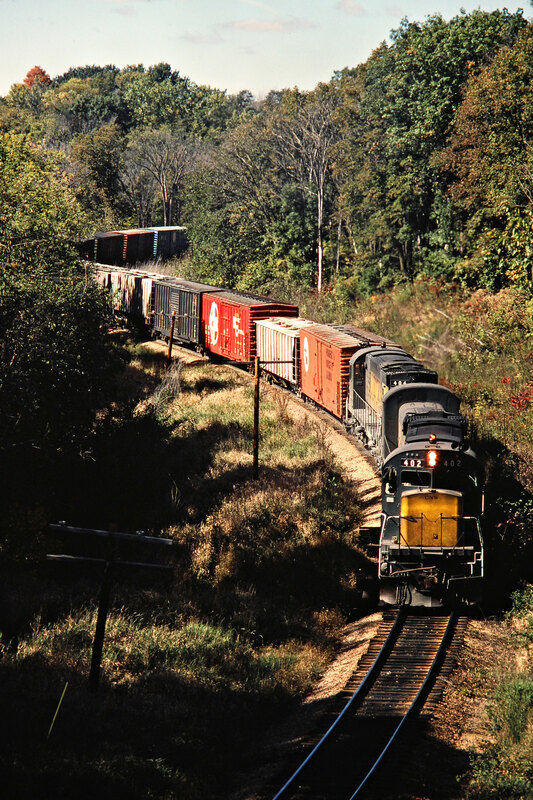 Chicago and North Western Railway ore train at Goose Lake, Michigan, on September 1, 1973. 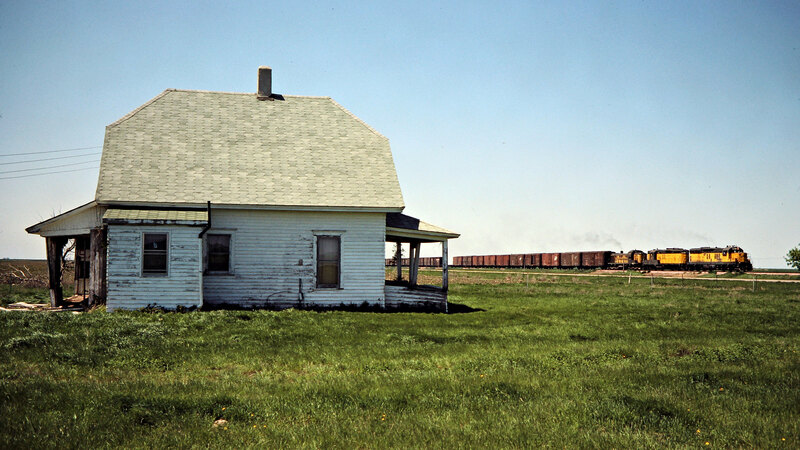 Photograph by John F. Bjorklund, © 2015, Center for Railroad Photography and Art. 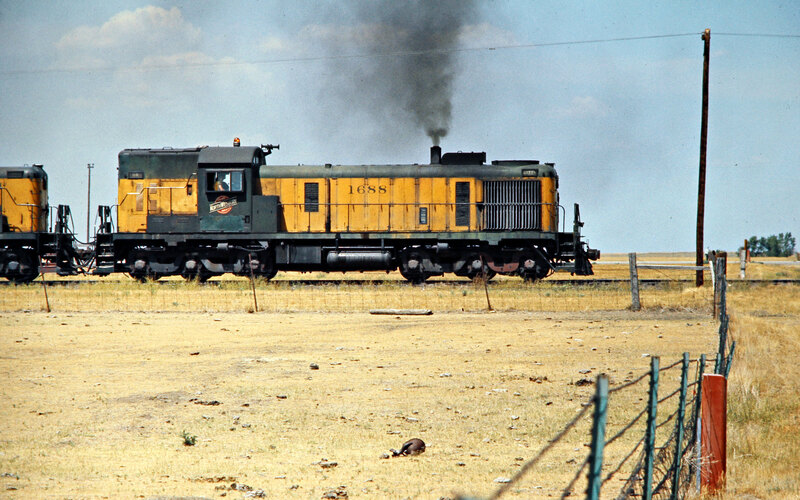 Bjorklund-24-04-20. 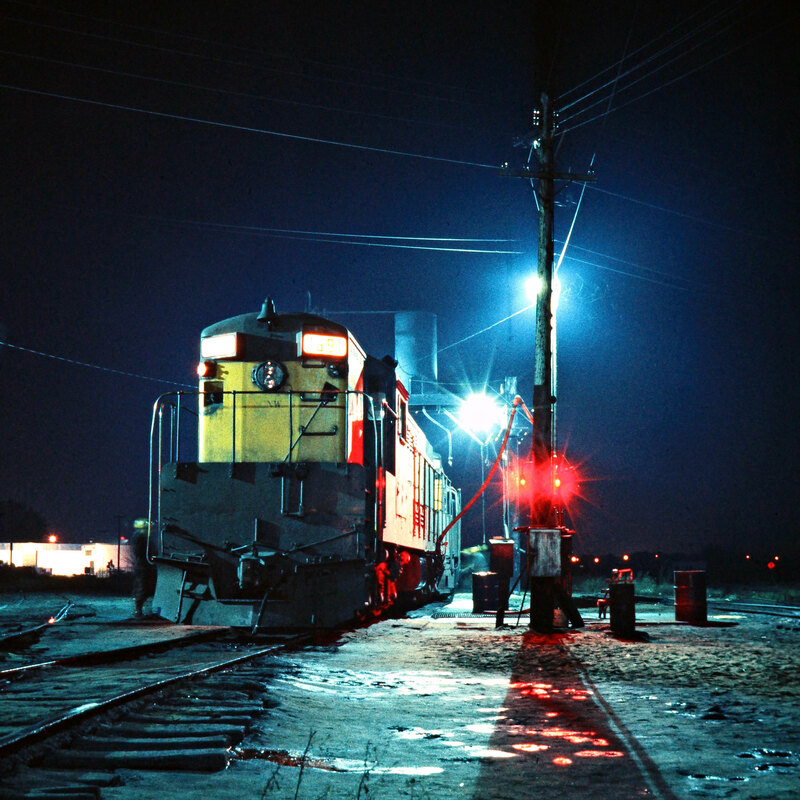 Chicago and North Western Railway Fairbanks-Morse locomotive at night in Escanaba, Michigan, on September 1, 1973. 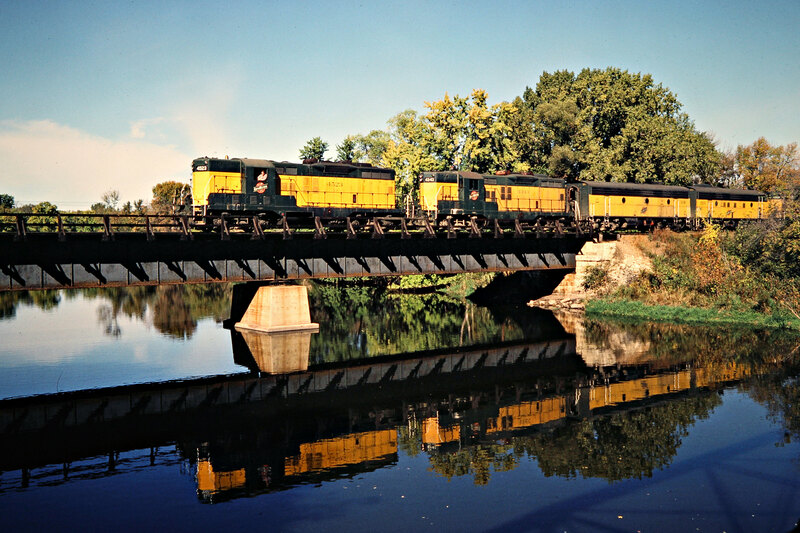 Photograph by John F. Bjorklund, © 2015, Center for Railroad Photography and Art. 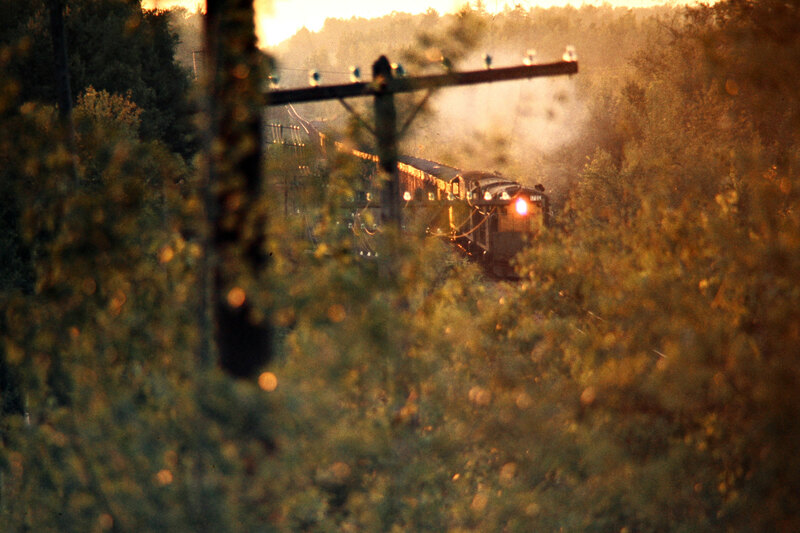 Bjorklund-24-05-06. 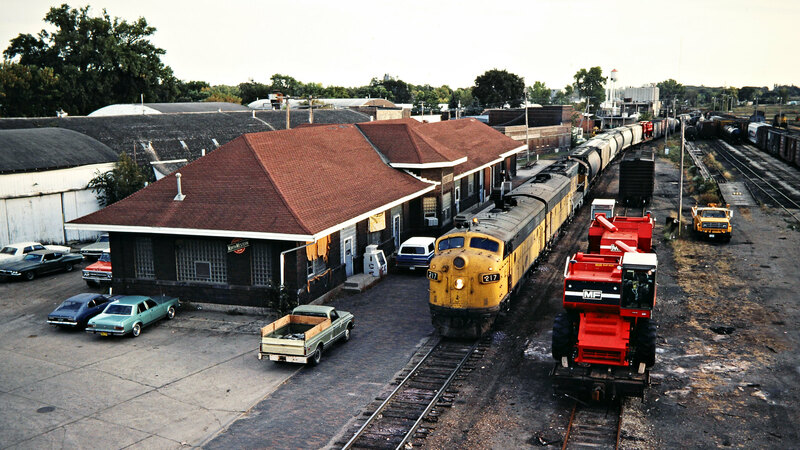 Chicago and North Western Railway Fairbanks-Morse locomotives at turntable in Escanaba, Michigan, on September 2, 1973. 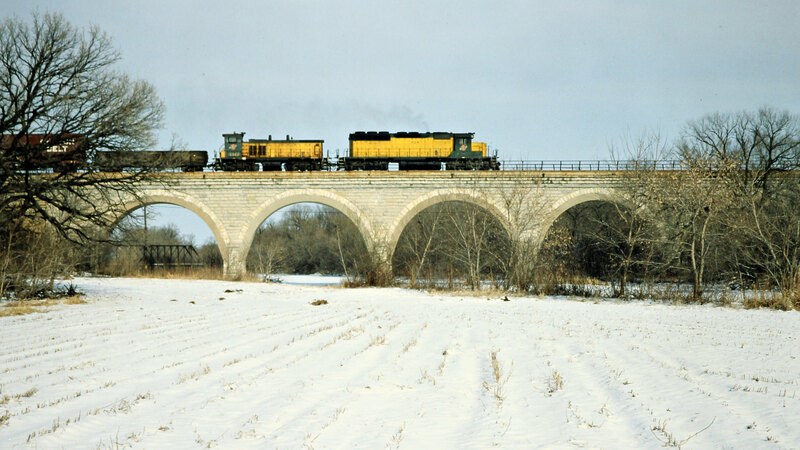 Photograph by John F. Bjorklund, © 2015, Center for Railroad Photography and Art. 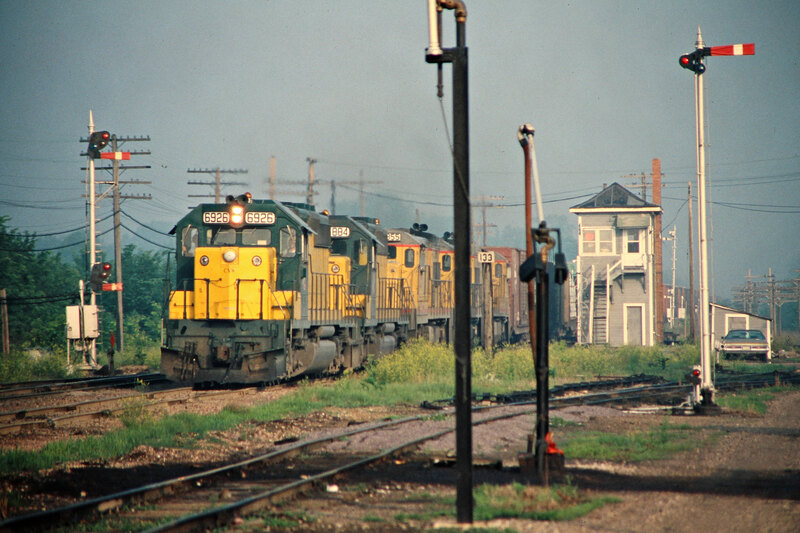 Bjorklund-24-06-03. 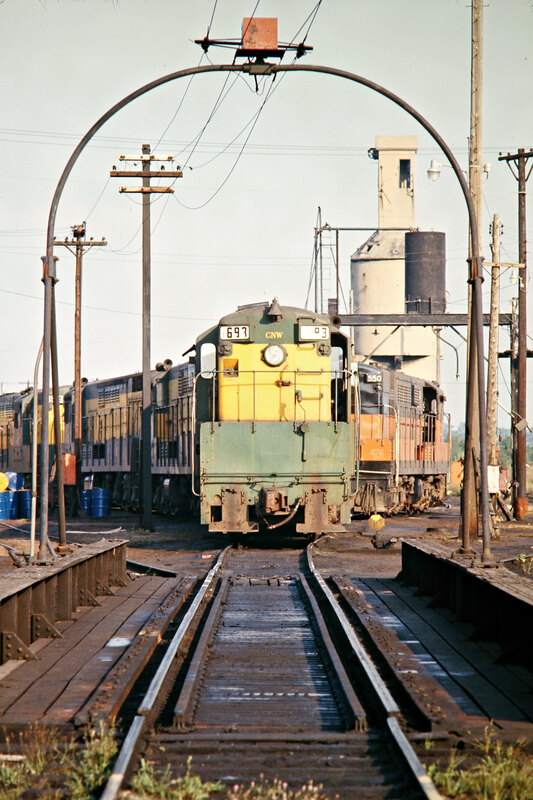 Chicago and North Western Railway Fairbanks-Morse locomotives at roundhouse in Escanaba, Michigan, on September 2, 1973. 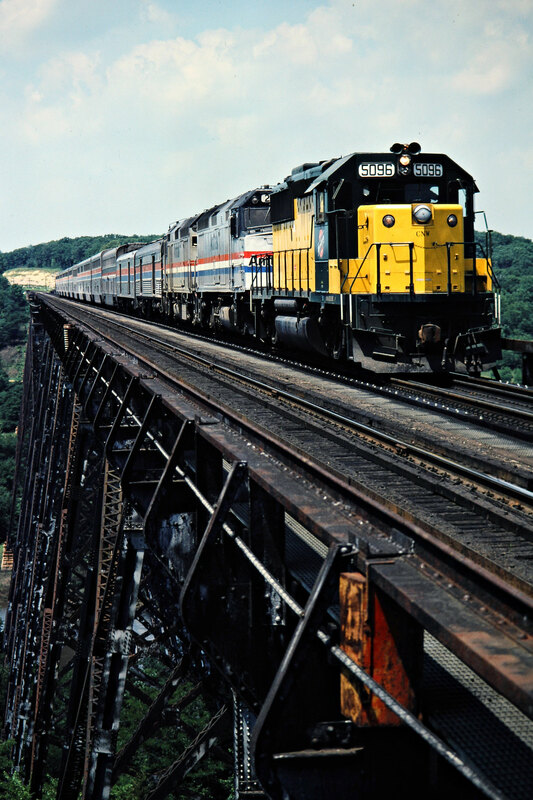 Photograph by John F. Bjorklund, © 2015, Center for Railroad Photography and Art. Bjorklund-24-06-09. 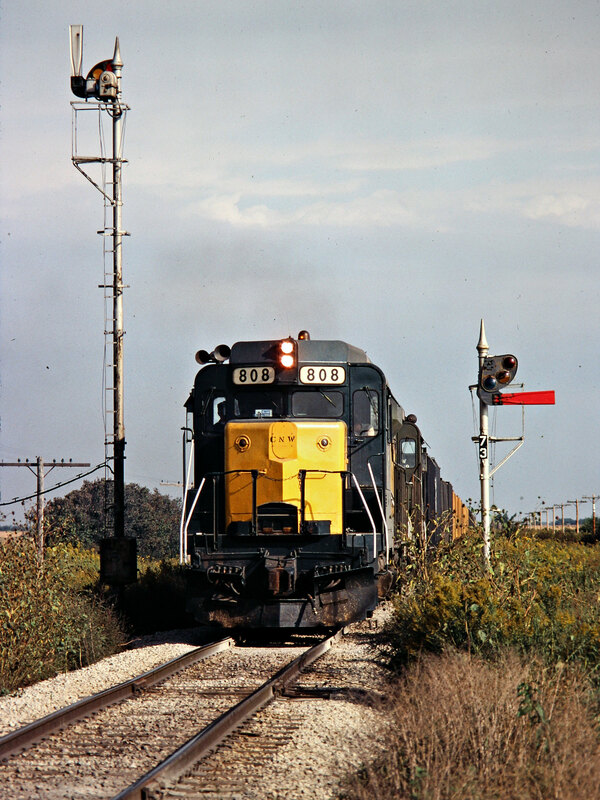 Westbound Chicago and North Western Railway ore train in Powers, Michigan, on September 2, 1973. 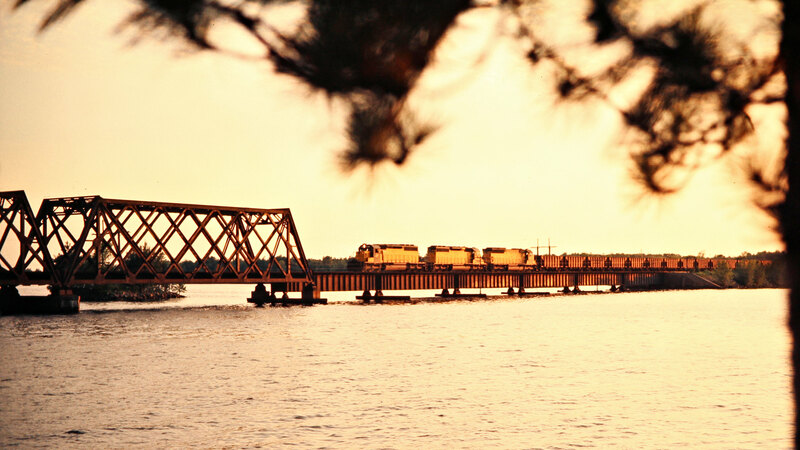 Photograph by John F. Bjorklund, © 2015, Center for Railroad Photography and Art. Bjorklund-24-07-09. 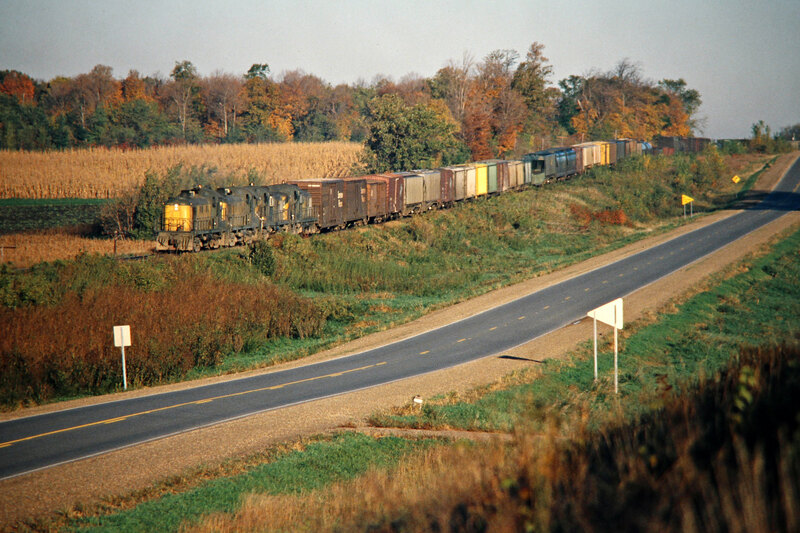 Westbound/Southbound Chicago and North Western Railway ore train in Bark River, Michigan, on September 2, 1973. 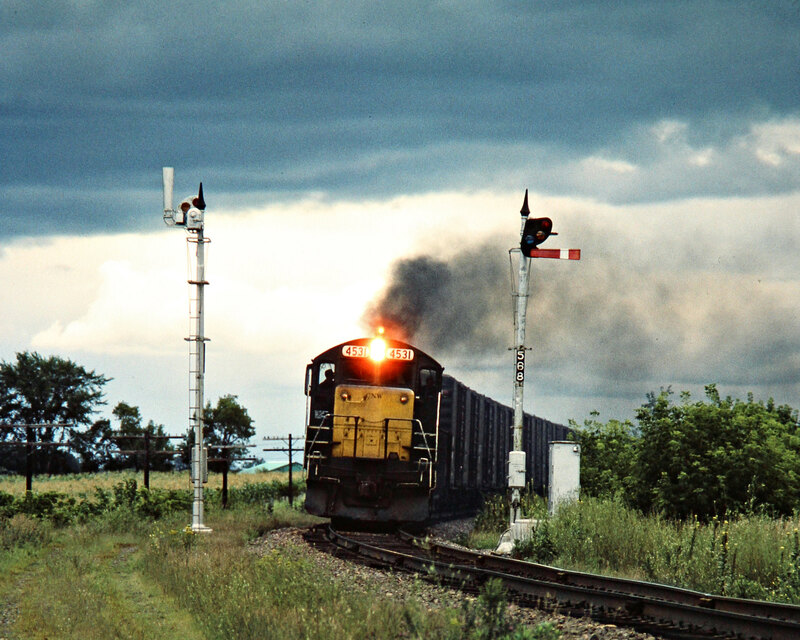 Photograph by John F. Bjorklund, © 2015, Center for Railroad Photography and Art. 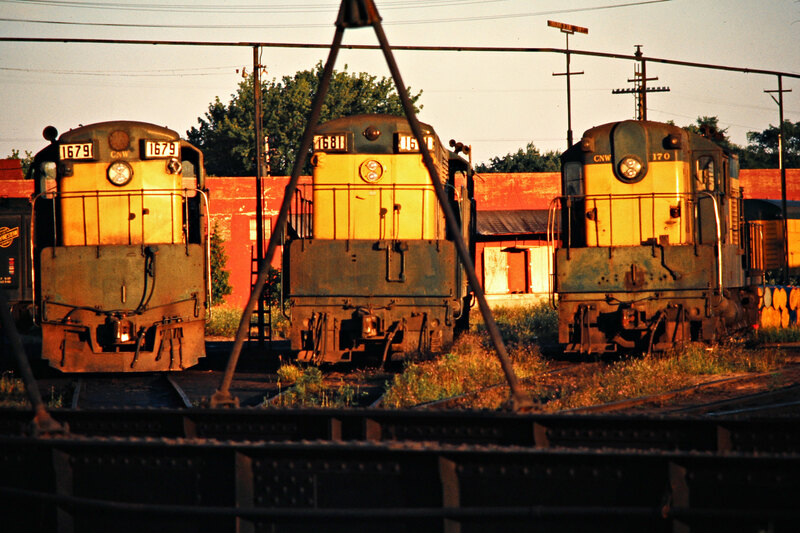 Bjorklund-24-08-10. 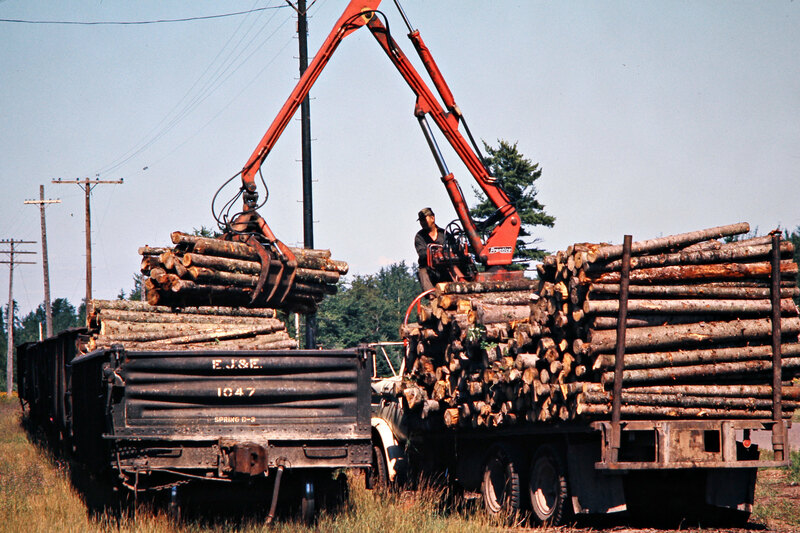 Loading timber along the Chicago and North Western Railway in Little Lake, Michigan, on August 17, 1974. 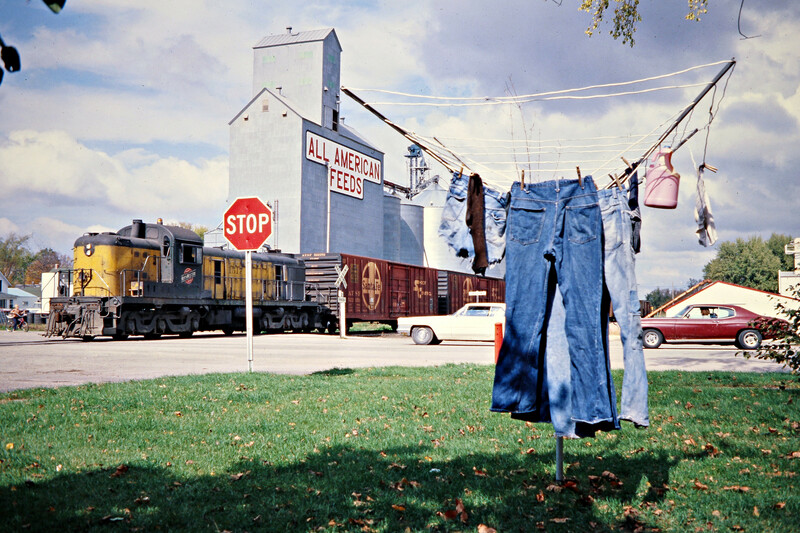 Photograph John F. Bjorklund, © 2015, Center for Railroad Photography and Art. 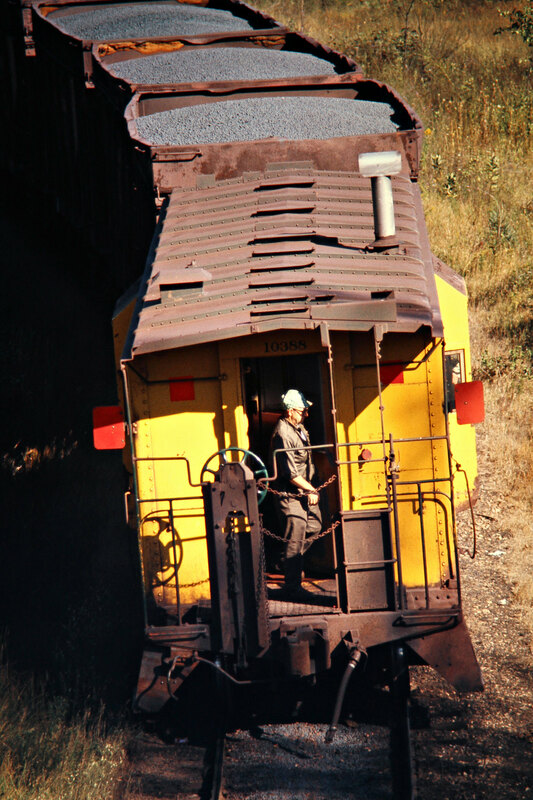 Bjorklund-24-09-03. 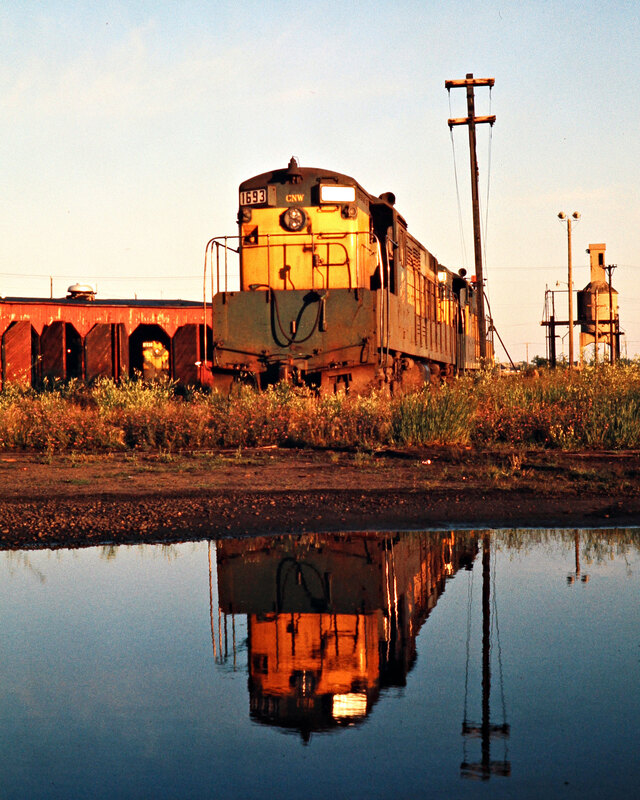 Chicago and North Western Railway reflection in Escanaba, Michigan, on August 17, 1974. 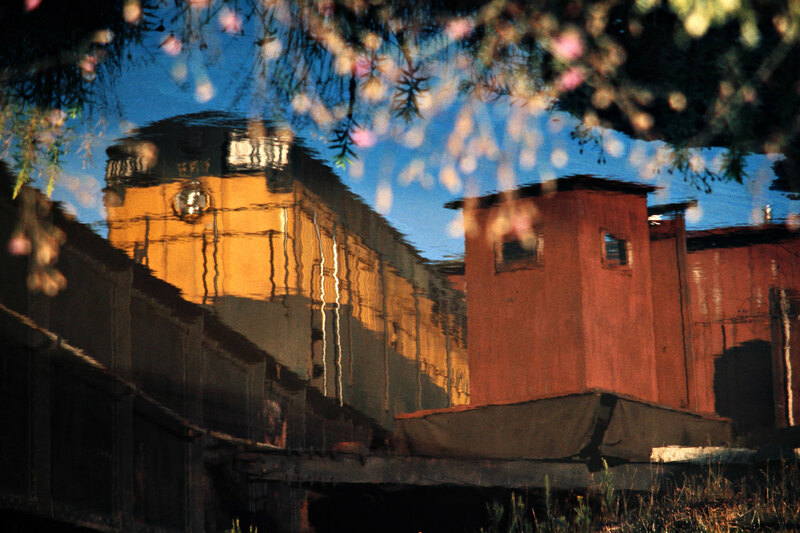 Photograph by John F. Bjorklund, © 2015, Center for Railroad Photography and Art. 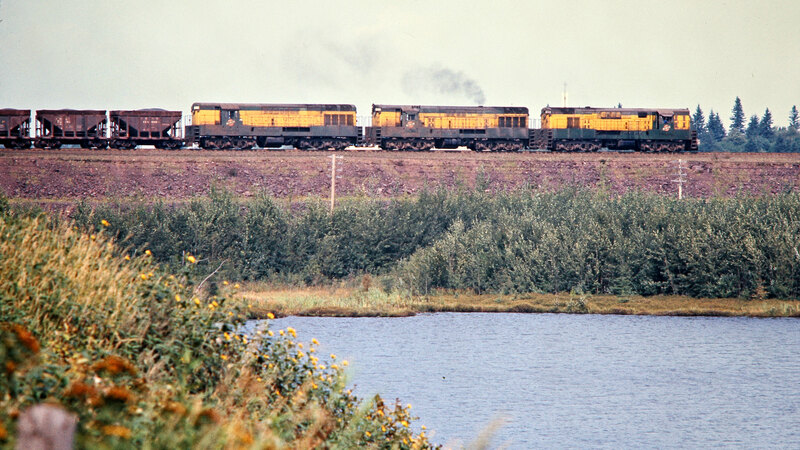 Bjorklund-24-09-05. 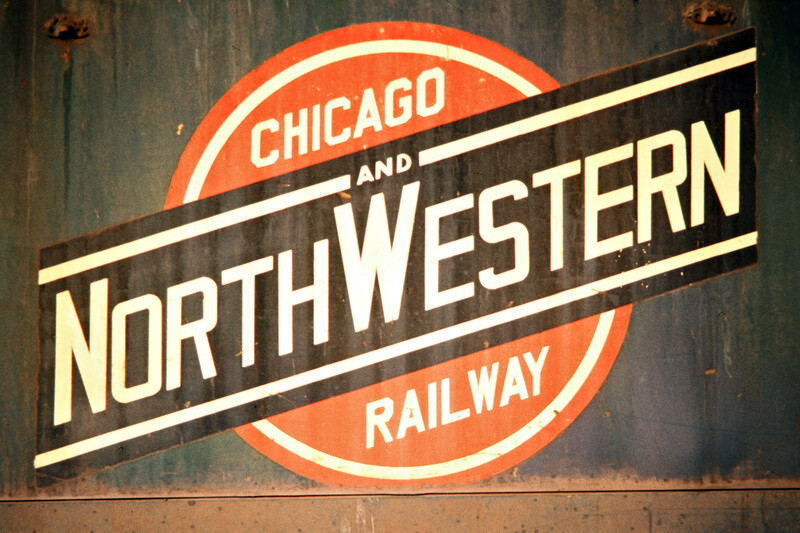 Chicago and North Western Railway Fairbanks-Morse locomotive no. 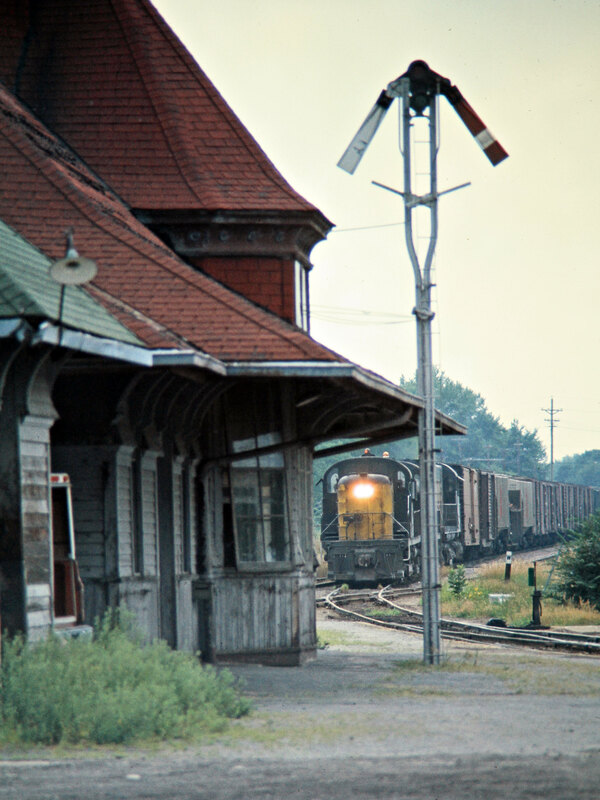 1693 at the roundhouse in Escanaba, Michigan, on August 17, 1974. 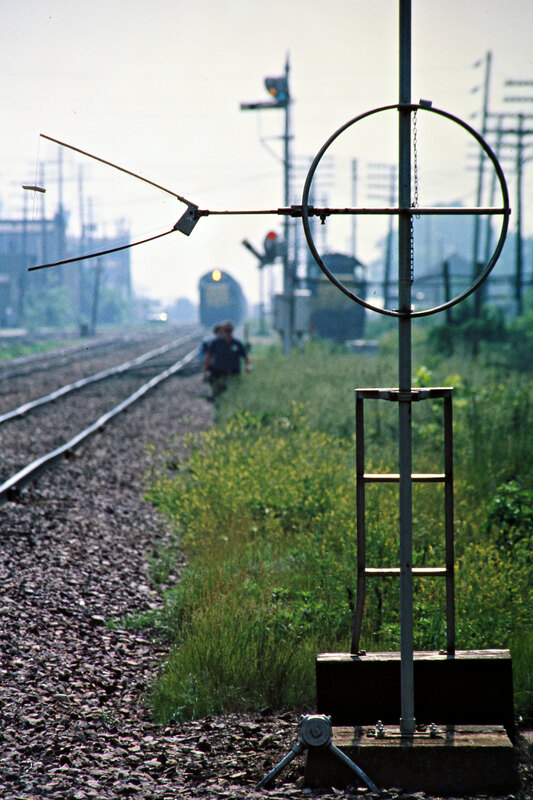 Photograph by John F. Bjorklund, © 2015, Center for Railroad Photography and Art. 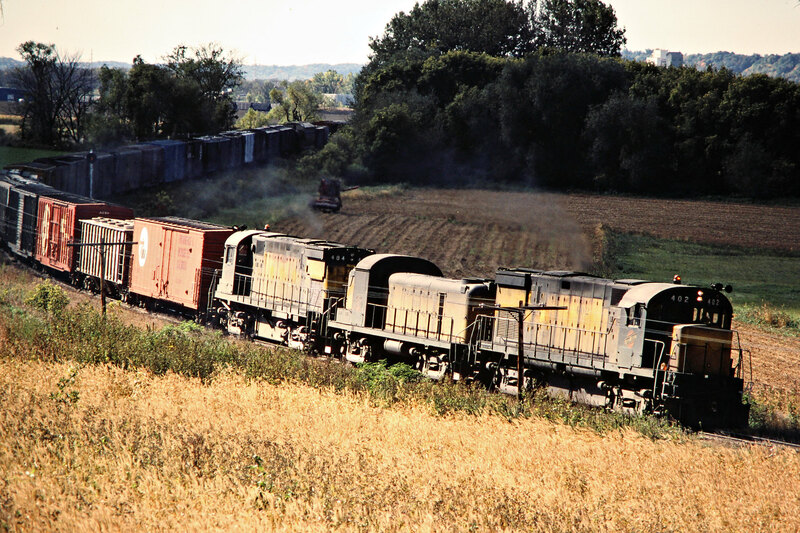 Bjorklund-24-09-07. 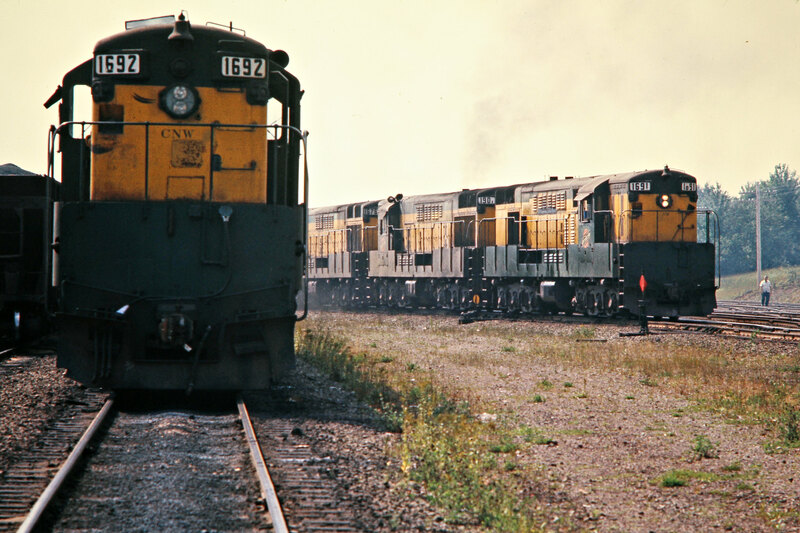 Chicago and North Western Railway Fairbanks-Morse locomotives at the roundhouse in Escanaba, Michigan, on August 17, 1974. 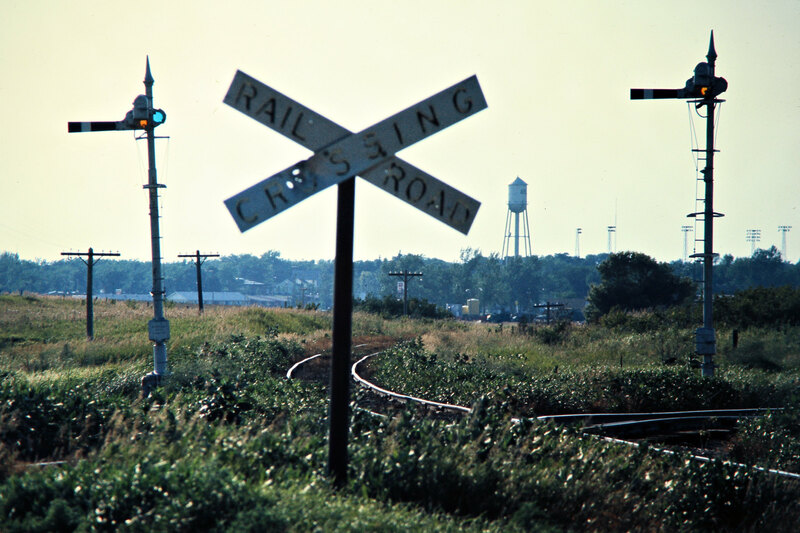 Photograph by John F. Bjorklund, © 2015, Center for Railroad Photography and Art. 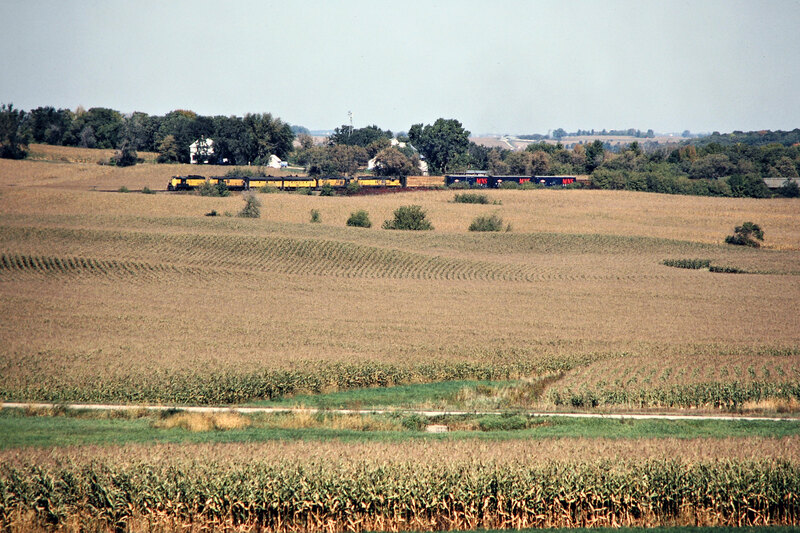 Bjorklund-24-09-13. 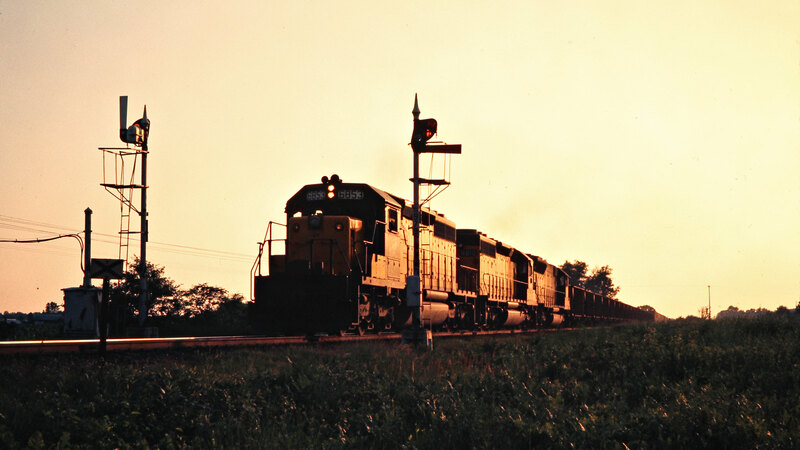 Eastbound Chicago and North Western Railway ore train in Powers, Michigan, on August 16, 1974. 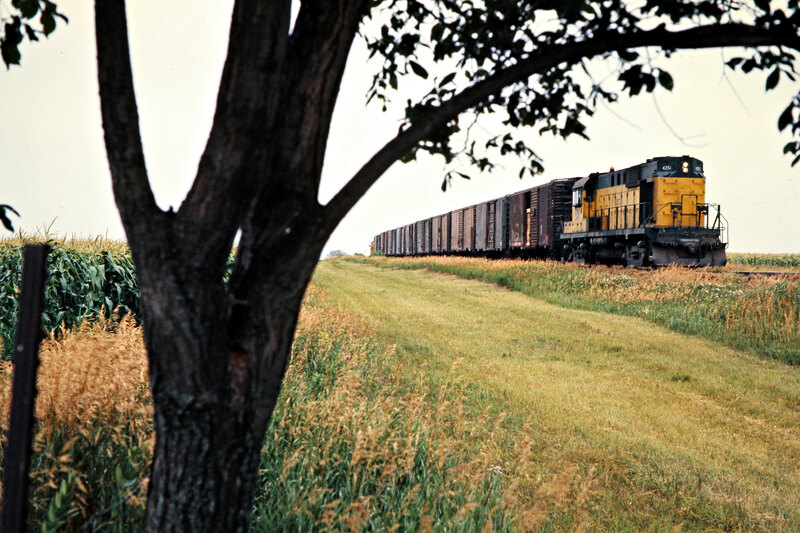 Photograph by John F. Bjorklund, © 2015, Center for Railroad Photography and Art. 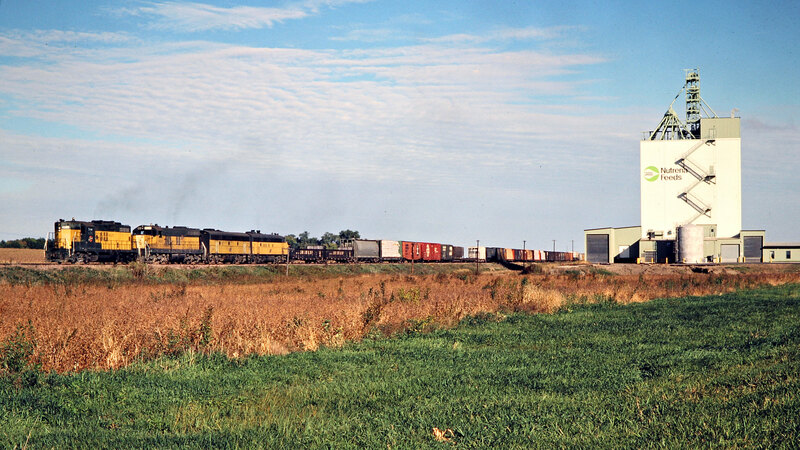 Bjorklund-24-09-14. 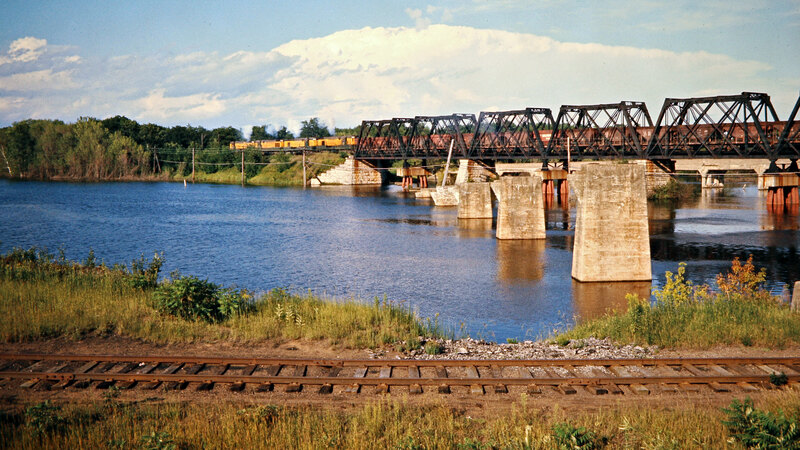 Westbound Chicago and North Western Railway ore train crossing Escanaba River near Escanaba, Michigan, on August 17, 1974. 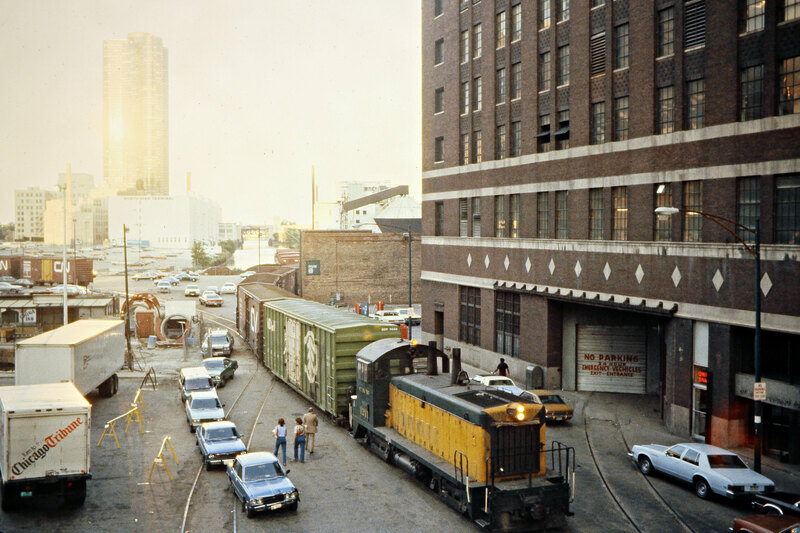 Photograph by John F. Bjorklund, © 2015, Center for Railroad Photography and Art. 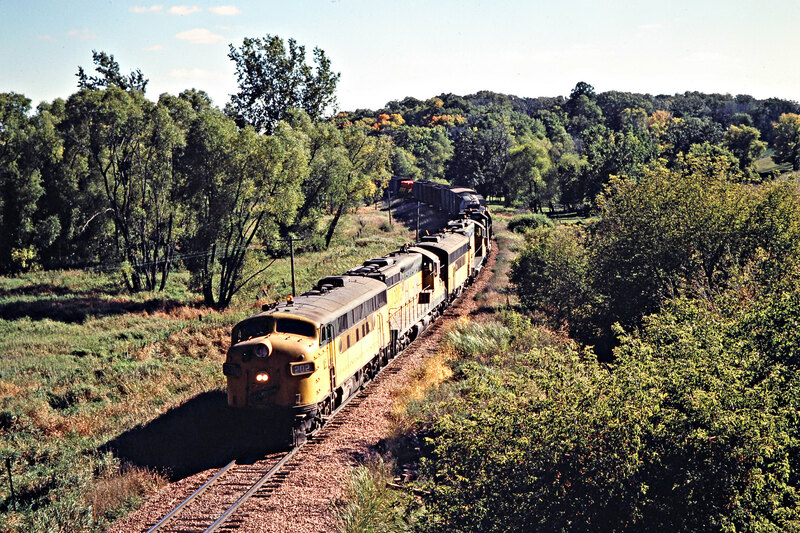 Bjorklund-24-10-02. 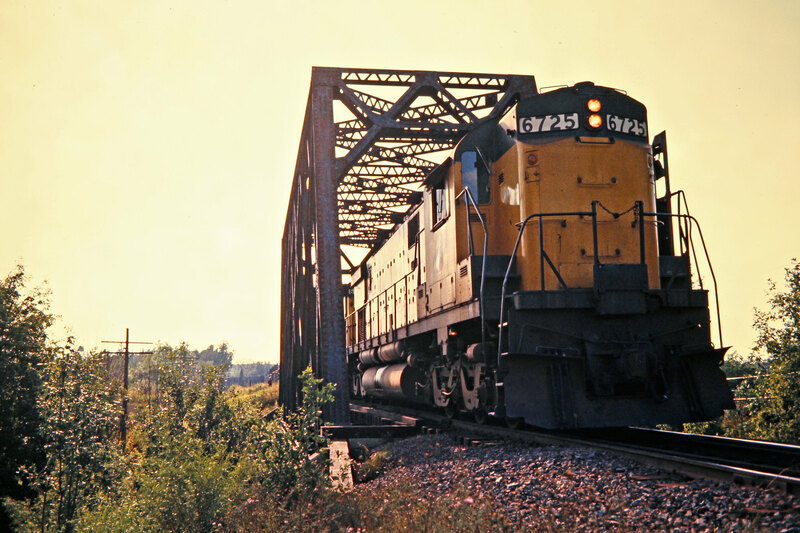 Westbound Chicago and North Western Railway ore train crossing Escanaba River near Escanaba, Michigan, on August 17, 1974. 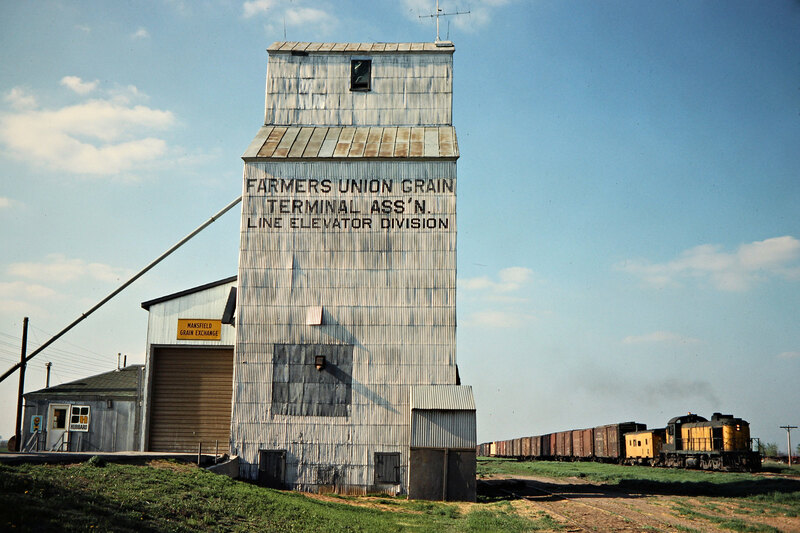 Photograph by John F. Bjorklund, © 2015, Center for Railroad Photography and Art. 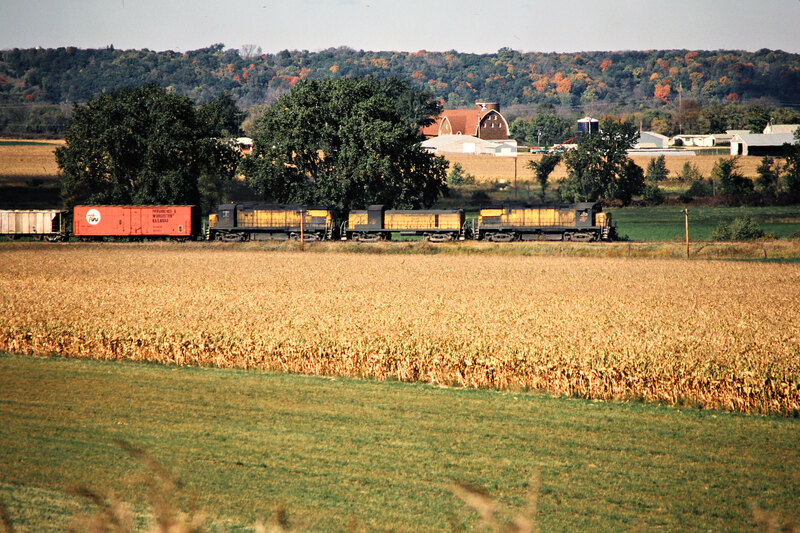 Bjorklund-24-10-04. 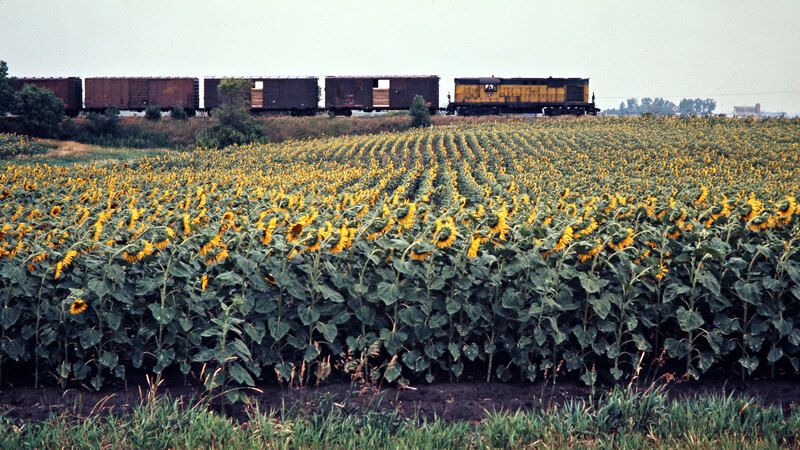 Eastbound Chicago and North Western Railway freight train near Campbell, Michigan, on August 17, 1974. 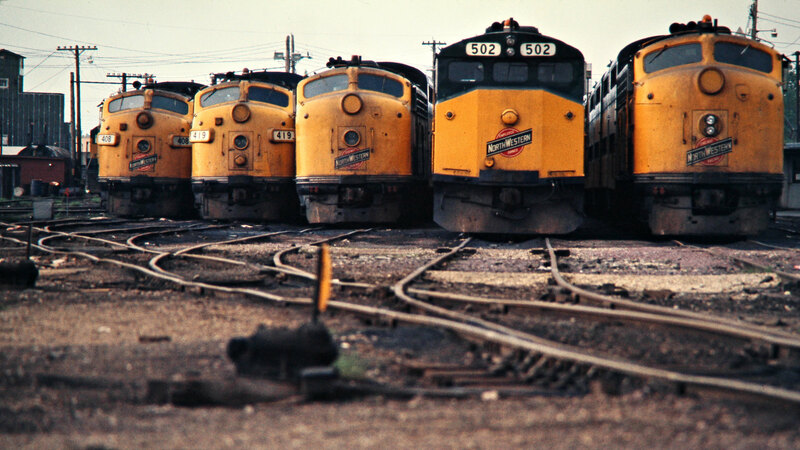 Photograph by John F. Bjorklund, © 2015, Center for Railroad Photography and Art. 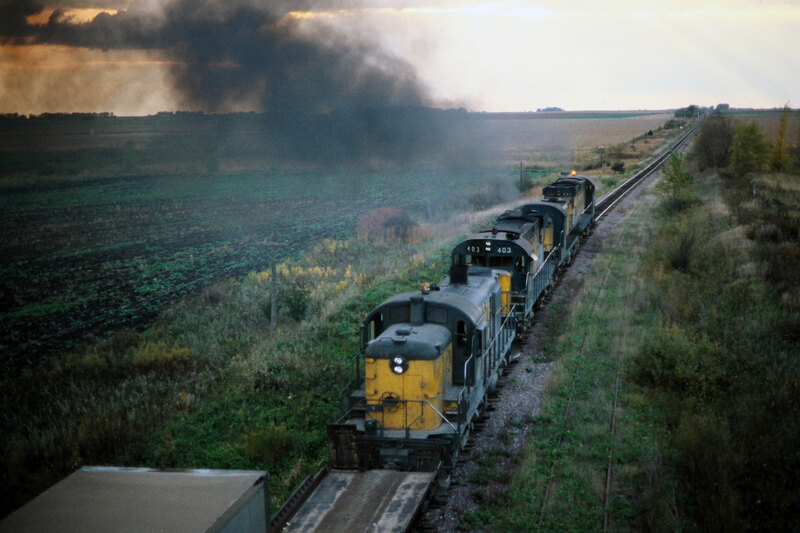 Bjorklund-24-10-16. 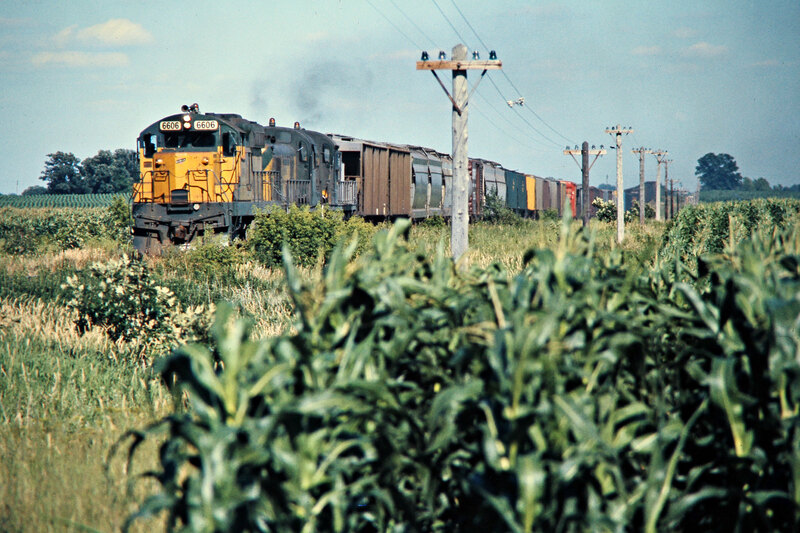 Westbound Chicago and North Western Railway freight train in Norway, Michigan, on August 18, 1974. 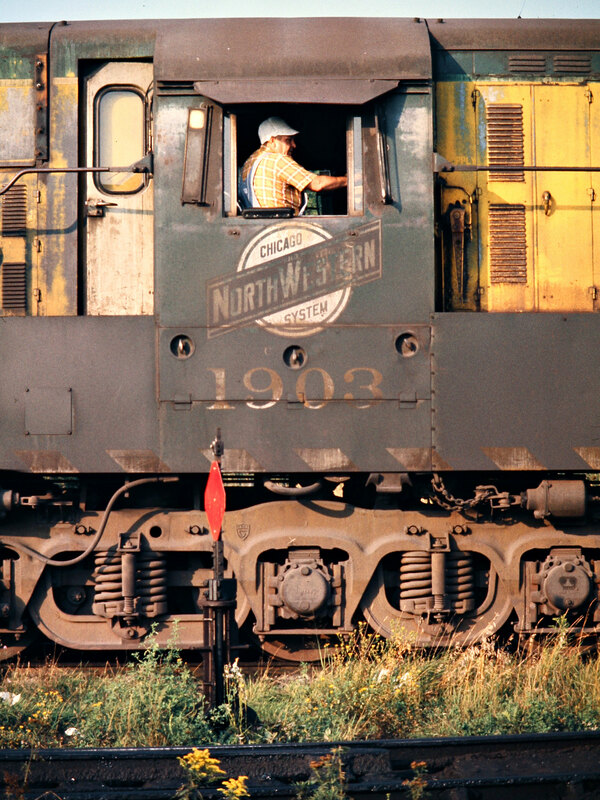 Photograph by John F. Bjorklund, © 2015, Center for Railroad Photography and Art. 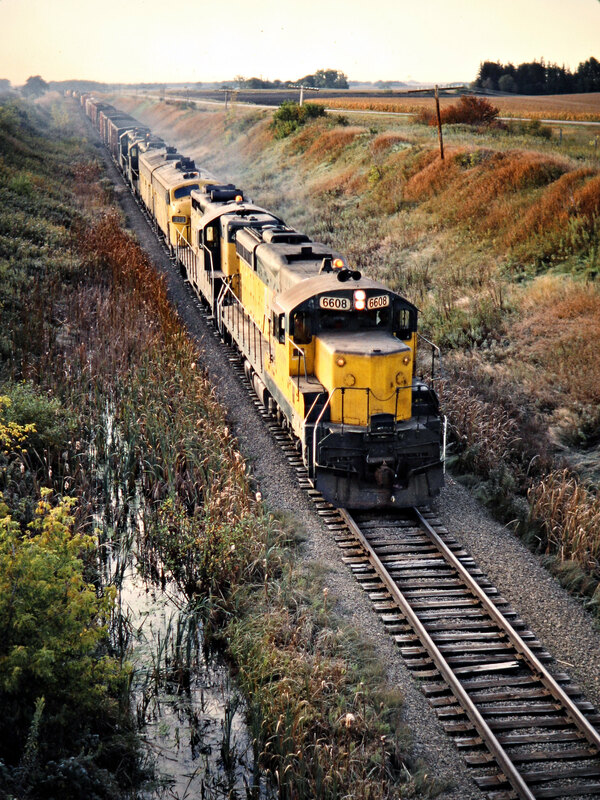 Bjorklund-24-11-10. 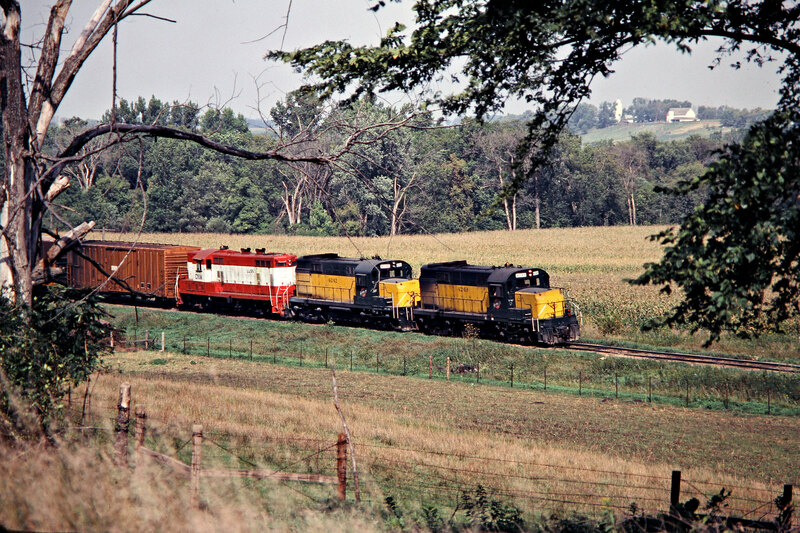 Westbound Chicago and North Western Railway freight train near Rock, Michigan, on August 17, 1974. 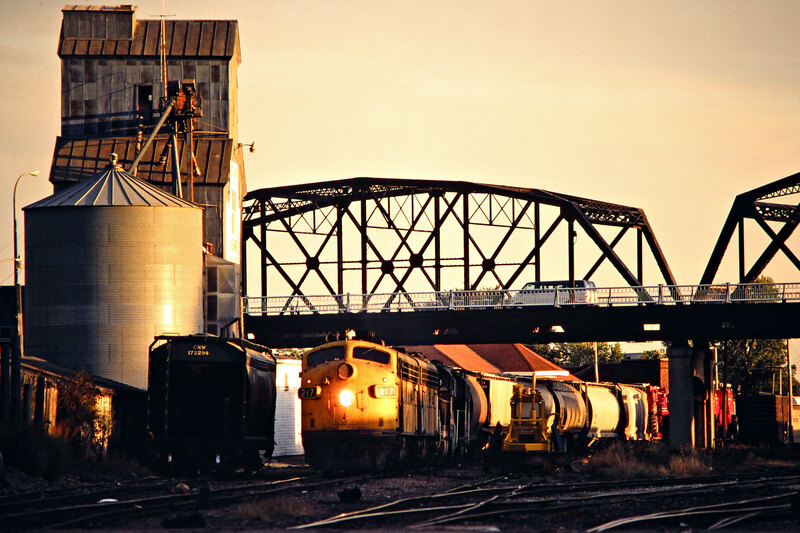 Photograph by John F. Bjorklund, © 2015, Center for Railroad Photography and Art. 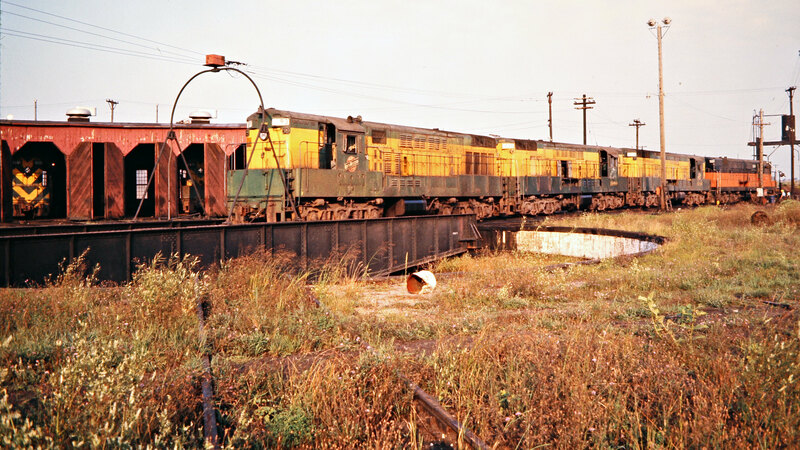 Bjorklund-24-11-20. 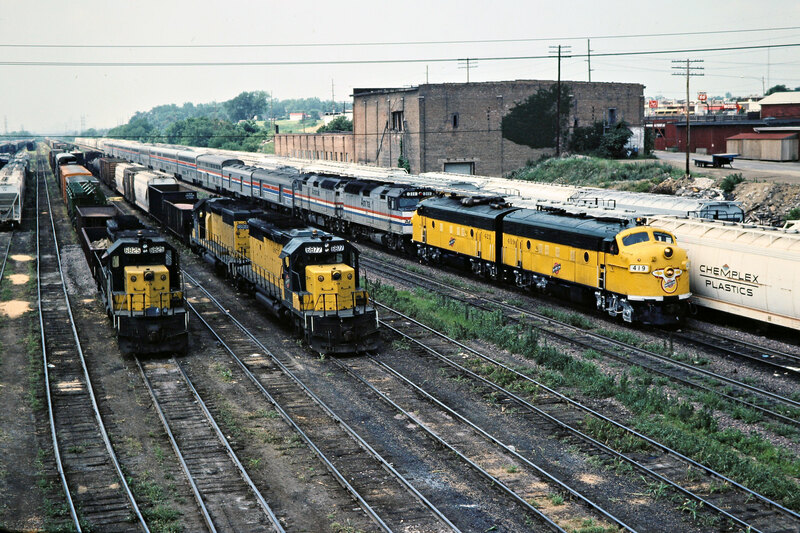 Lineup of Chicago and North Western Railway locomotives in Waukegan, Illinois, on May 26, 1975. 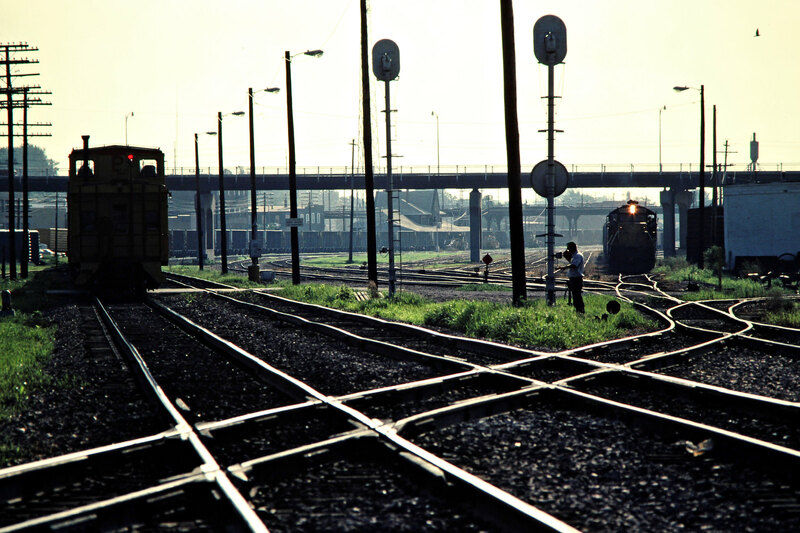 Photograph by John F. Bjorklund, © 2015, Center for Railroad Photography and Art. 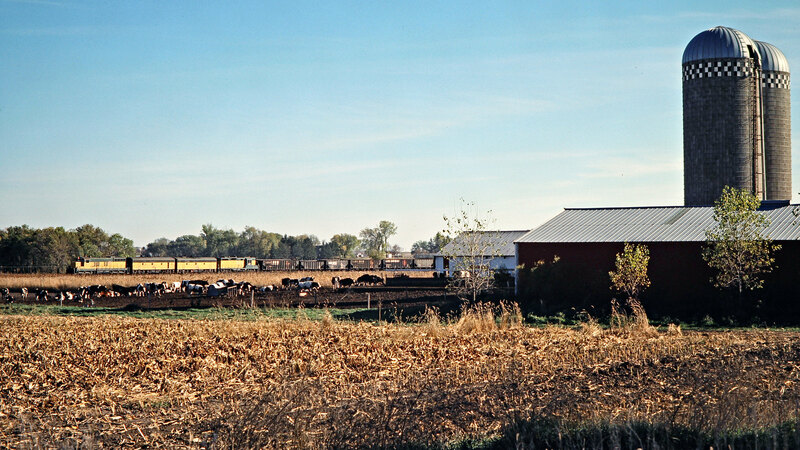 Bjorklund-24-13-04. 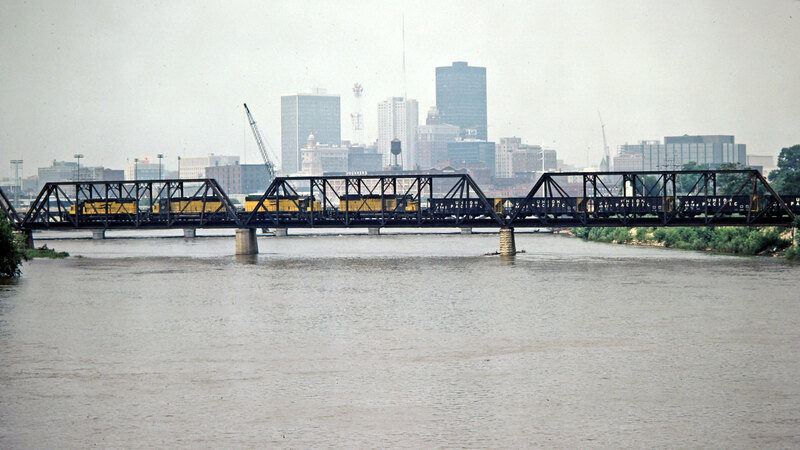 Eastbound Chicago and North Western Railway freight train crossing bridge over the Wisconsin River near Dellwood, Wisconsin, on July 4, 1975. 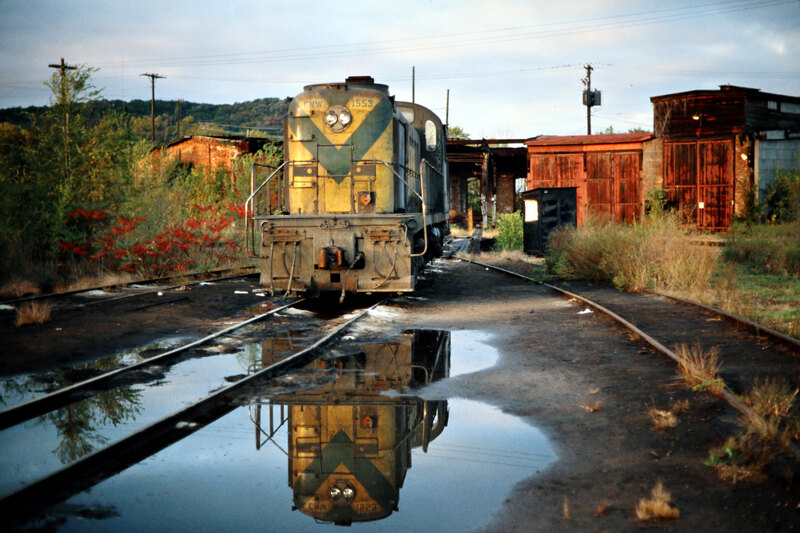 Photograph by John F. Bjorklund, © 2015, Center for Railroad Photography and Art. 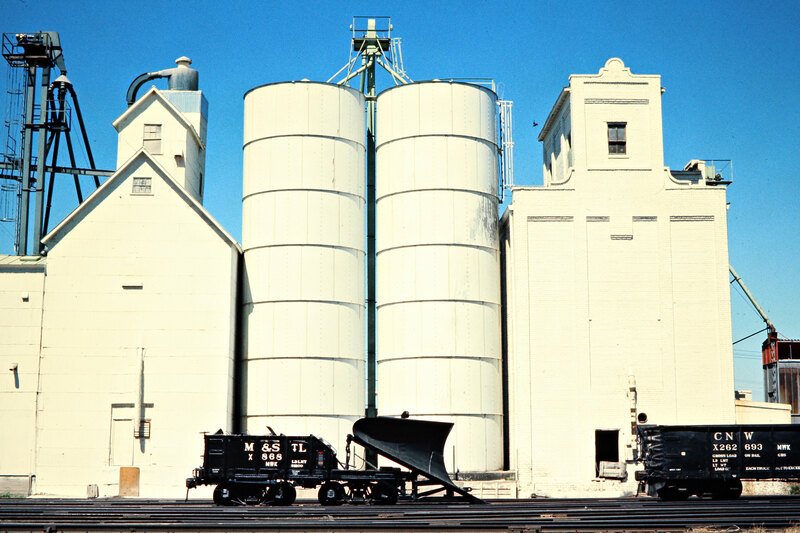 Bjorklund-24-14-19. 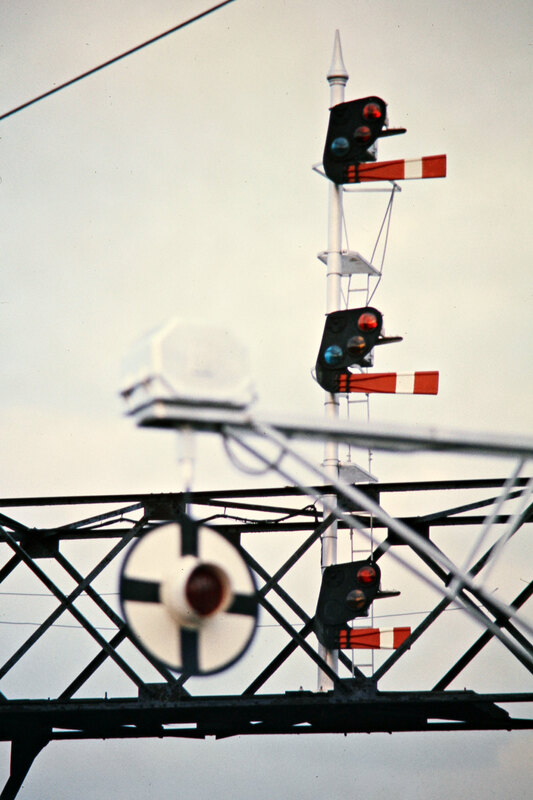 Chicago and North Western Railway semaphore signals and wig-wag in Wyeville, Wisconsin, on July 5, 1975. 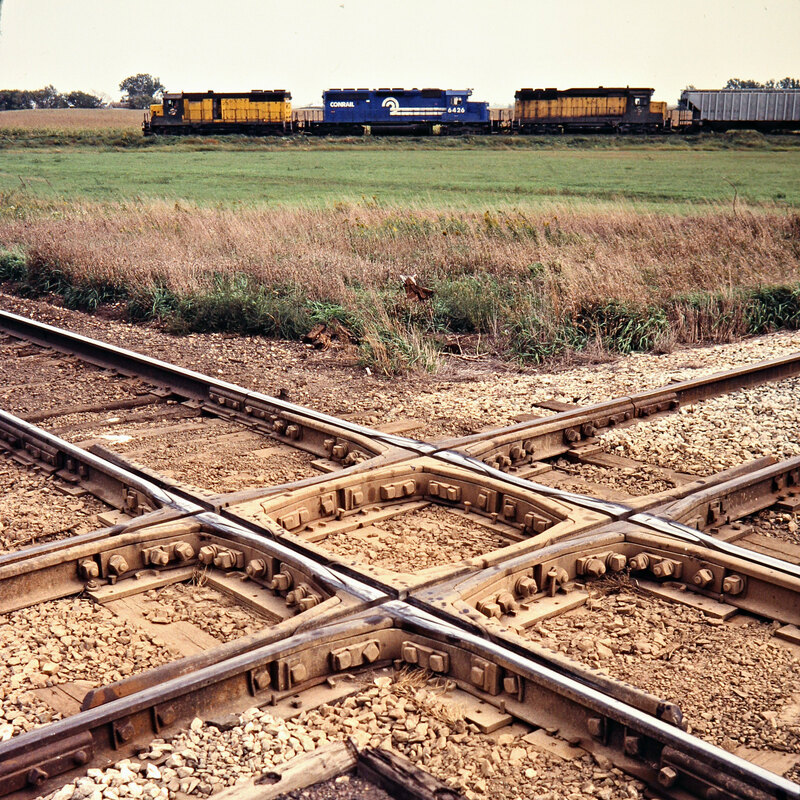 Photograph by John F. Bjorklund, © 2015, Center for Railroad Photography and Art. 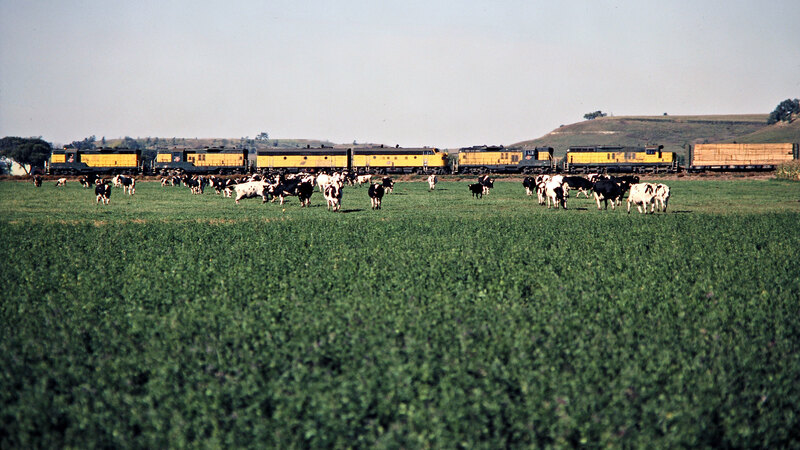 Bjorklund-24-14-19. 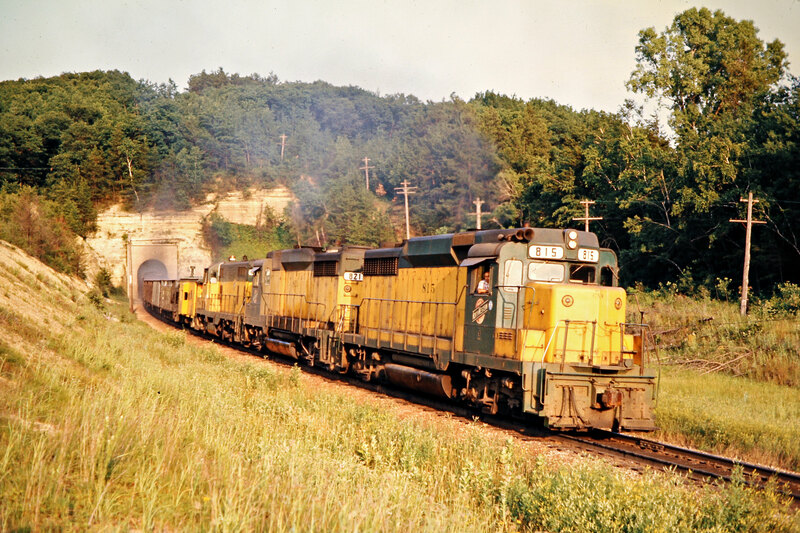 Westbound Chicago and North Western Railway freight train passing through tunnel in Tunnel City, Wisconsin, on July 5, 1975. 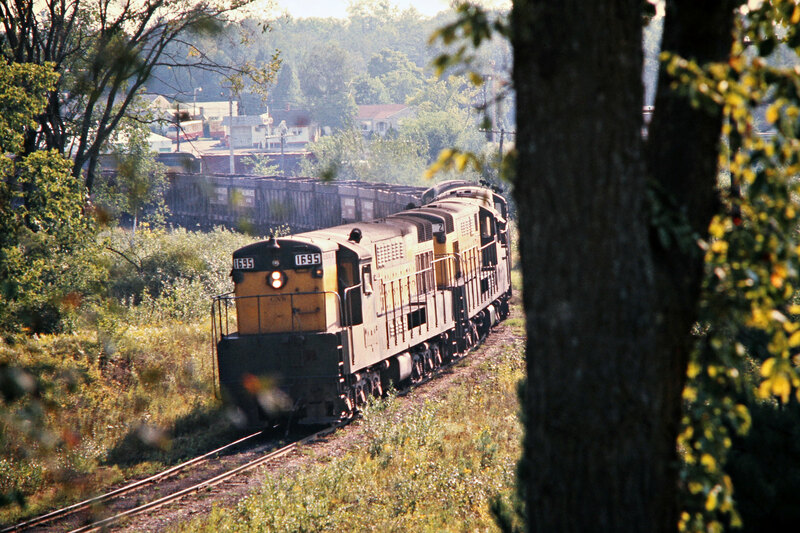 Photograph by John F. Bjorklund, © 2015, Center for Railroad Photography and Art. Bjorklund-24-15-12. 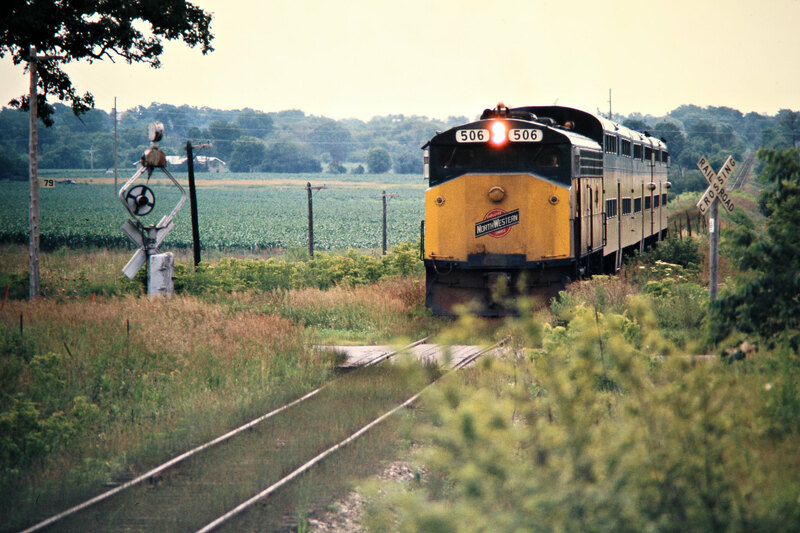 Westbound Chicago and North Western Railway passenger train near Genoa City, Wisconsin, on July 6, 1975. 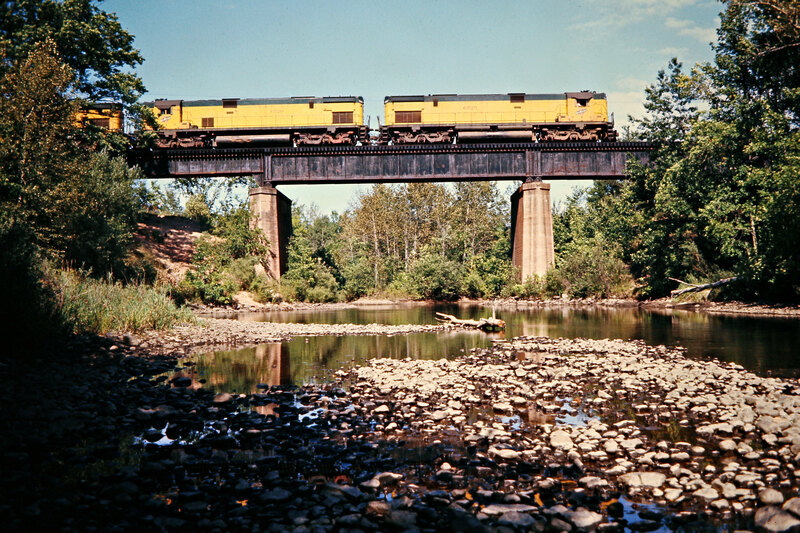 Photograph by John F. Bjorklund, © 2015, Center for Railroad Photography and Art. 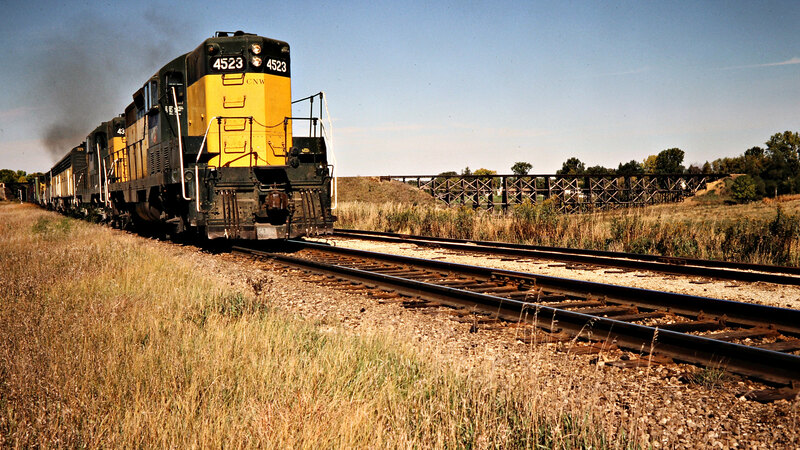 Bjorklund-24-16-10. 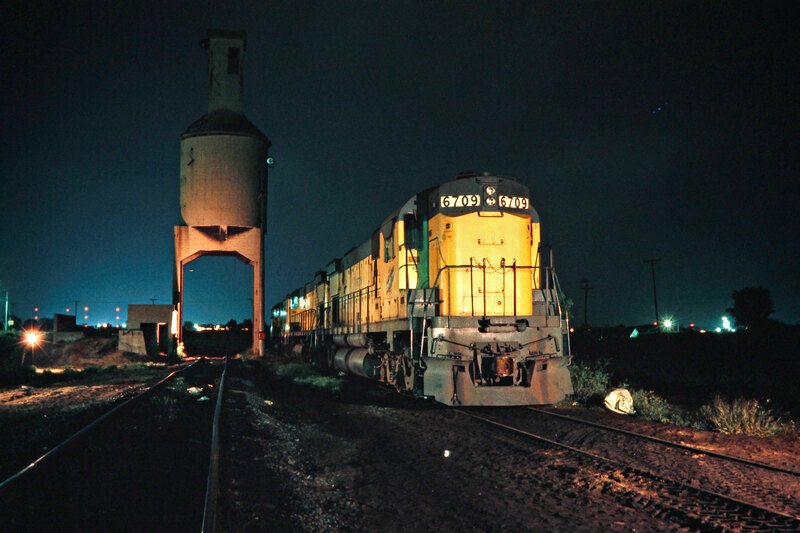 Chicago and North Western Railway Alco locomotives at night next to the coaling tower in Escanaba, Michigan, on August 23, 1975. 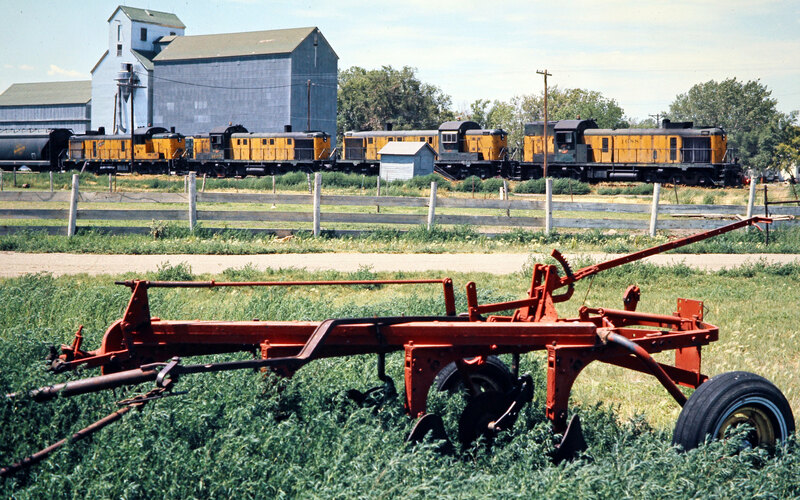 Photograph by John F. Bjorklund, © 2015, Center for Railroad Photography and Art. Bjorklund-24-17-11. 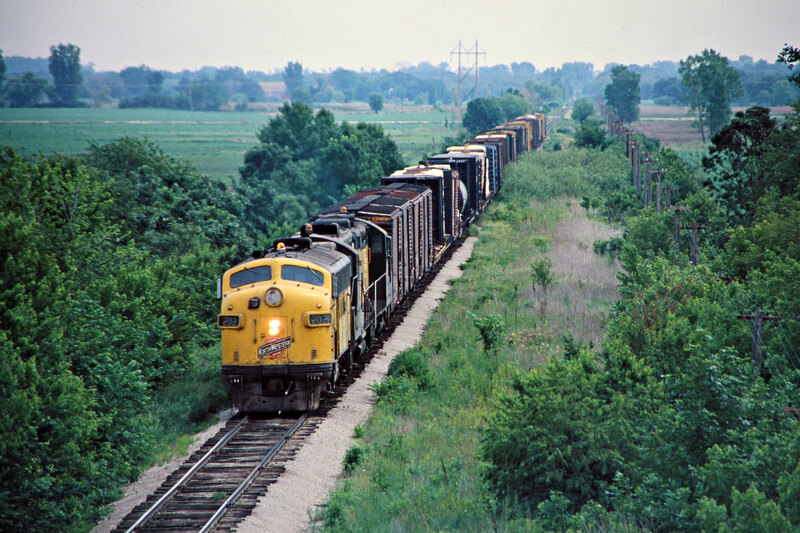 Eastbound Chicago and North Western Railway ore train in Powers, Michigan, on August 24, 1975. 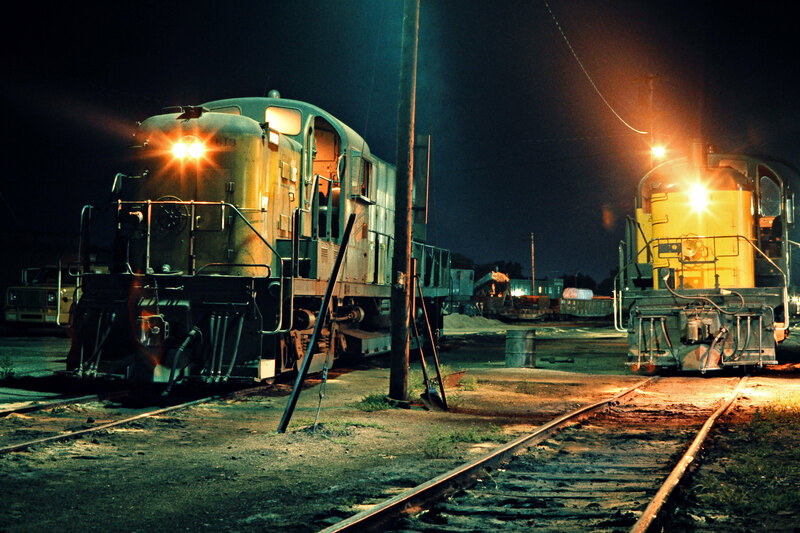 Photograph by John F. Bjorklund, © 2015, Center for Railroad Photography and Art. 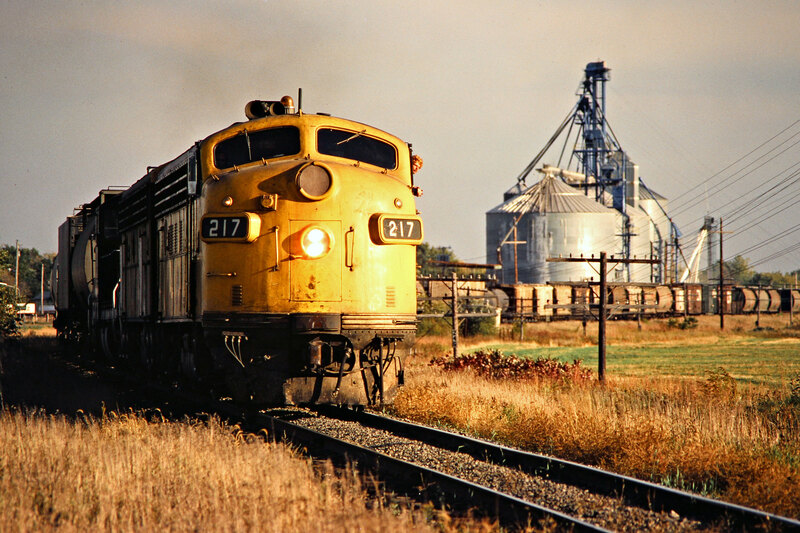 Bjorklund-24-20-10. 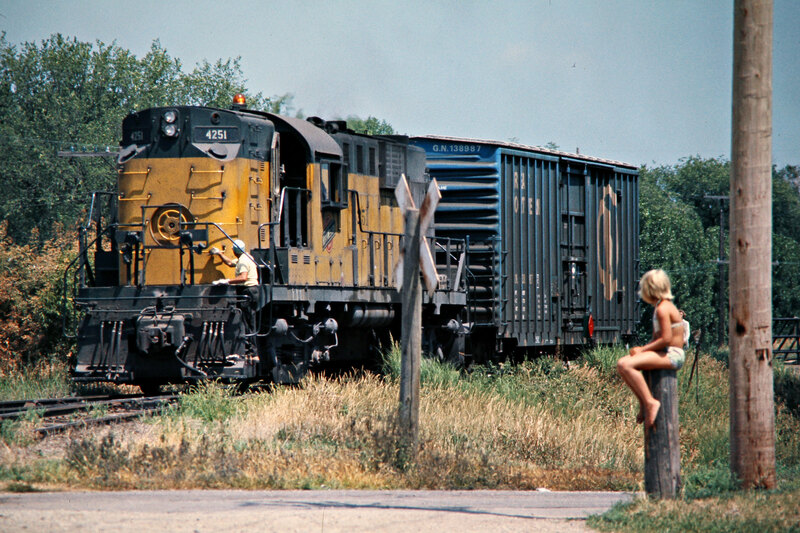 Caboose on an eastbound Chicago and North Western Railway ore train in Powers, Michigan, on August 24, 1975. 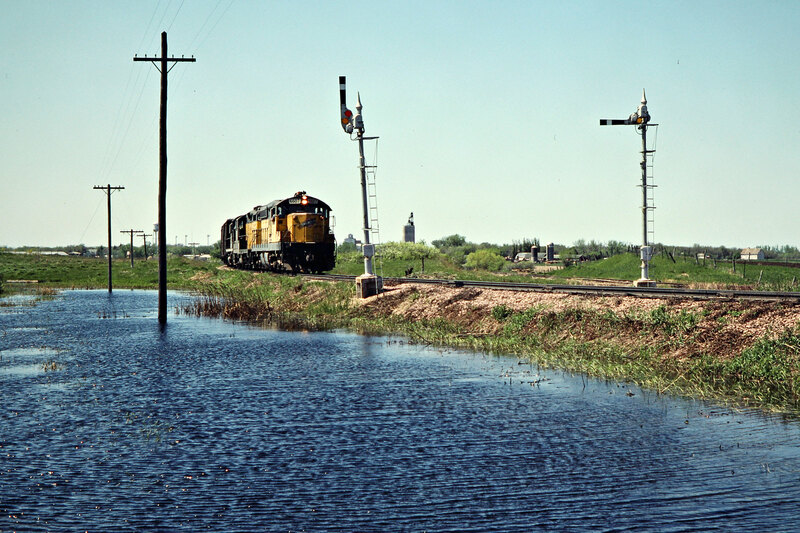 Photograph by John F. Bjorklund, © 2015, Center for Railroad Photography and Art. 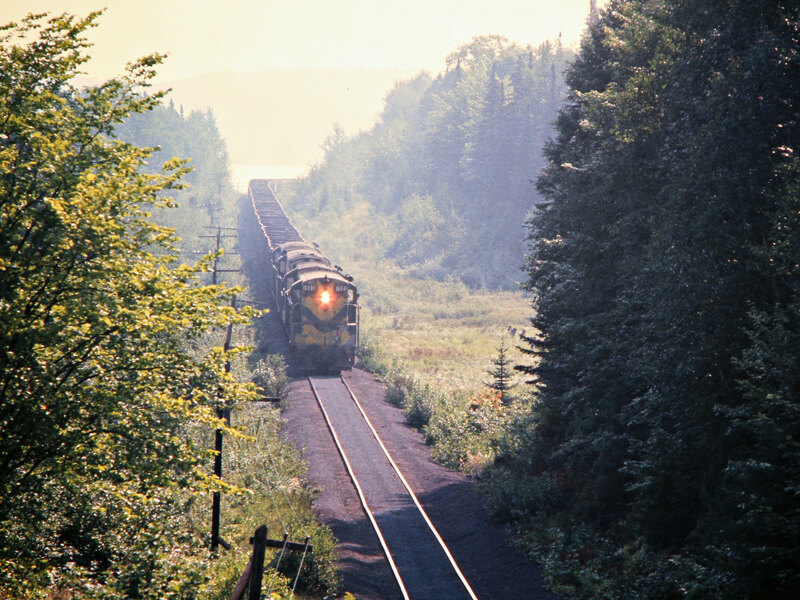 Bjorklund-24-20-12. 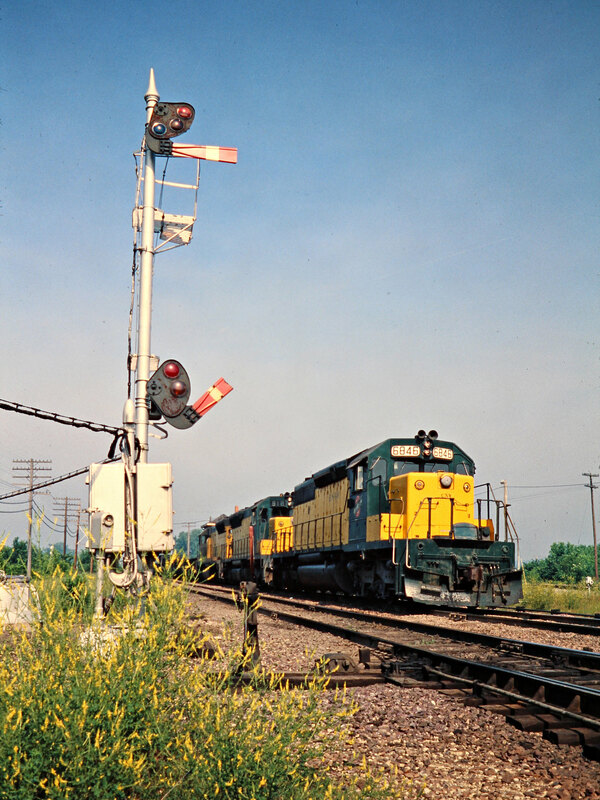 Eastbound Chicago and North Western Railway ore train with Alco locomotives at SOO crossing in Hermansville, Michigan, on August 24, 1975. 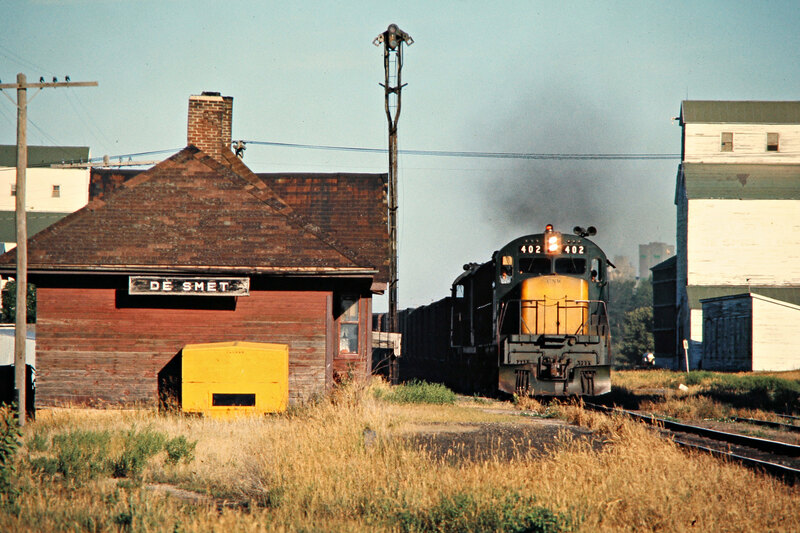 Photograph by John F. Bjorklund, © 2015, Center for Railroad Photography and Art. Bjorklund-24-20-16. 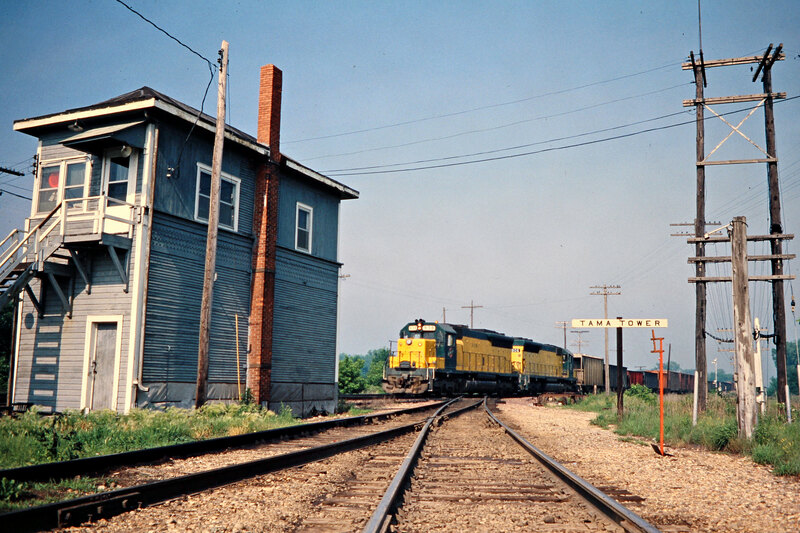 Southbound Chicago and North Western Railway freight train passing through Dennison, Minnesota, on July 17, 1976. 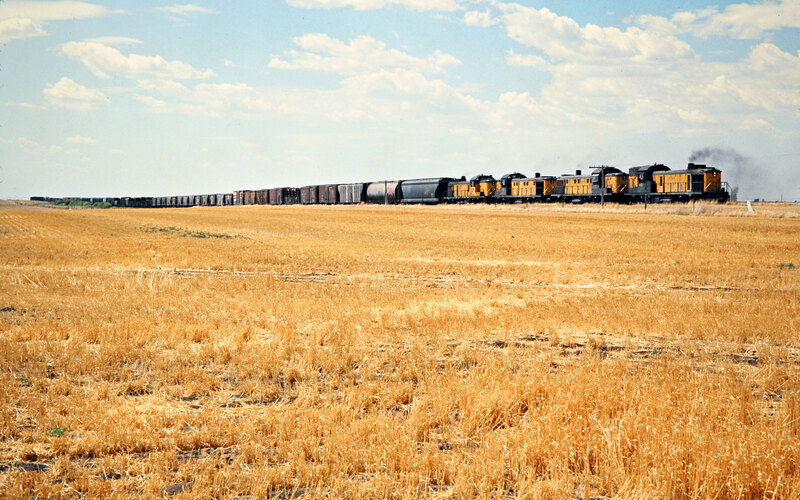 Photograph by John F. Bjorklund, © 2015, Center for Railroad Photography and Art. 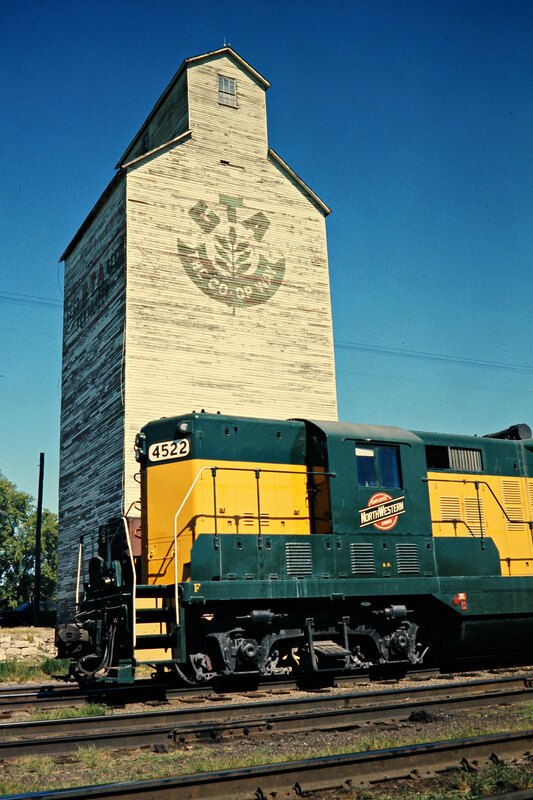 Bjorklund-24-24-10. 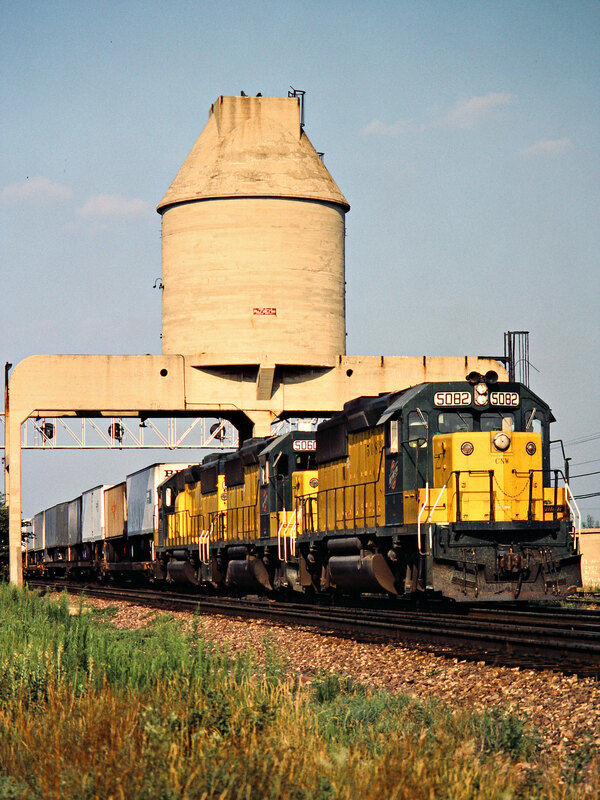 Southbound Chicago and North Western Railway and grain elevator in Randolph, Minnesota, on July 17, 1976. 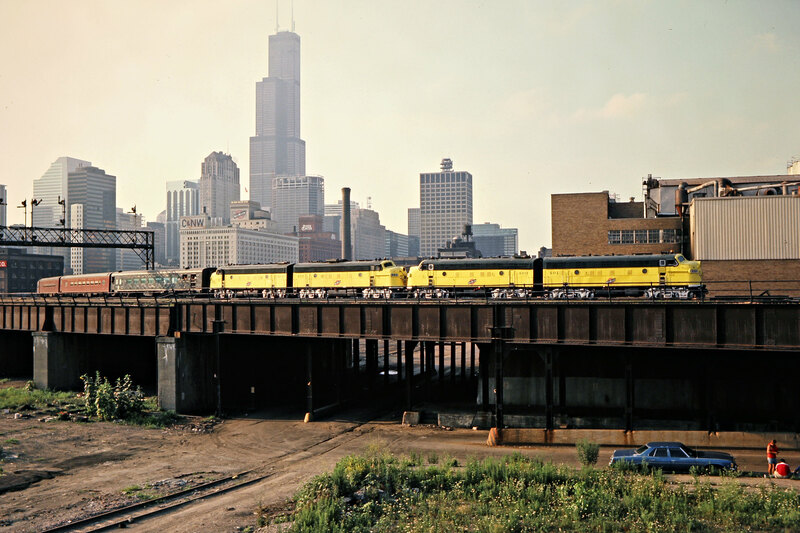 Photograph by John F. Bjorklund, © 2015, Center for Railroad Photography and Art. Bjorklund-24-24-16. 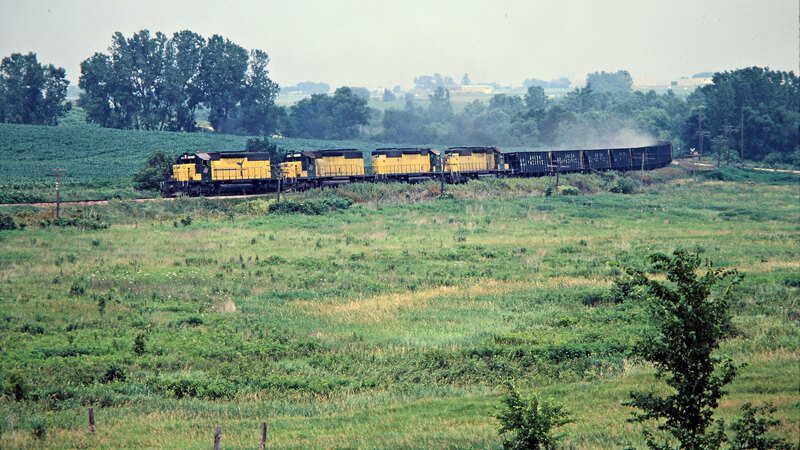 Westbound Chicago and North Western Railway freight train near Claremont, Minnesota, on July 17, 1976. 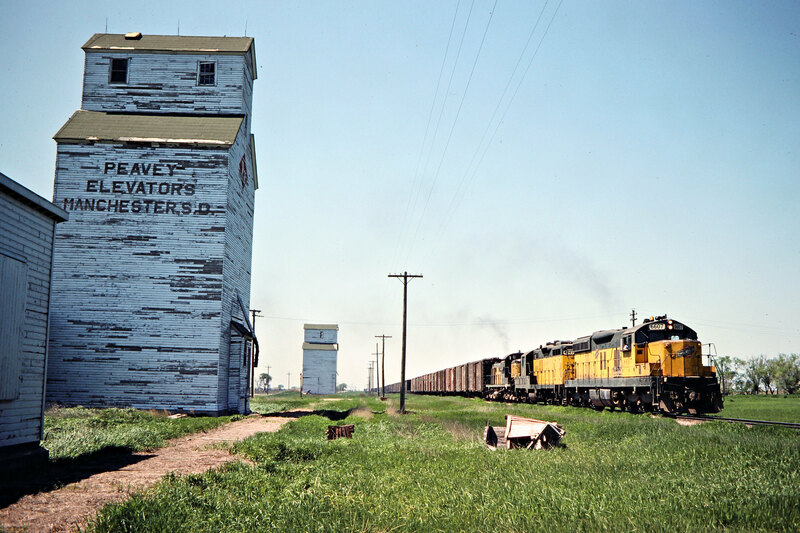 Photograph by John F. Bjorklund, © 2015, Center for Railroad Photography and Art. 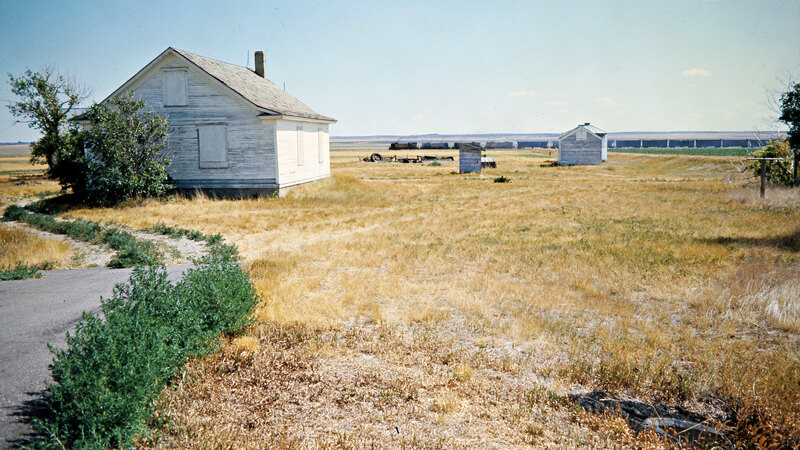 Bjorklund-24-25-02. 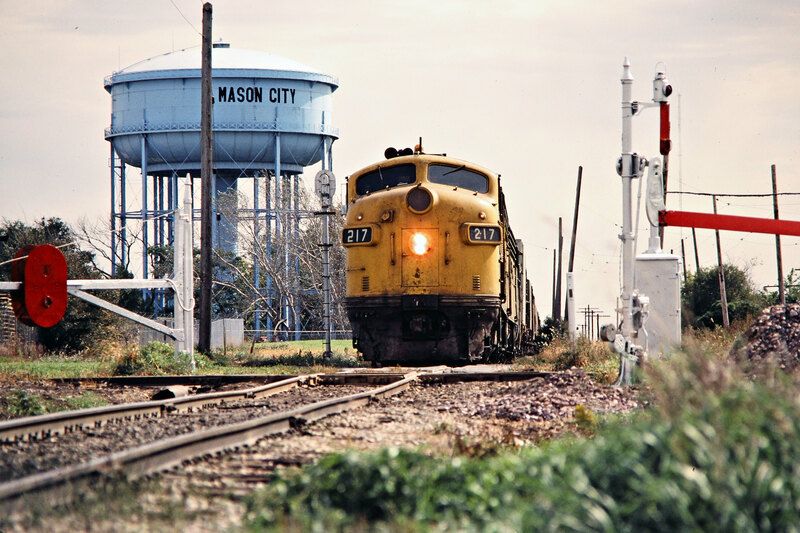 Northbound Chicago and North Western Railway freight train in Kenyon, Minnesota, on July 26, 1976. 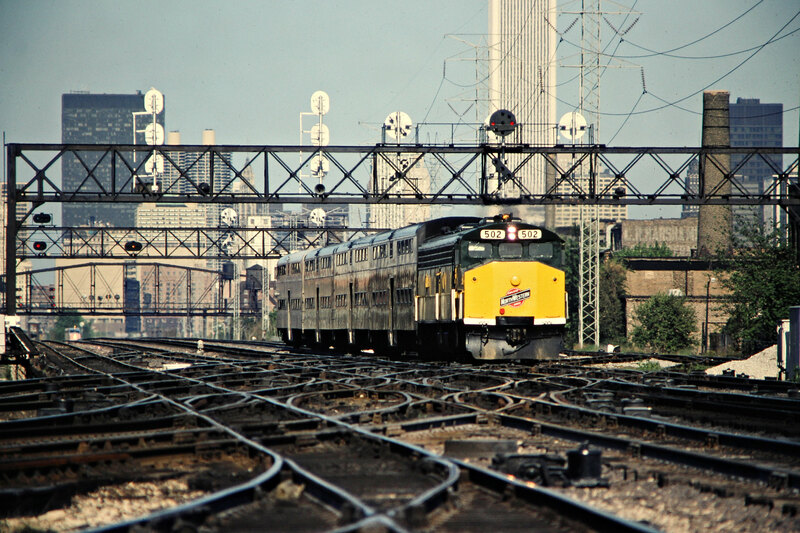 Photograph by John F. Bjorklund, © 2015, Center for Railroad Photography and Art. 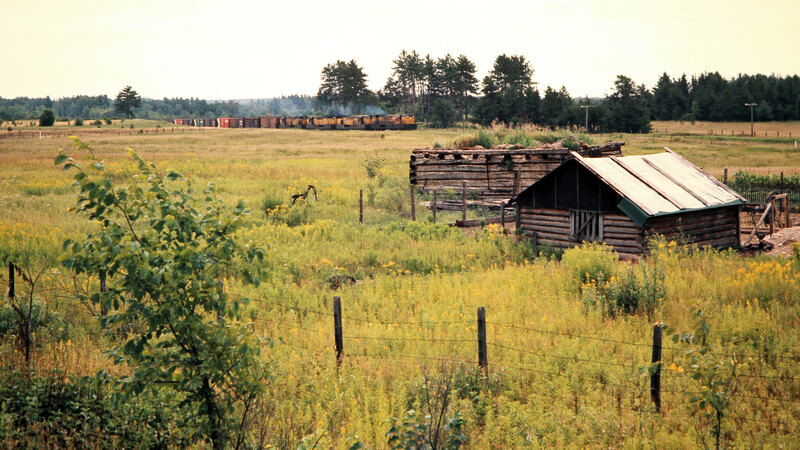 Bjorklund-24-27-02. 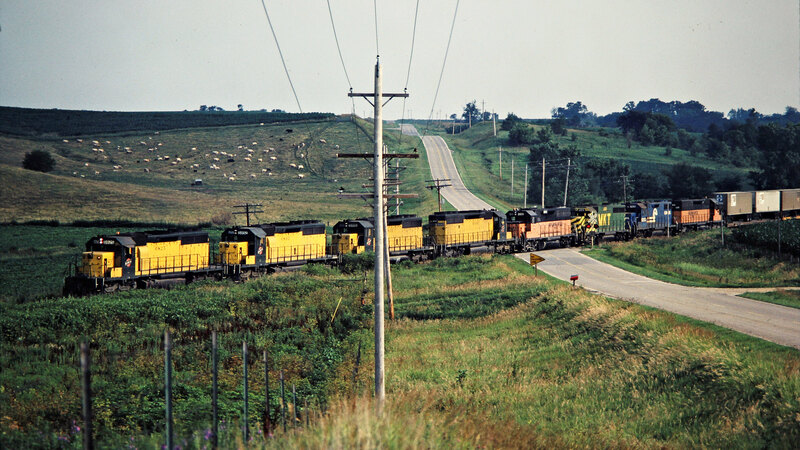 Northbound Chicago and North Western Railway freight train near Sargeant, Minnesota, on July 20, 1976. 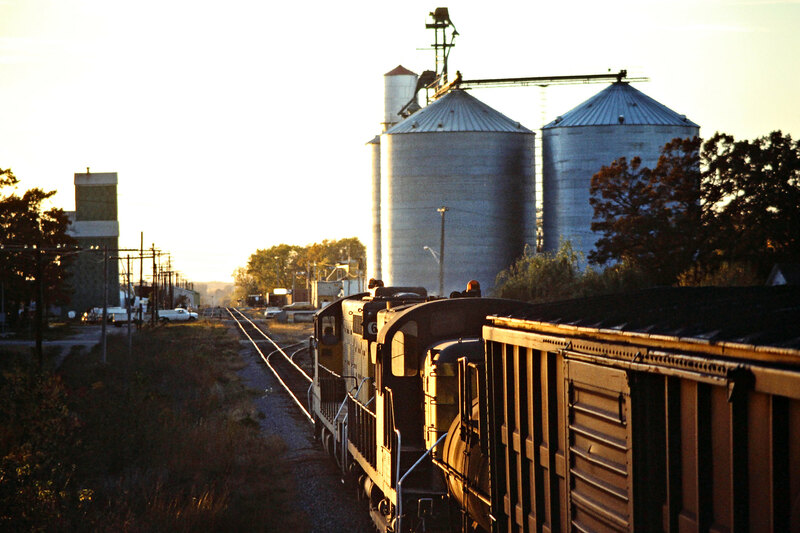 Photograph by John F. Bjorklund, © 2015, Center for Railroad Photography and Art. 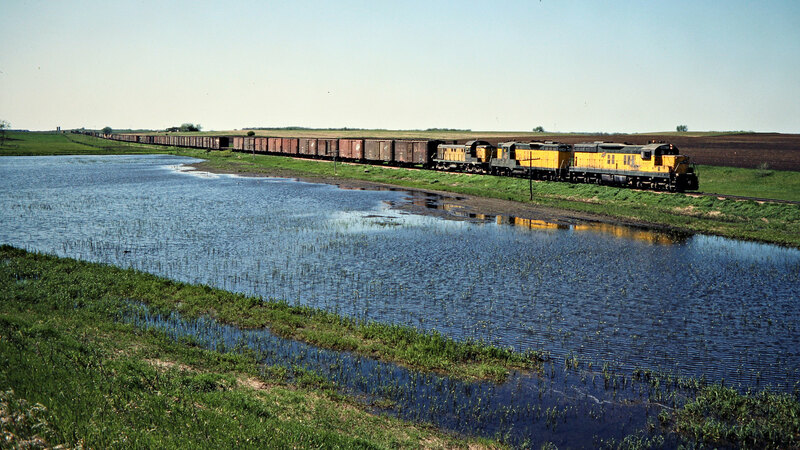 Bjorklund-24-27-13. 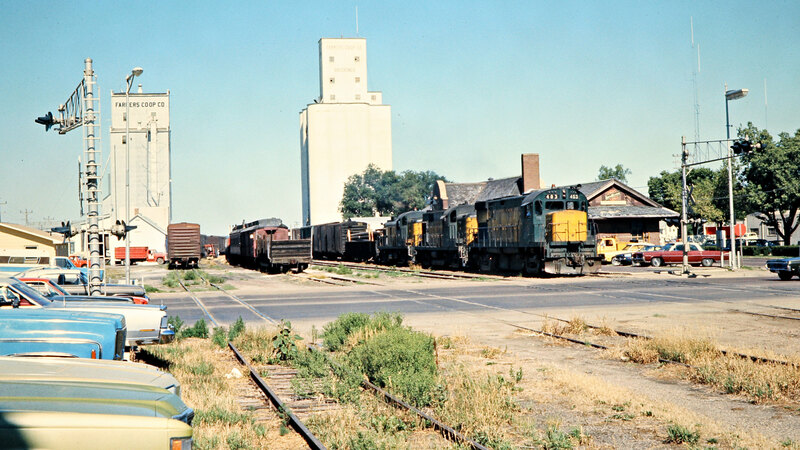 Westbound Chicago and North Western Railway freight train at station in Qwatonna, Minnesota, on July 21, 1976. 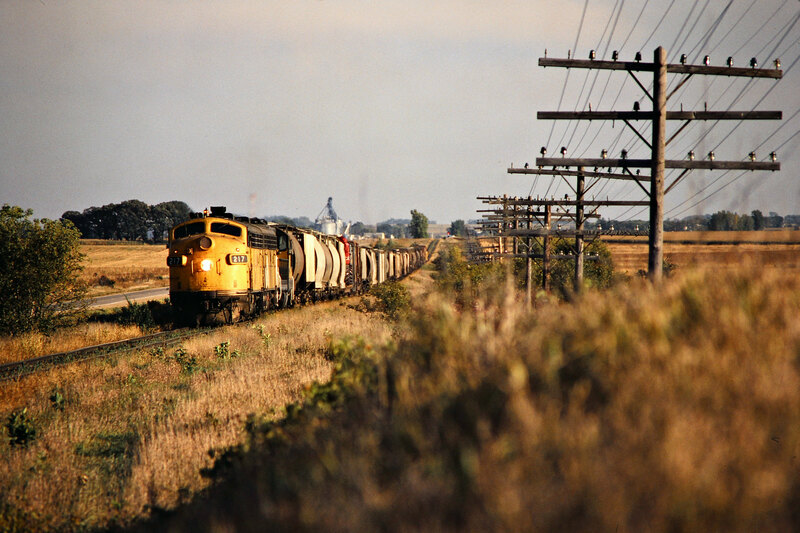 Photograph by John F. Bjorklund, © 2015, Center for Railroad Photography and Art. 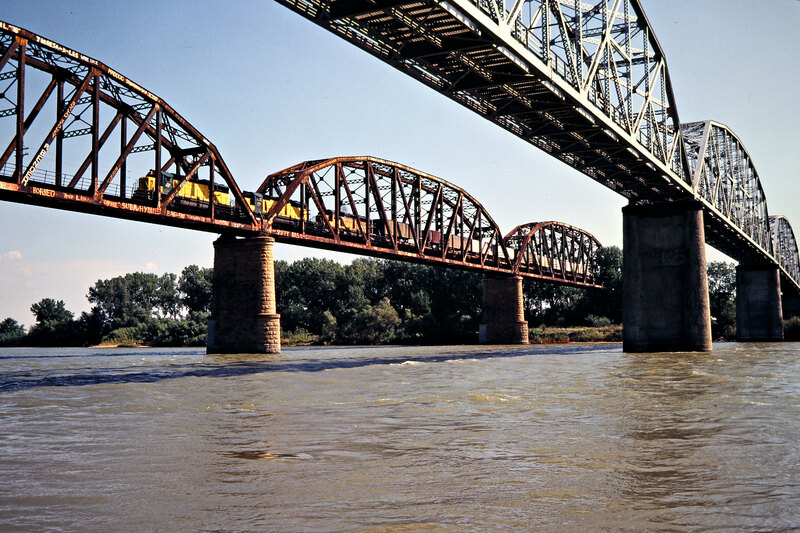 Bjorklund-24-28-14. 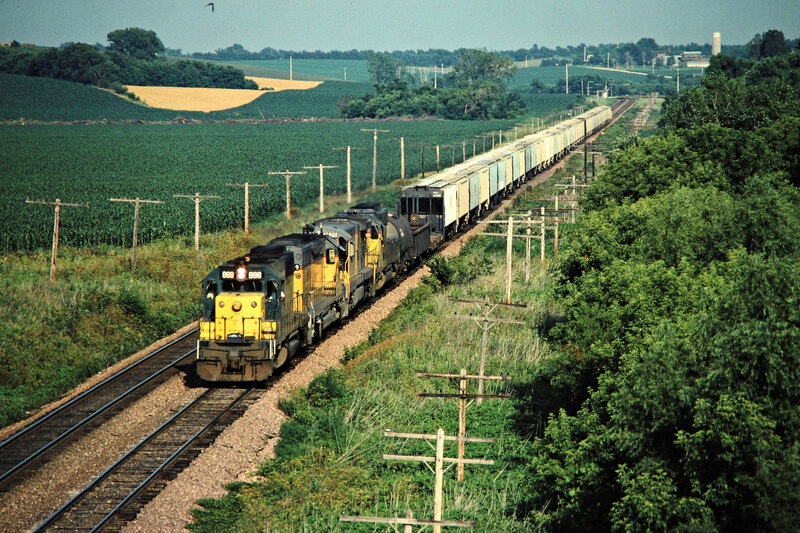 Westbound Chicago and North Western Railway freight train in Cambria, Minnesota, on July 21, 1976. 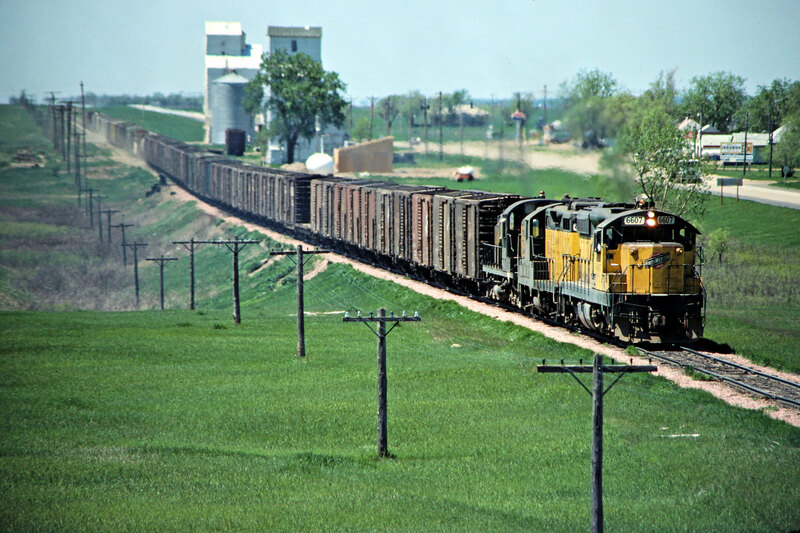 Photograph by John F. Bjorklund, © 2015, Center for Railroad Photography and Art. 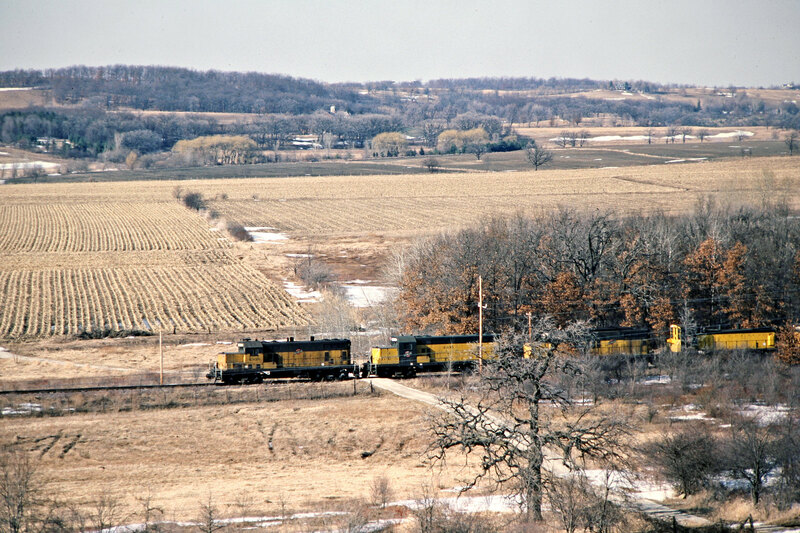 Bjorklund-25-01-03. 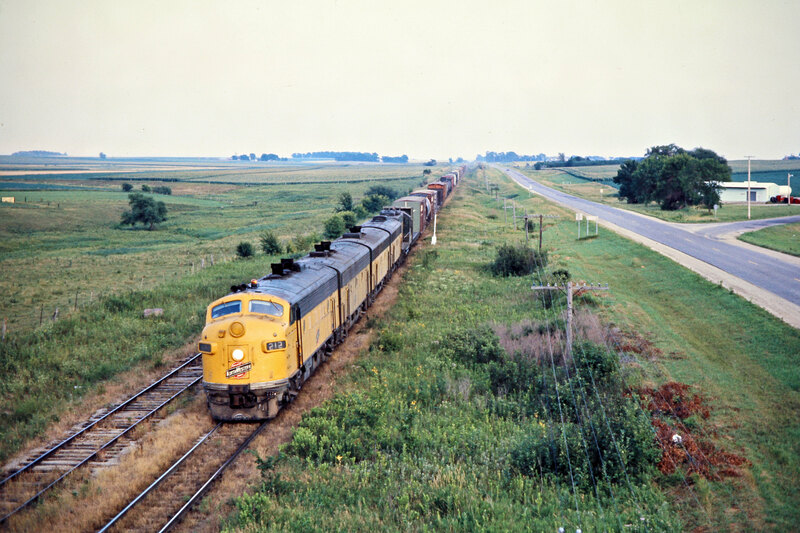 Eastbound Chicago and North Western Railway freight train in Lamberton, Minnesota, on July 22, 1976. 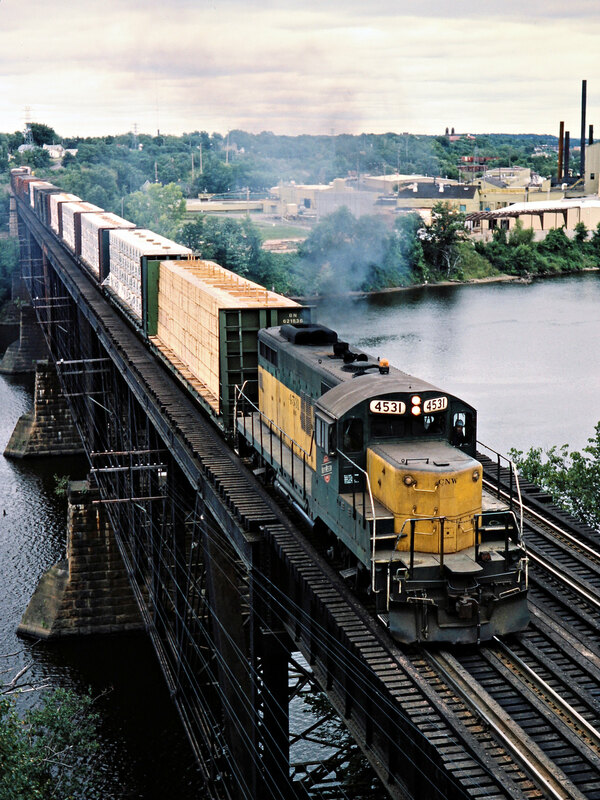 Photograph by John F. Bjorklund, © 2015, Center for Railroad Photography and Art. 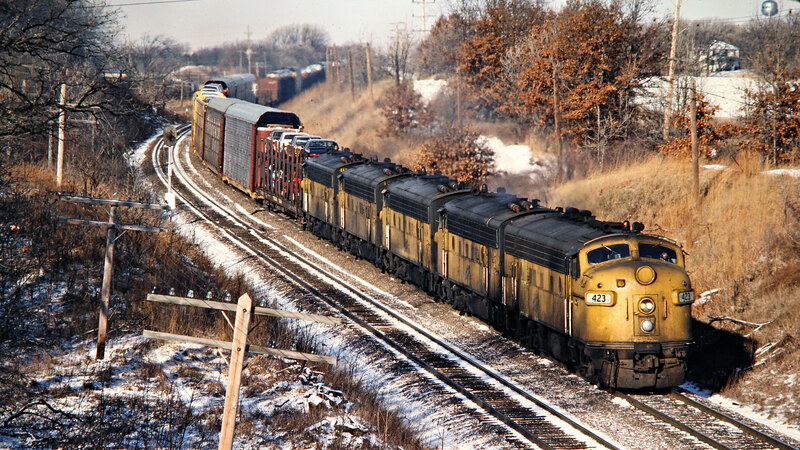 Bjorklund-25-03-04. 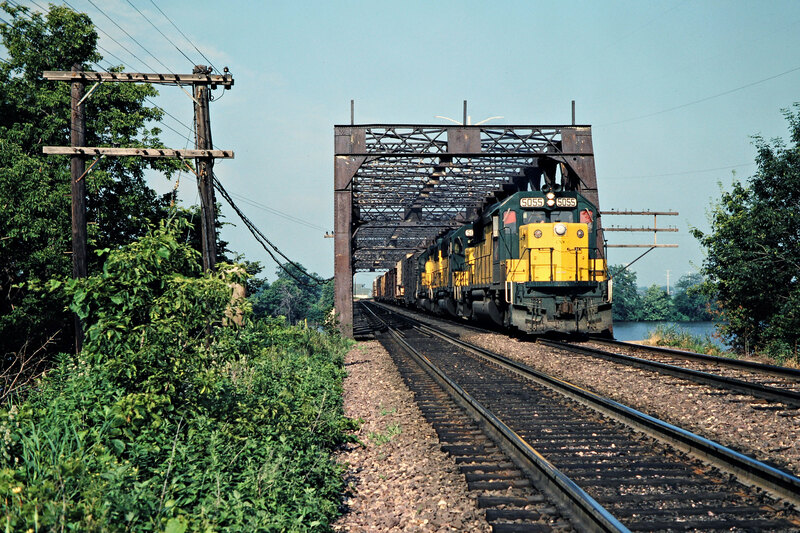 Eastbound Chicago and North Western Railway freight train in Revere, Minnesota, on July 22, 1976. 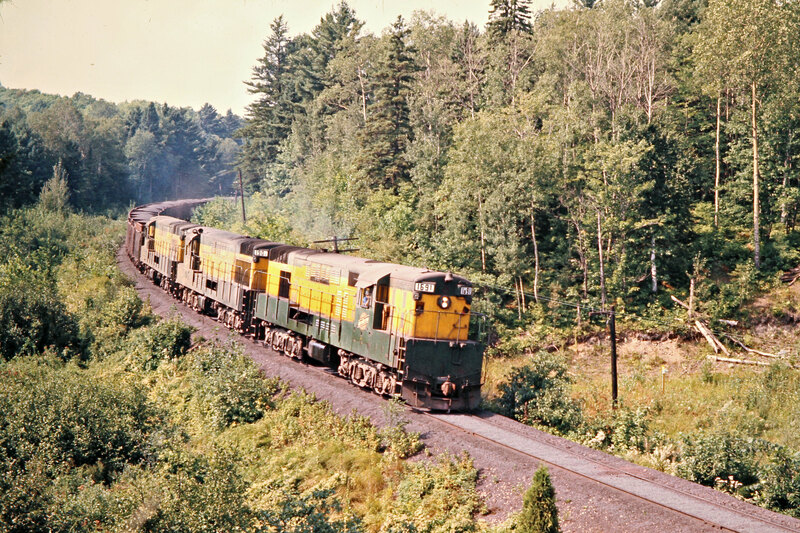 Photograph by John F. Bjorklund, © 2015, Center for Railroad Photography and Art. 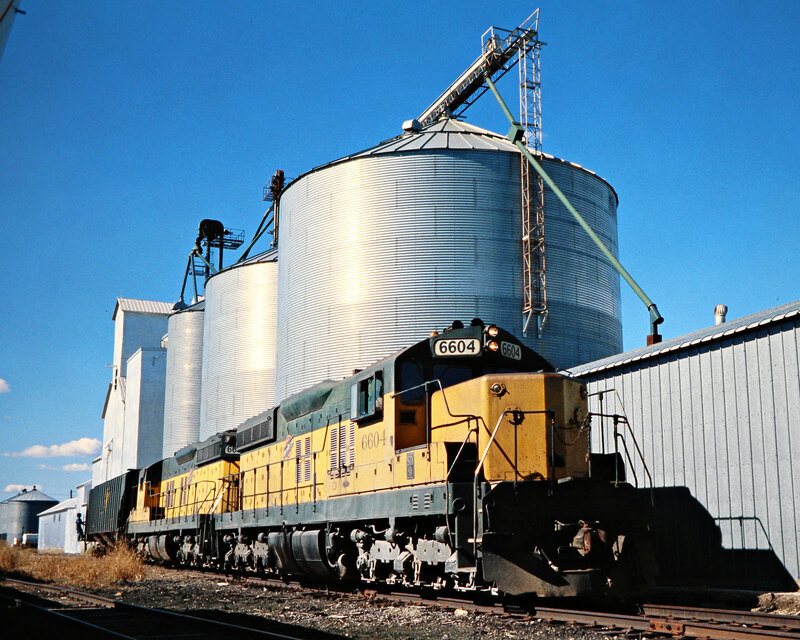 Bjorklund-25-03-05. 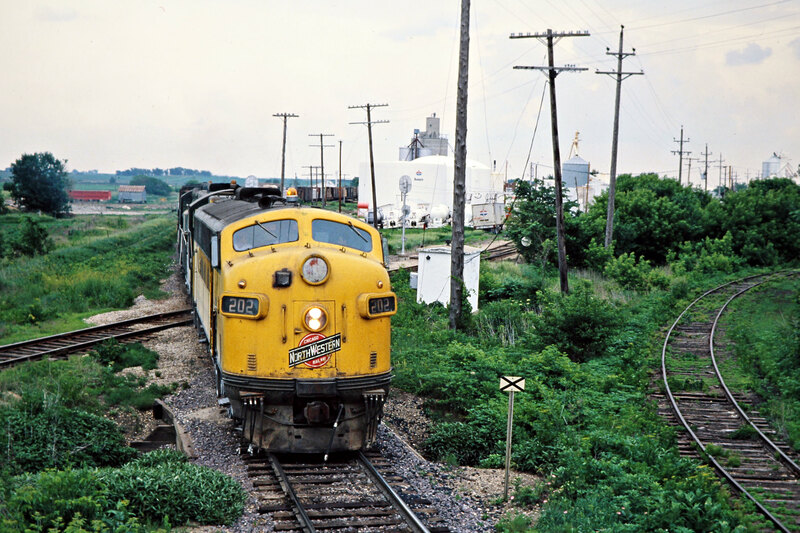 Chicago and North Western Railway lcoomotive in Walnut Grove, Minnesota, on July 22, 1976. 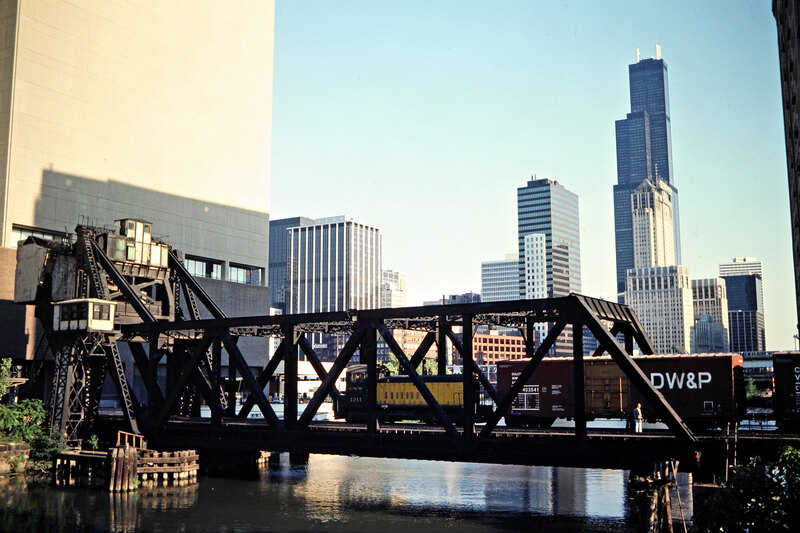 Photograph by John F. Bjorklund, © 2015, Center for Railroad Photography and Art. Bjorklund-25-03-10. 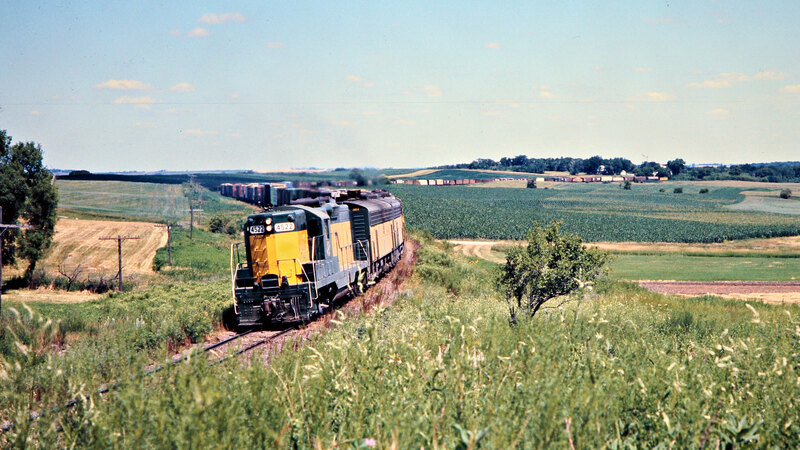 Eastbound Chicago and North Western Railway freight train in Walnut Grove, Minnesota, on July 22, 1976. 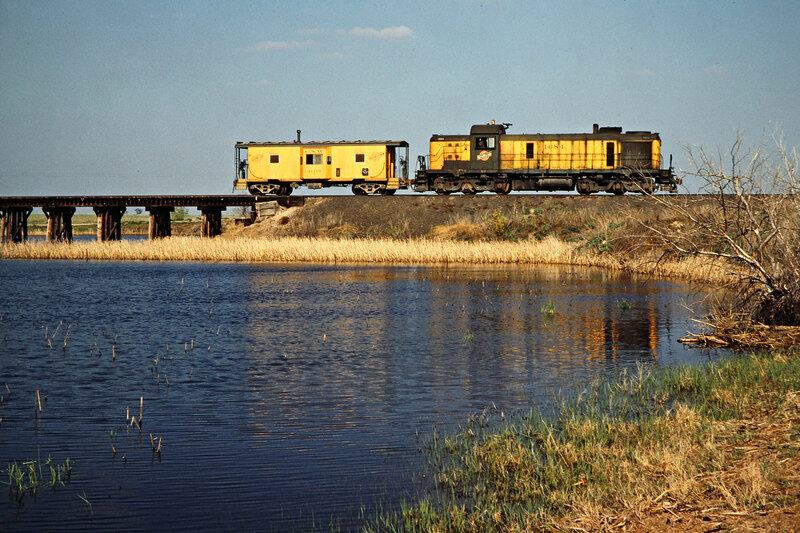 Photograph by John F. Bjorklund, © 2015, Center for Railroad Photography and Art. Bjorklund-25-03-17. 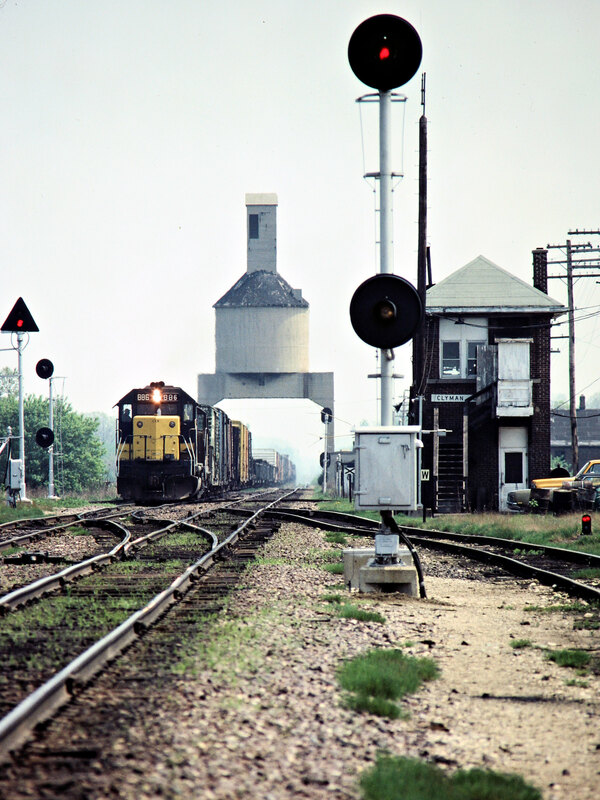 Eastbound Chicago and North Western Railway freight train in Tracy, Minnesota, on July 22, 1976. 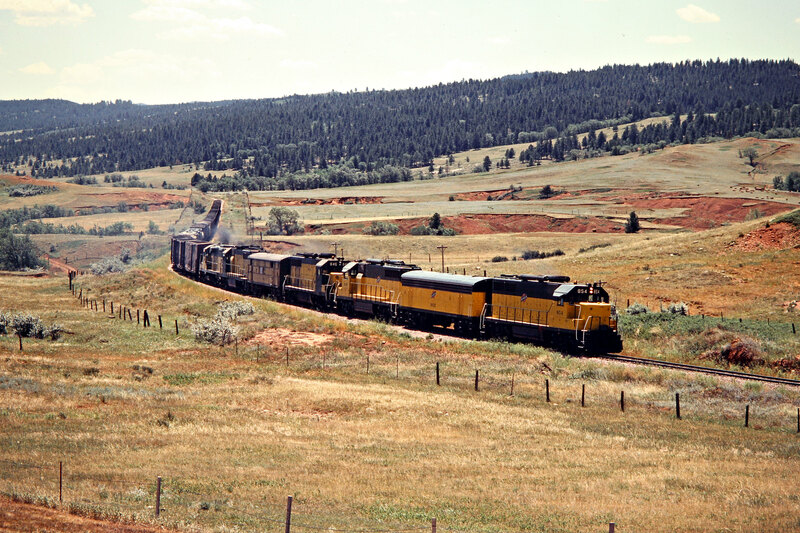 Photograph by John F. Bjorklund, © 2015, Center for Railroad Photography and Art. Bjorklund-25-03-19. 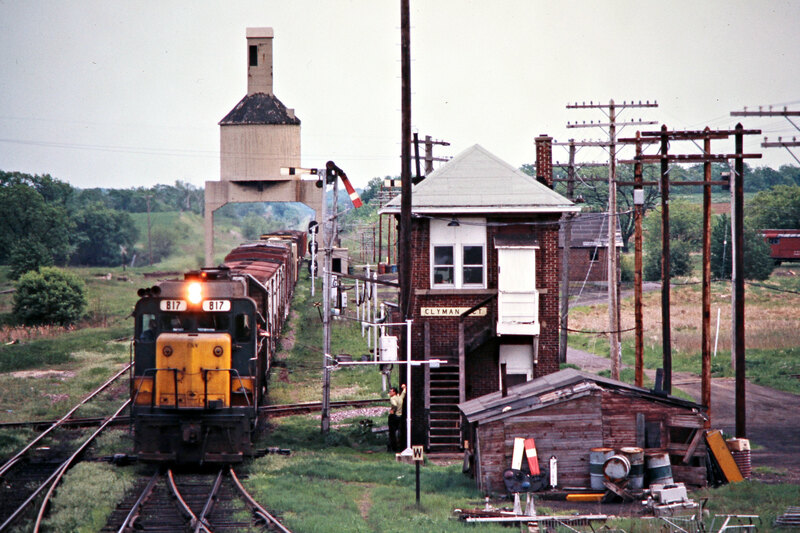 Eastbound Chicago and North Western Railway freight train in Cobden, Minnesota, on July 22, 1976. 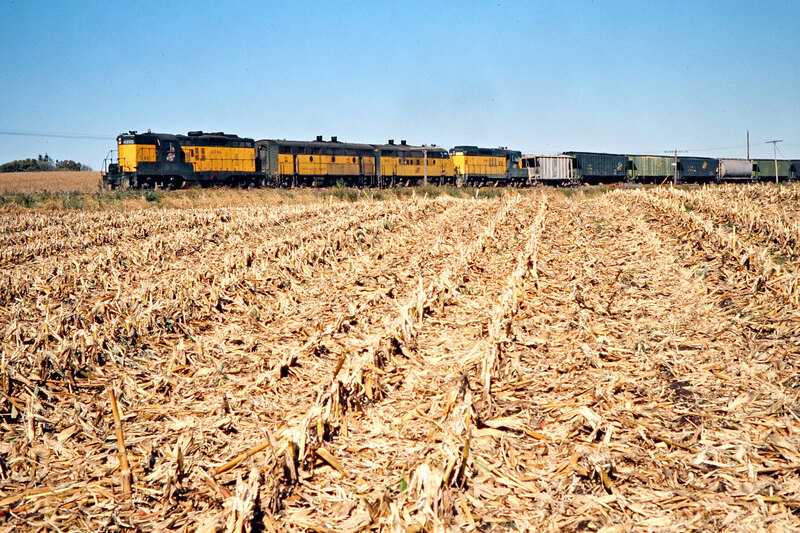 Photograph by John F. Bjorklund, © 2015, Center for Railroad Photography and Art. 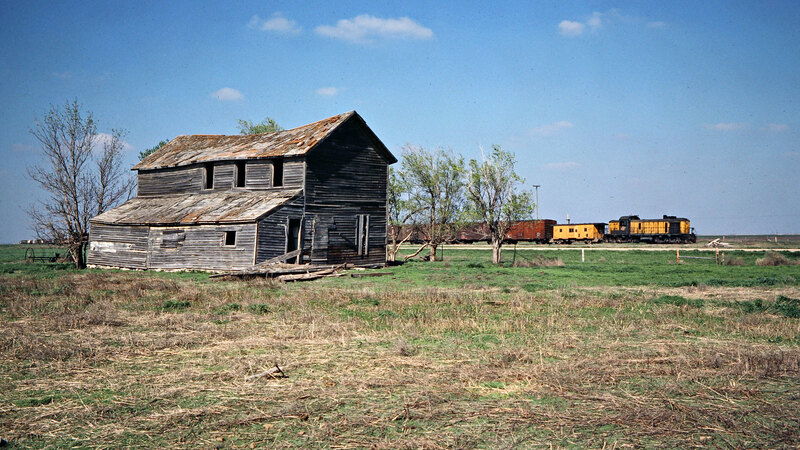 Bjorklund-25-04-02. 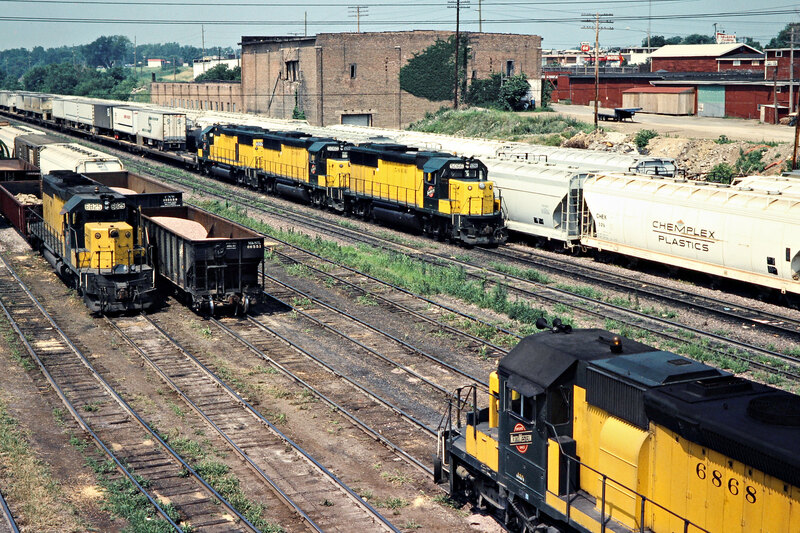 Eastbound Chicago and North Western Railway freight train in Springfield, Minnesota, on July 22, 1976. 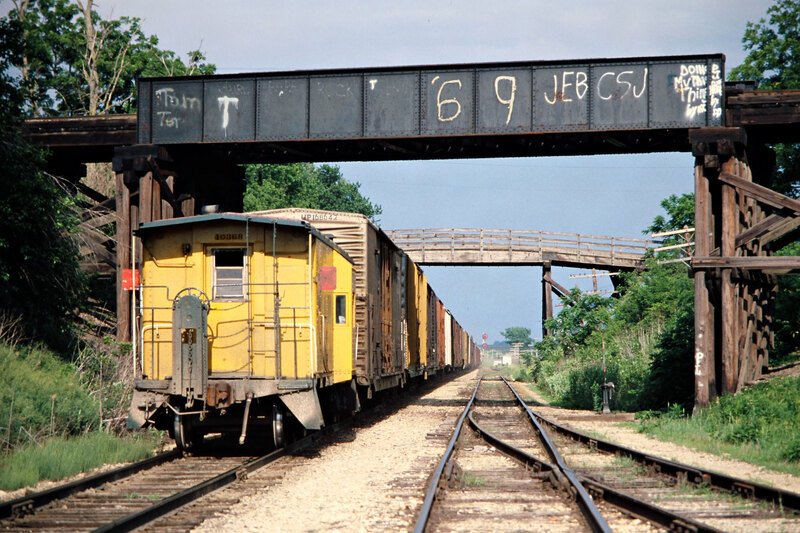 Photograph by John F. Bjorklund, © 2015, Center for Railroad Photography and Art. Bjorklund-25-04-11. 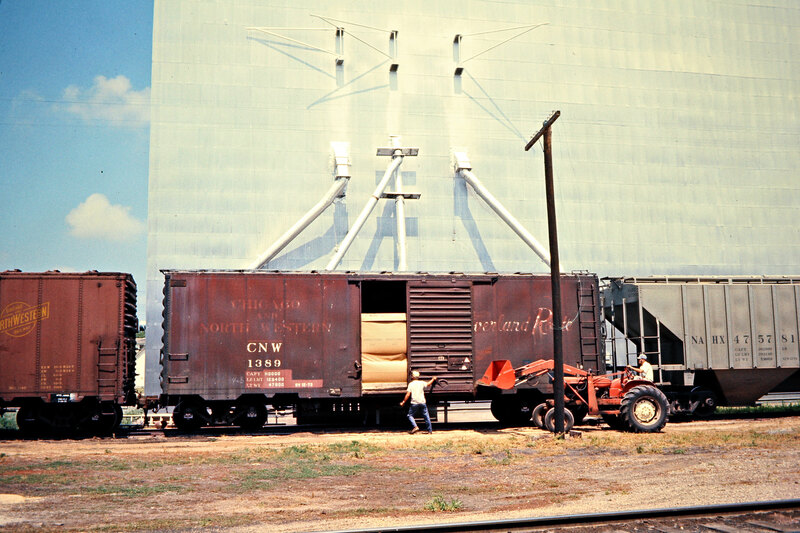 Loading grain in boxcars on the Chicago and North Western Railway in Springfield, Minnesota, on July 22, 1976. 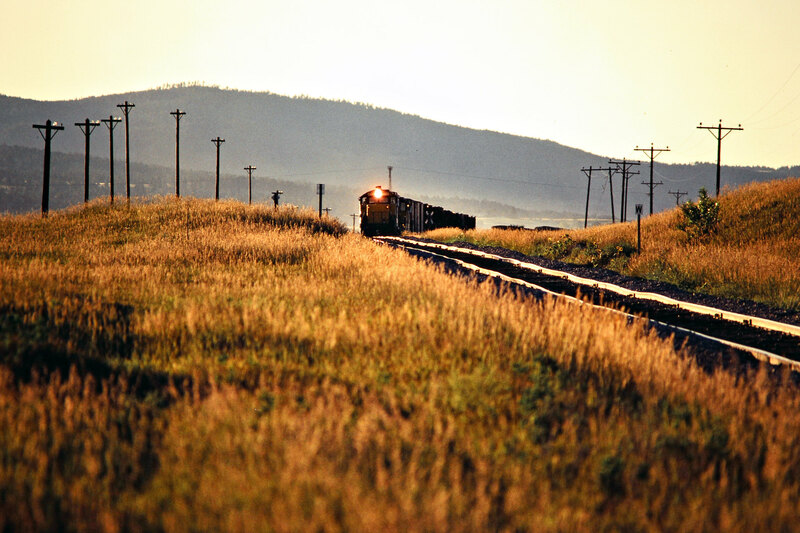 Photograph by John F. Bjorklund, © 2015, Center for Railroad Photography and Art. Bjorklund-25-04-13. 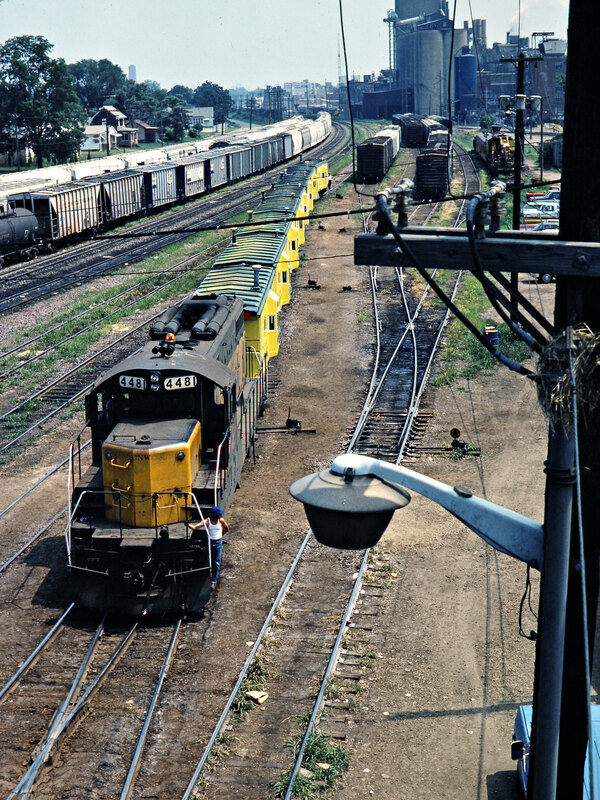 Eastbound Chicago and North Western Railway freight train in Springfield, Minnesota, on July 22, 1976. 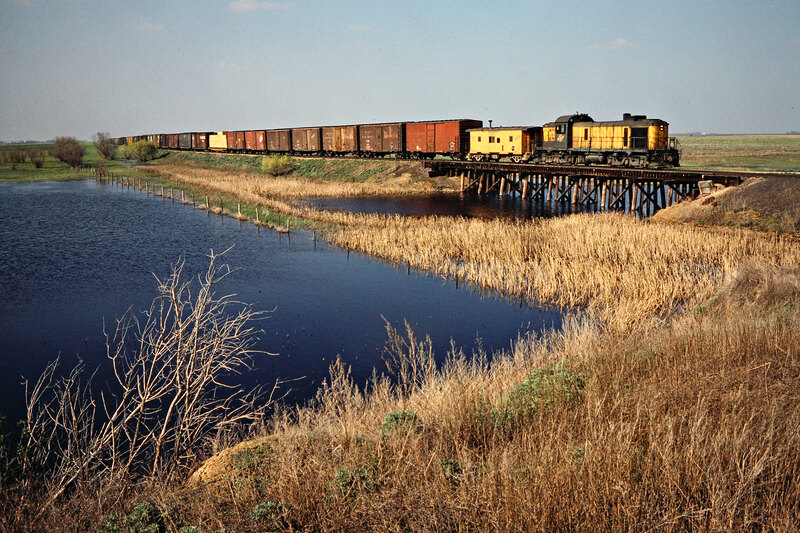 Photograph by John F. Bjorklund, © 2015, Center for Railroad Photography and Art. Bjorklund-25-04-17. 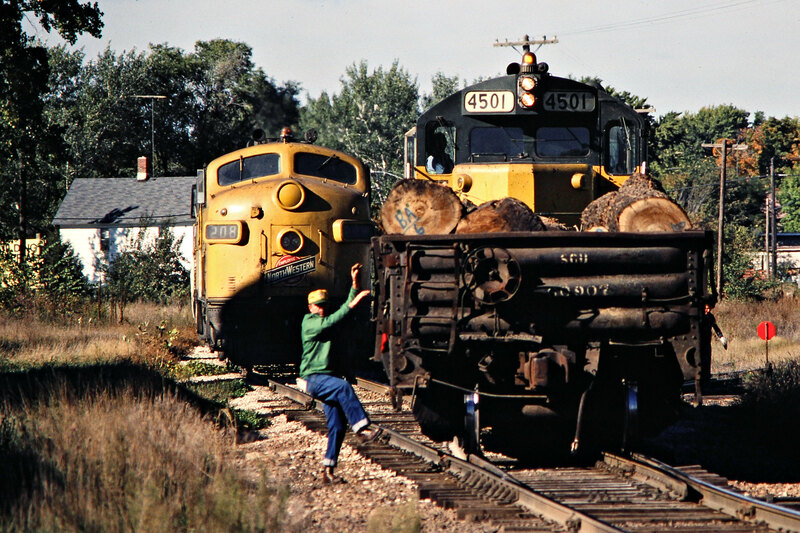 Chicago and North Western Railway Alco locomotives at the engine terminal in Huron, South Dakota, on July 22, 1976. 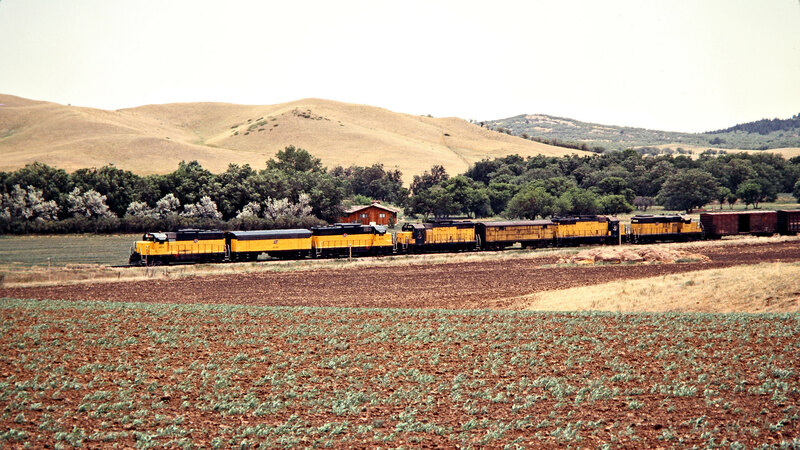 Photograph by John F. Bjorklund, © 2015, Center for Railroad Photography and Art. 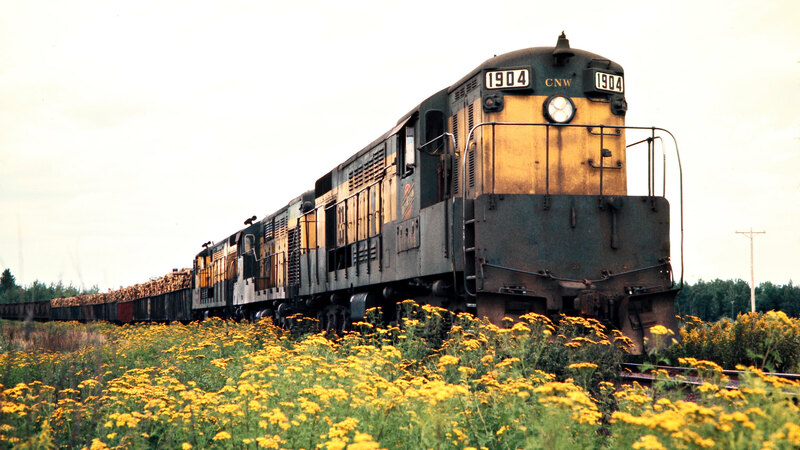 Bjorklund-25-05-10. 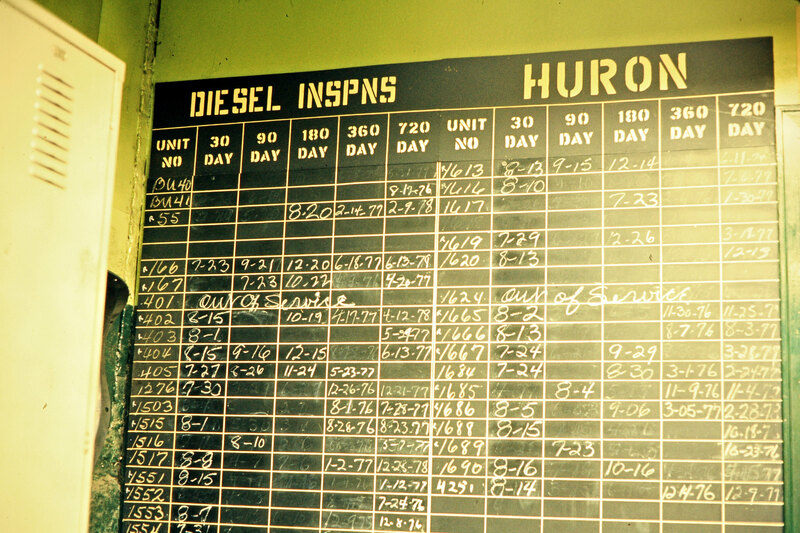 Chicago and North Western Railway diesel inspection chart in Huron, South Dakota, on July 22, 1976. 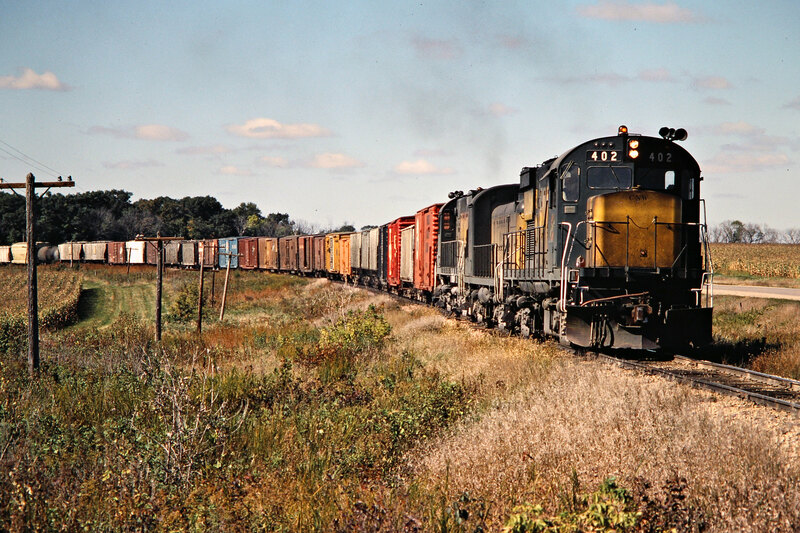 Photograph by John F. Bjorklund, © 2015, Center for Railroad Photography and Art. Bjorklund-25-05-11. 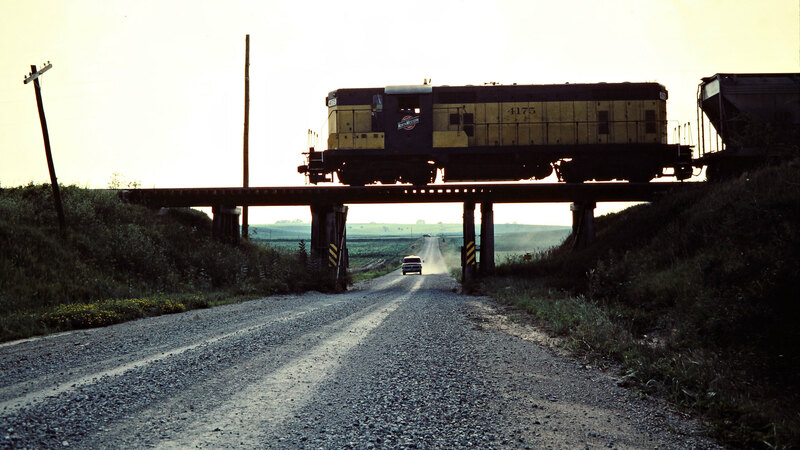 Chicago and North Western Railway crossing of the Burlington Northern in Arlington, South Dakota, on July 22, 1976. 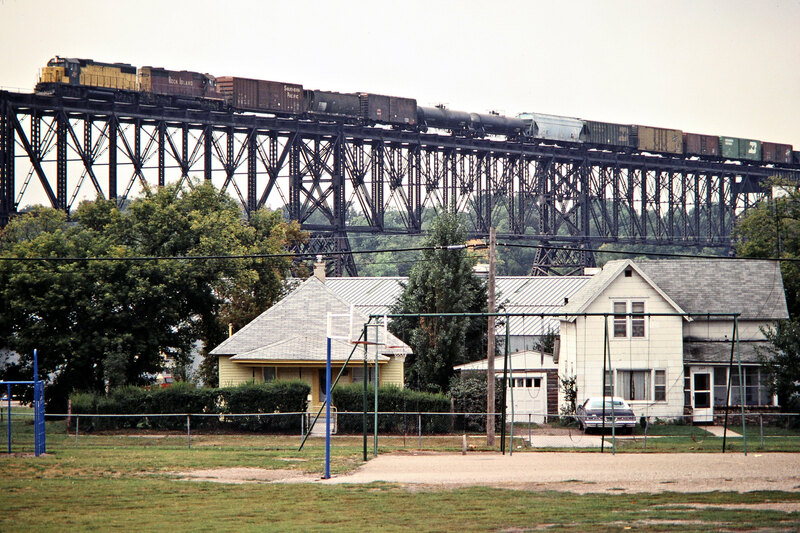 Photograph by John F. Bjorklund, © 2015, Center for Railroad Photography and Art. 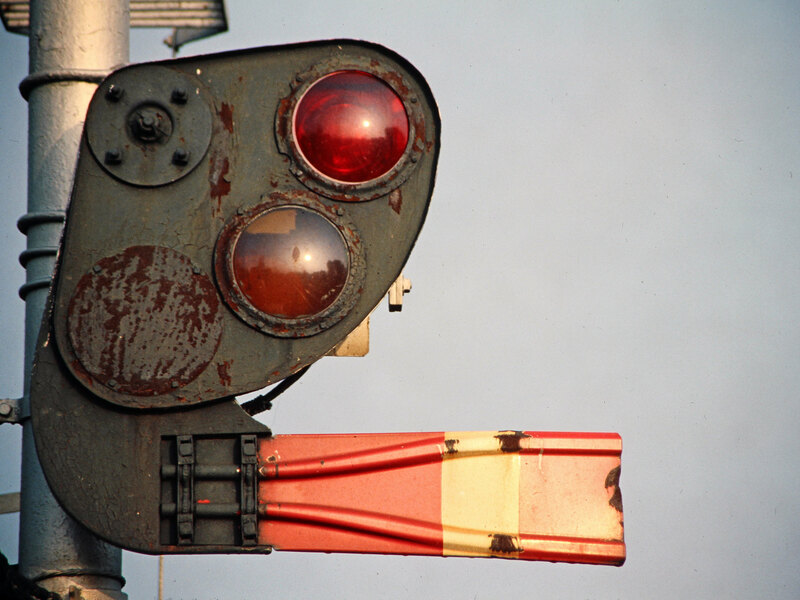 Bjorklund-25-05-15. 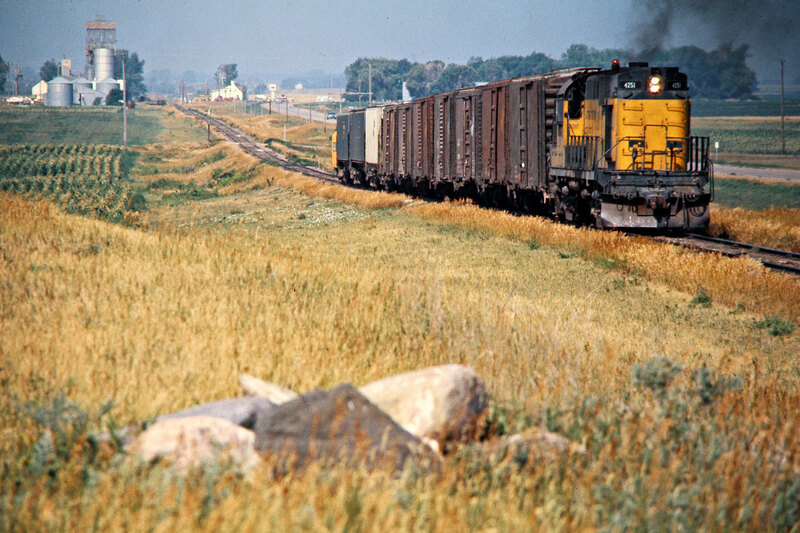 Eastbound Chicago and North Western Railway freight train in Iroquois, South Dakota, on July 23, 1976. 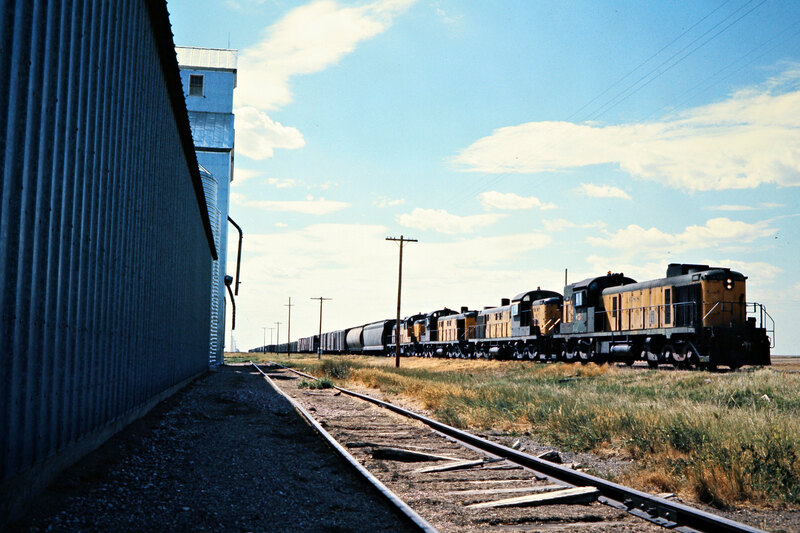 Photograph by John F. Bjorklund, © 2015, Center for Railroad Photography and Art. 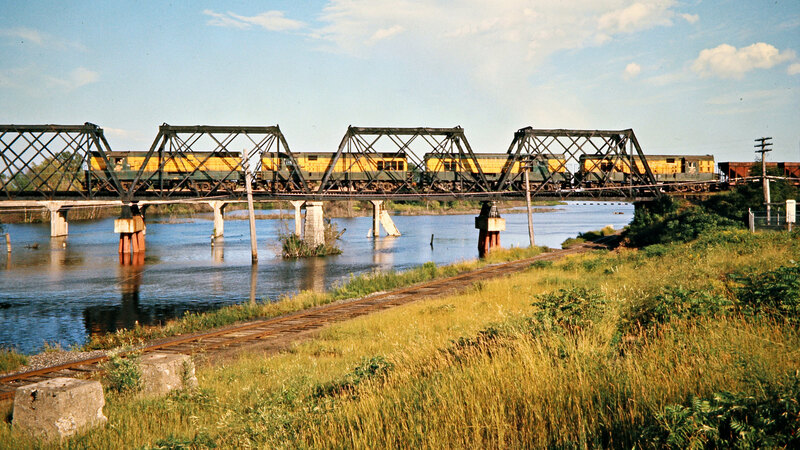 Bjorklund-25-06-20. 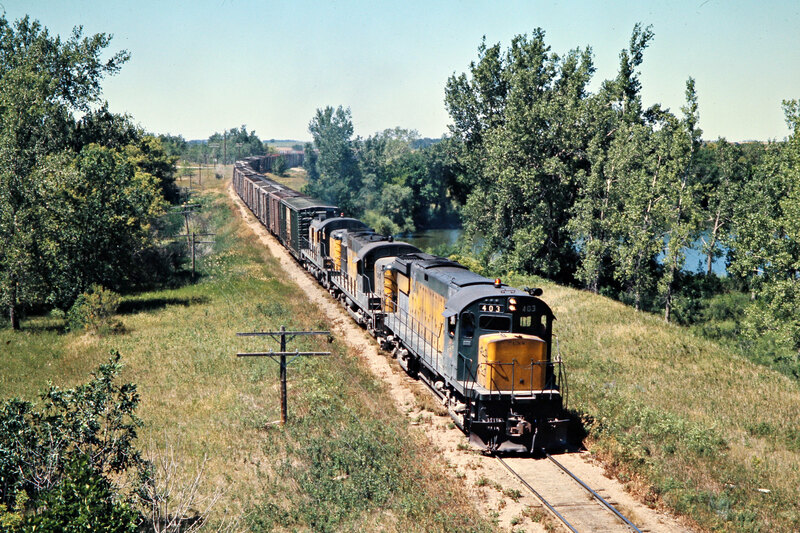 Eastbound Chicago and North Western Railway freight train in Elkton, South Dakota, on July 23, 1976. 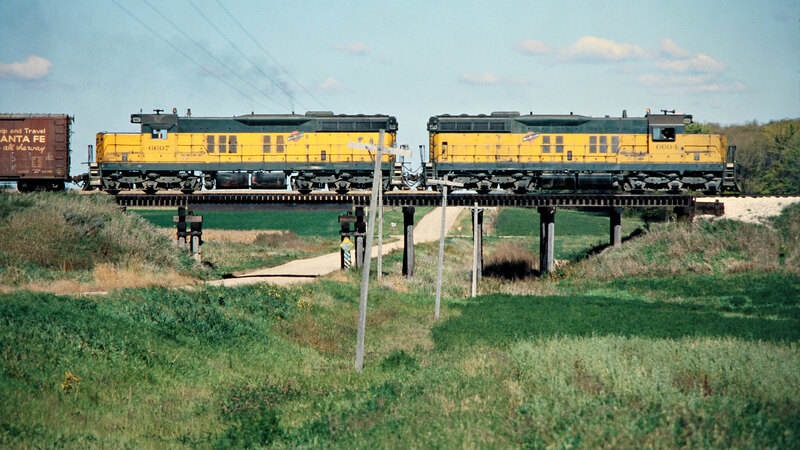 Photograph by John F. Bjorklund, © 2015, Center for Railroad Photography and Art. 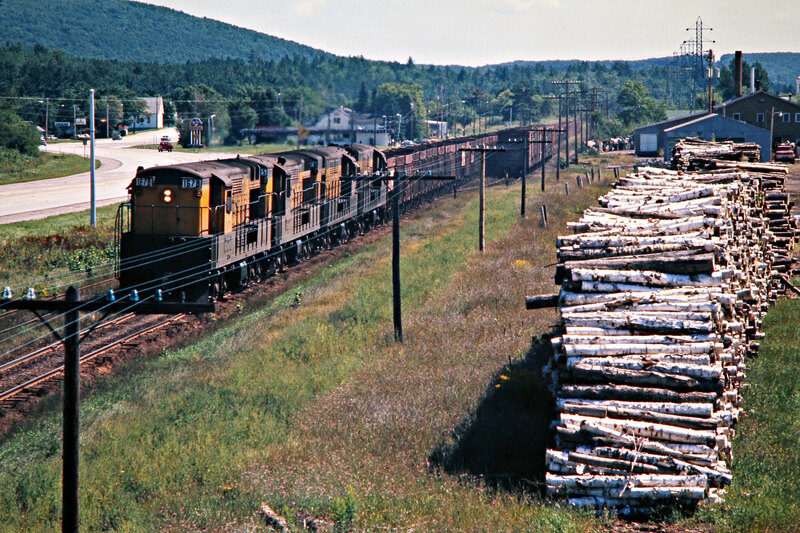 Bjorklund-25-07-02. 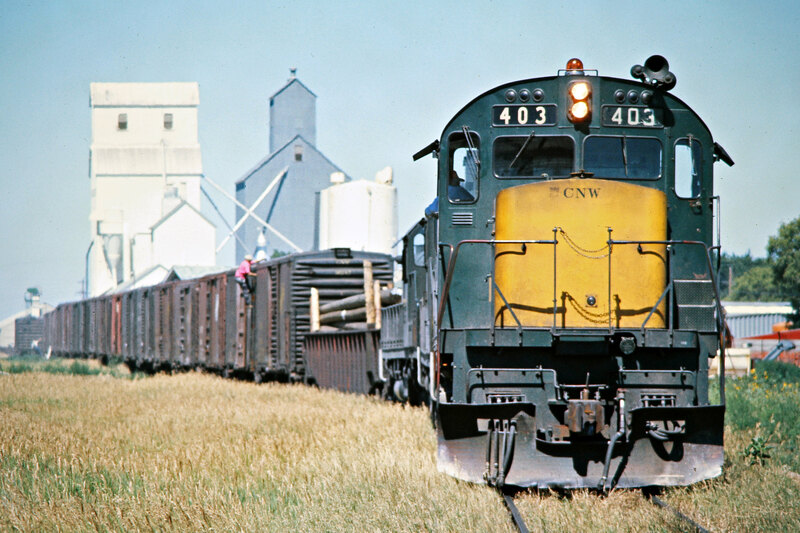 Eastbound Chicago and North Western Railway freight train in Brookings, South Dakota, on July 23, 1976. 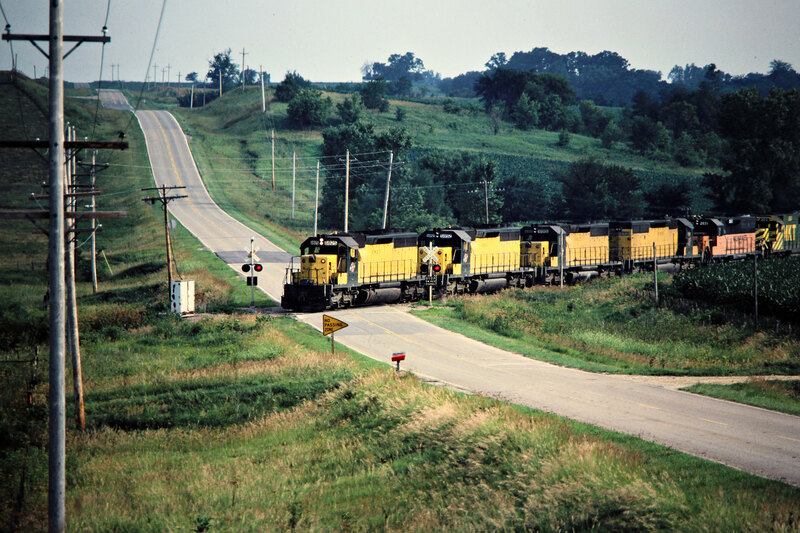 Photograph by John F. Bjorklund, © 2015, Center for Railroad Photography and Art. Bjorklund-25-07-08. 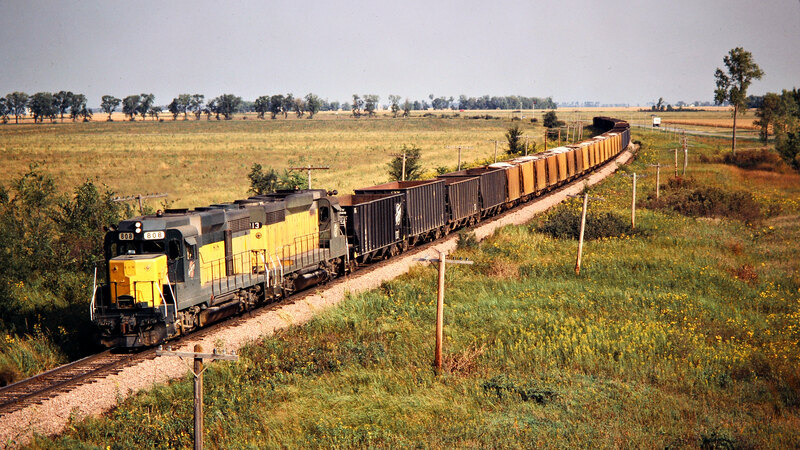 Eastbound Chicago and North Western Railway freight train near Lake Benton, Minnesota, on July 23, 1976. 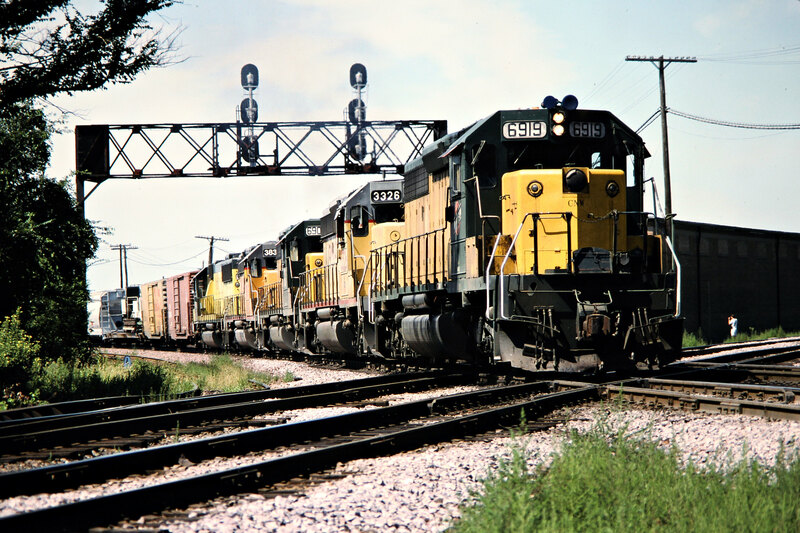 Photograph by John F. Bjorklund, © 2015, Center for Railroad Photography and Art. 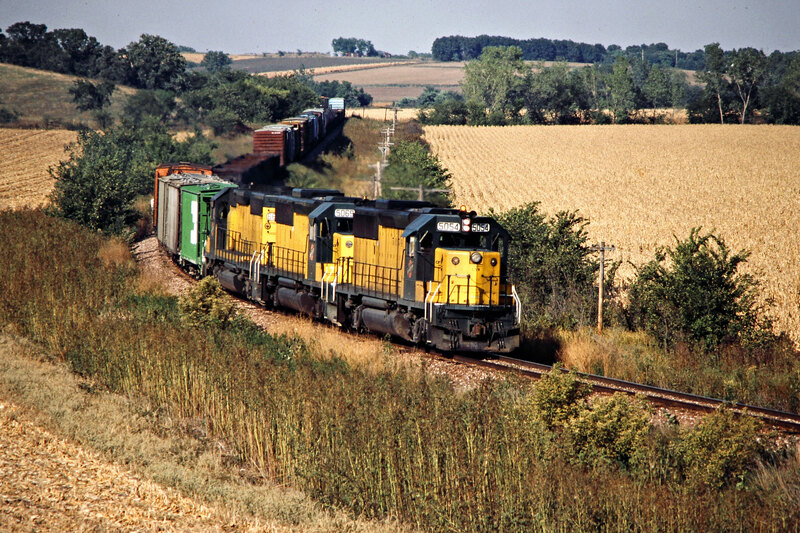 Bjorklund-25-08-08. 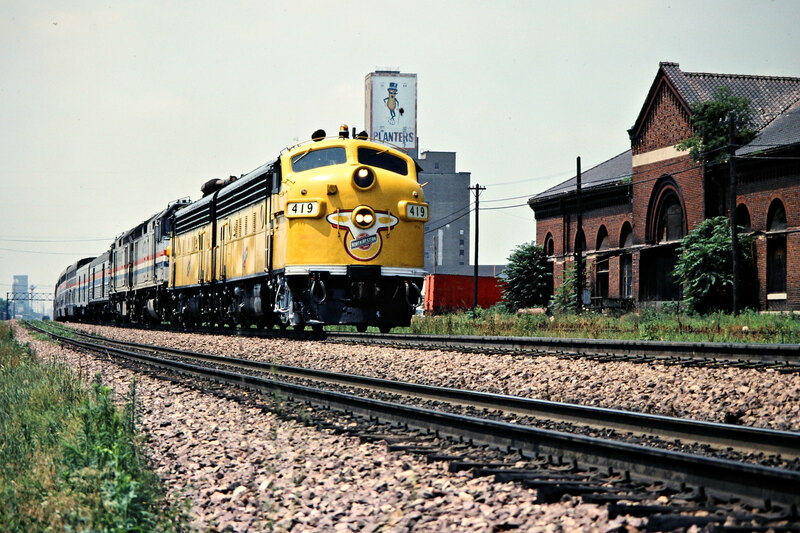 Former Minneapolis and St. Louis snowplow on the Chicago and North Western Railway in Tracy, Minnesota, on July 23, 1976. 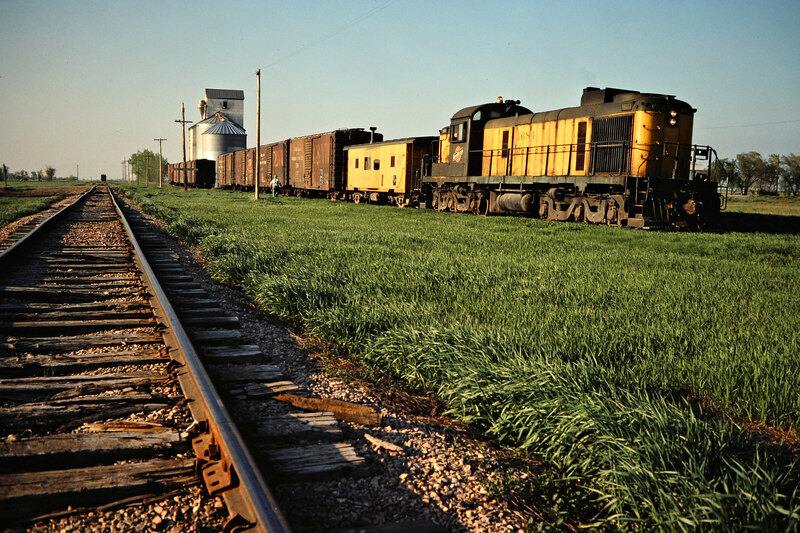 Photograph by John F. Bjorklund, © 2015, Center for Railroad Photography and Art. 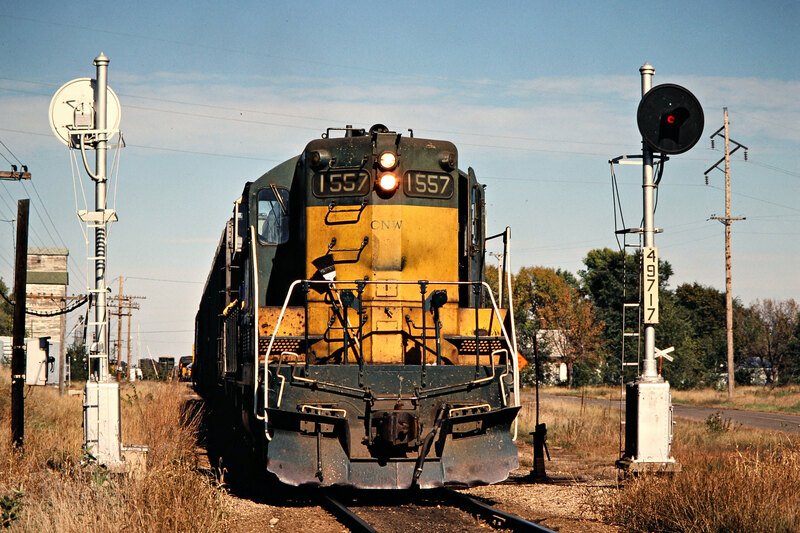 Bjorklund-25-09-13. 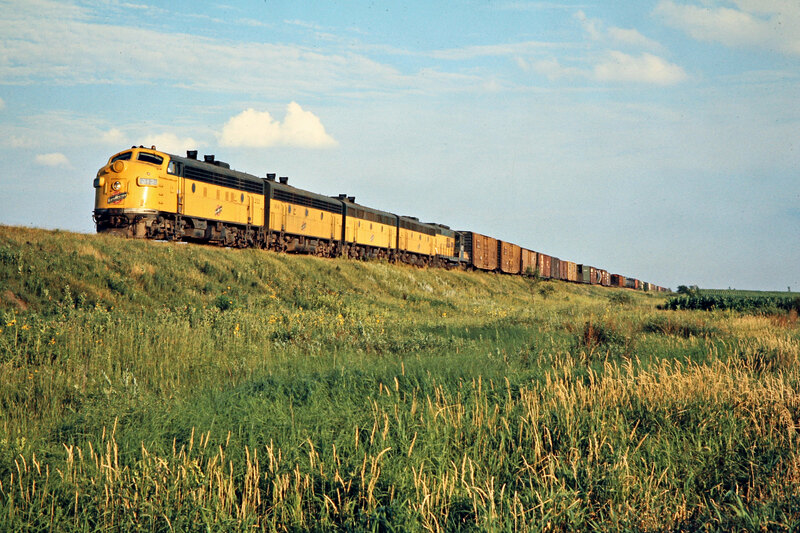 Eastbound Chicago and North Western Railway freight train near Cavour, South Dakota, on July 24, 1976. 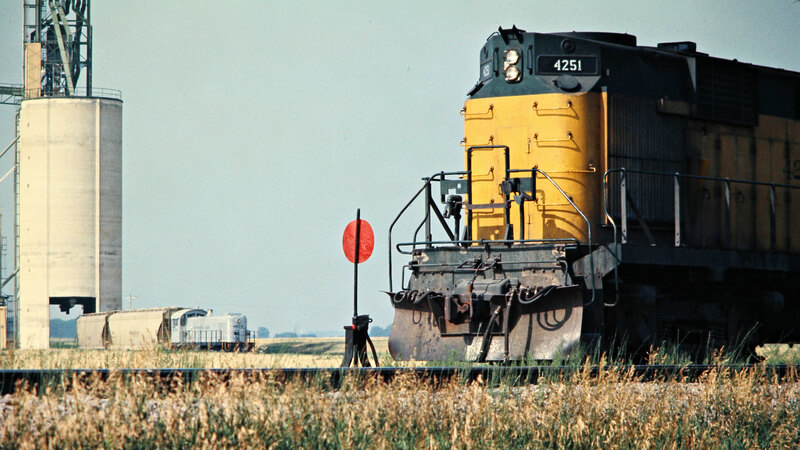 Photograph by John F. Bjorklund, © 2015, Center for Railroad Photography and Art. 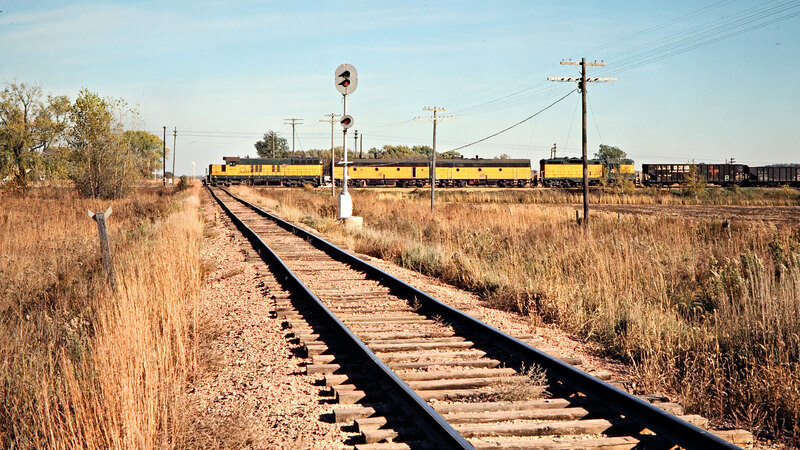 Bjorklund-25-10-18. 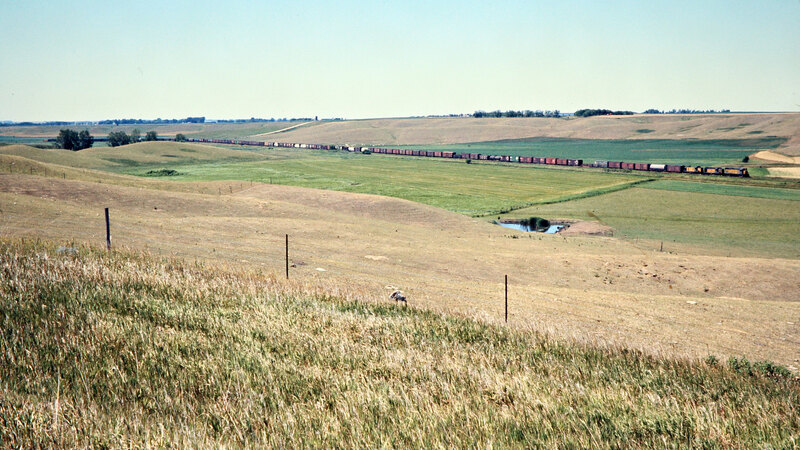 Chicago and North Western Railway freight train in South Dakota, on July 24, 1976. 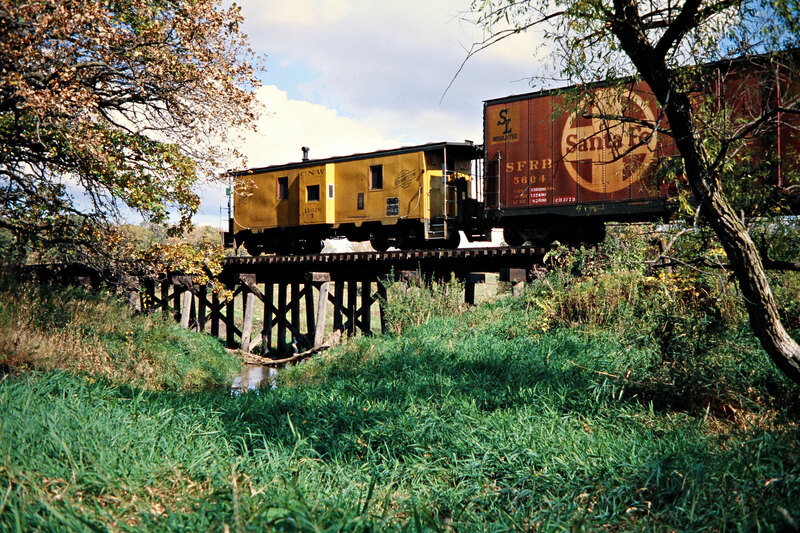 Photograph by John F. Bjorklund, © 2015, Center for Railroad Photography and Art. 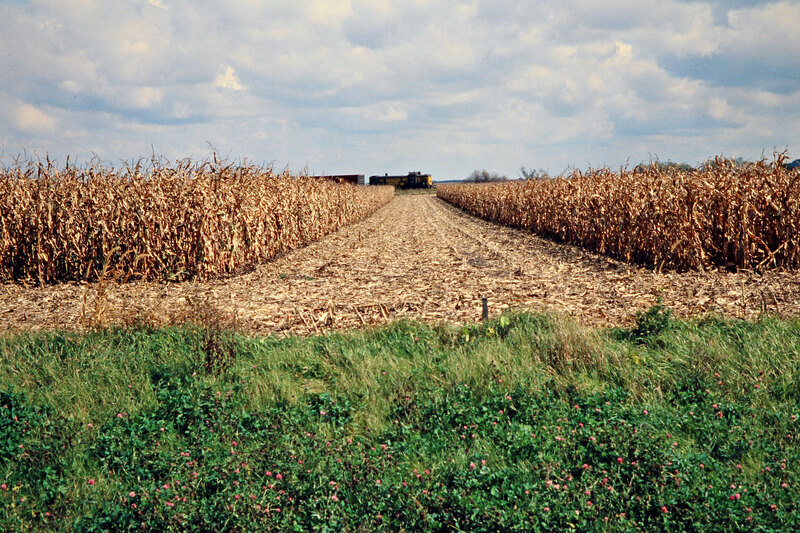 Bjorklund-25-11-09. 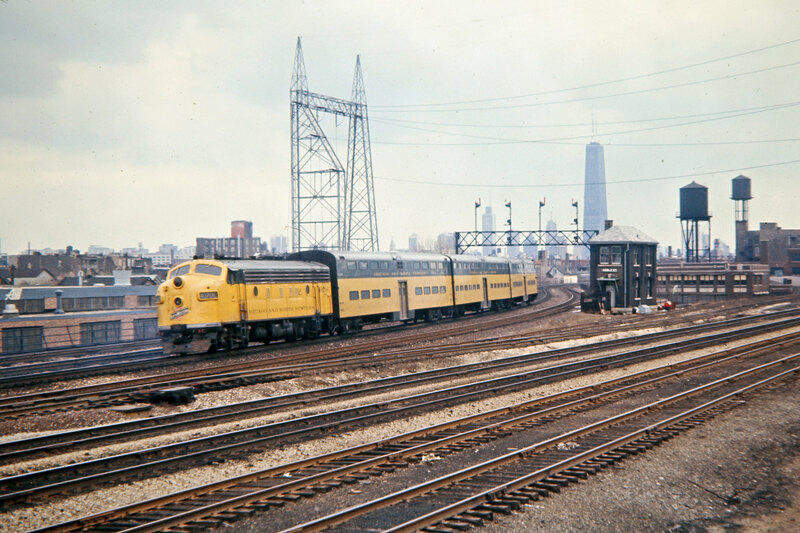 Eastbound Chicago and North Western Railway Alco RSD5 locomotive no. 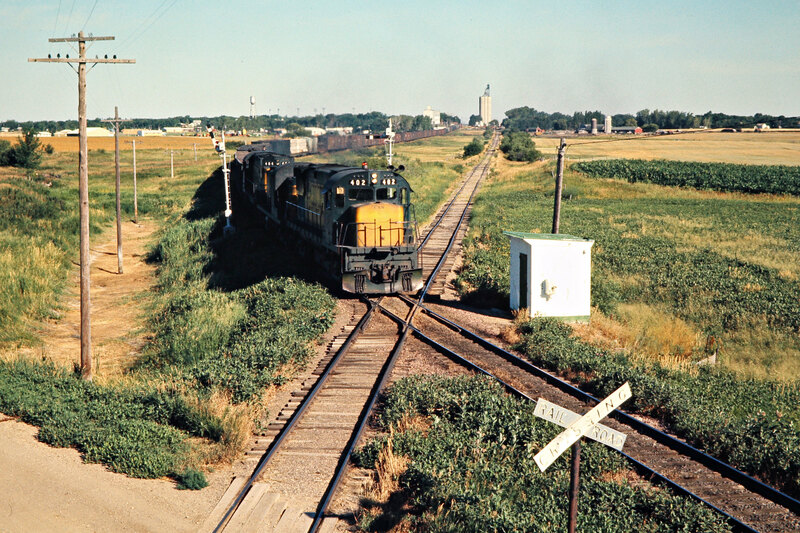 1688 in Harrold, South Dakota, on July 24, 1976. 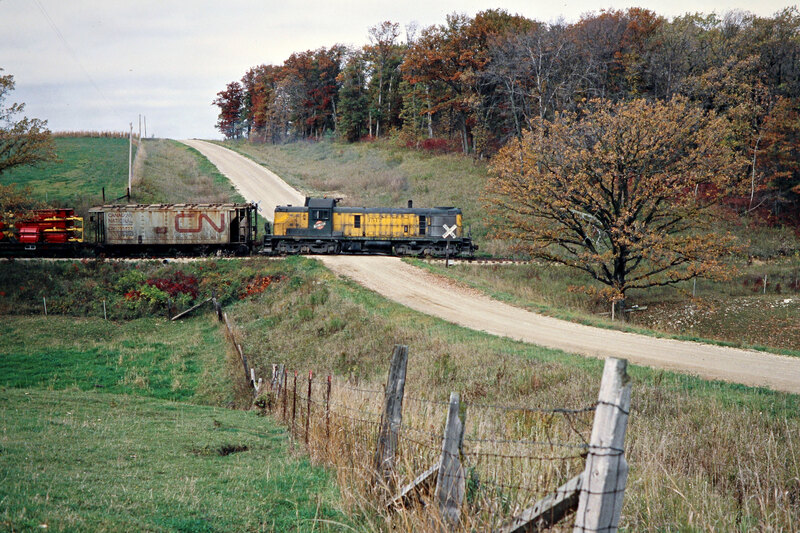 Photograph by John F. Bjorklund, © 2015, Center for Railroad Photography and Art. 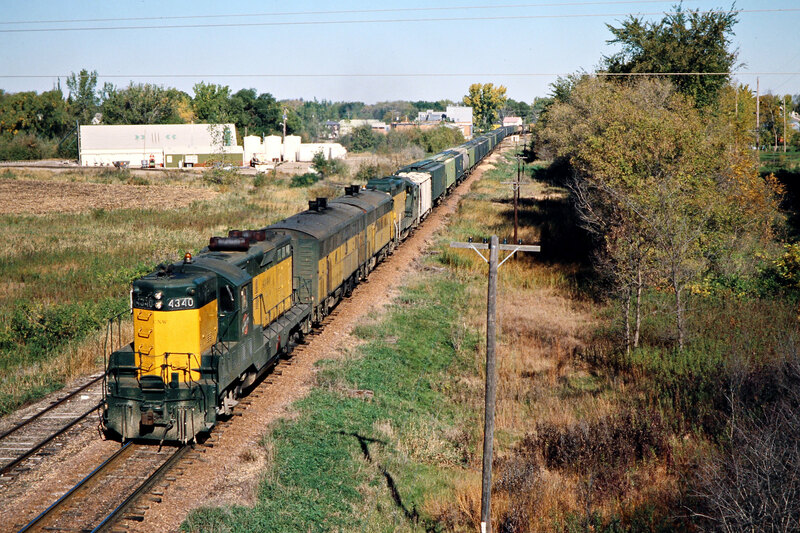 Bjorklund-25-11-13. 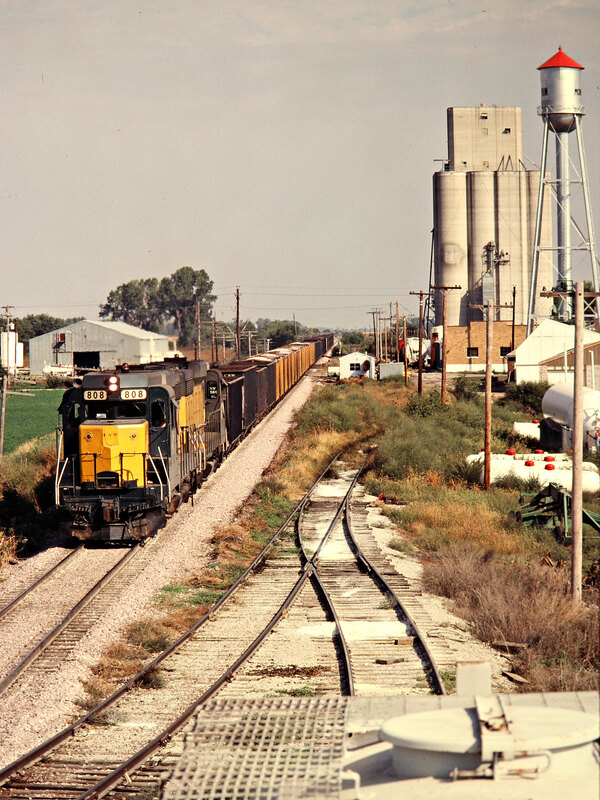 Eastbound Chicago and North Western Railway freight train in Blunt, South Dakota, on July 24, 1976. 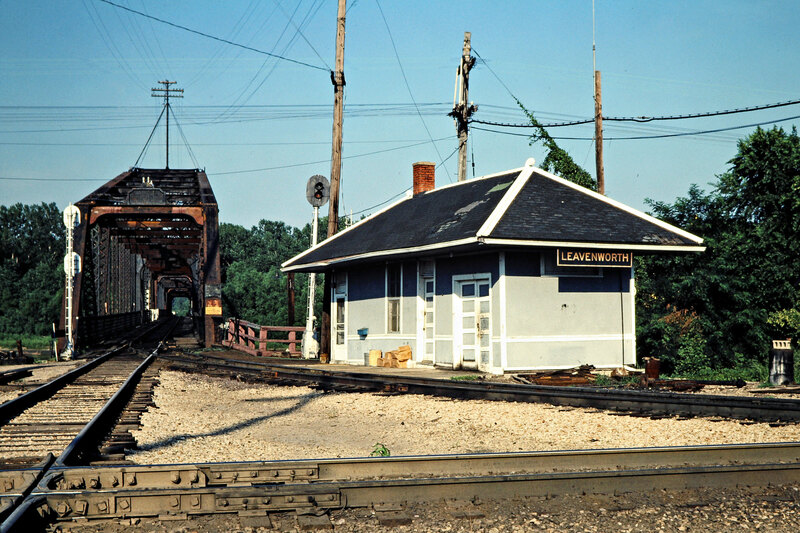 Photograph by John F. Bjorklund, © 2015, Center for Railroad Photography and Art. 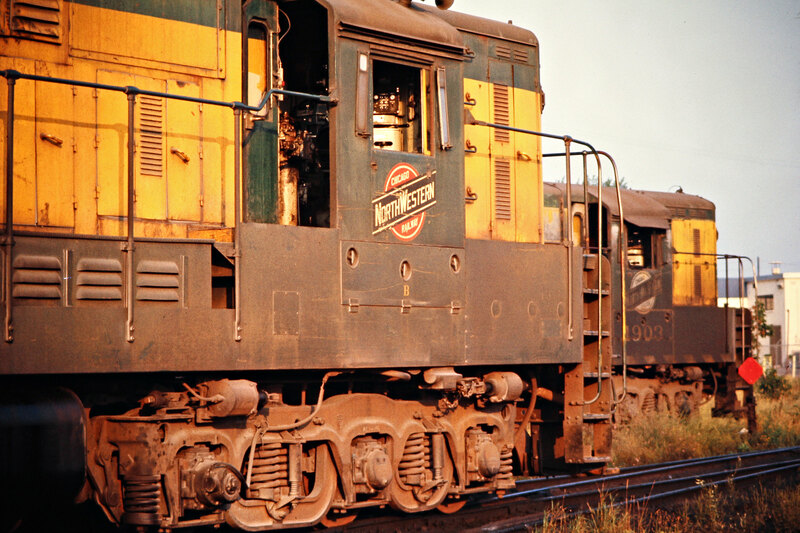 Bjorklund-25-11-19. 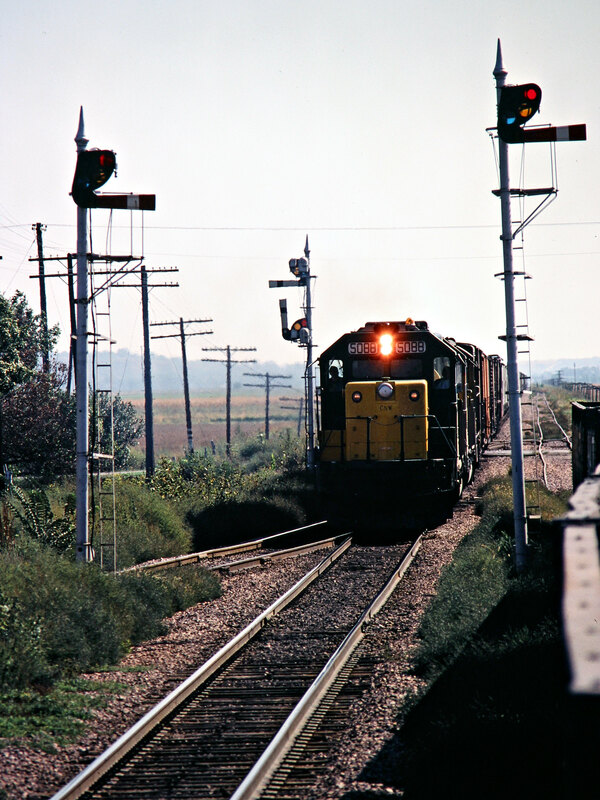 Eastbound Chicago and North Western Railway freight train crossing the Burlington Northern in Arlington, South Dakota, on July 24, 1976. 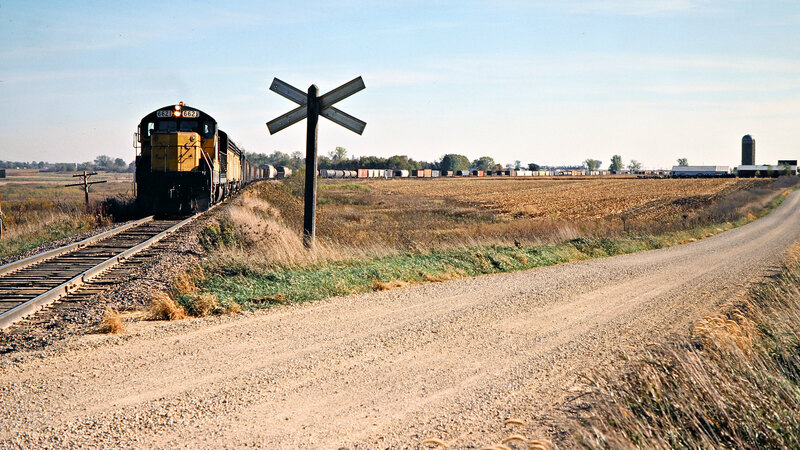 Photograph by John F. Bjorklund, © 2015, Center for Railroad Photography and Art. 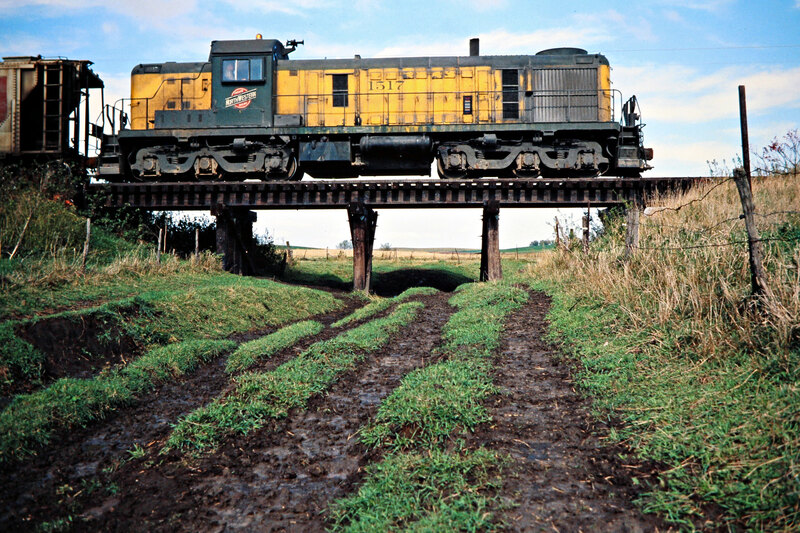 Bjorklund-25-12-15. 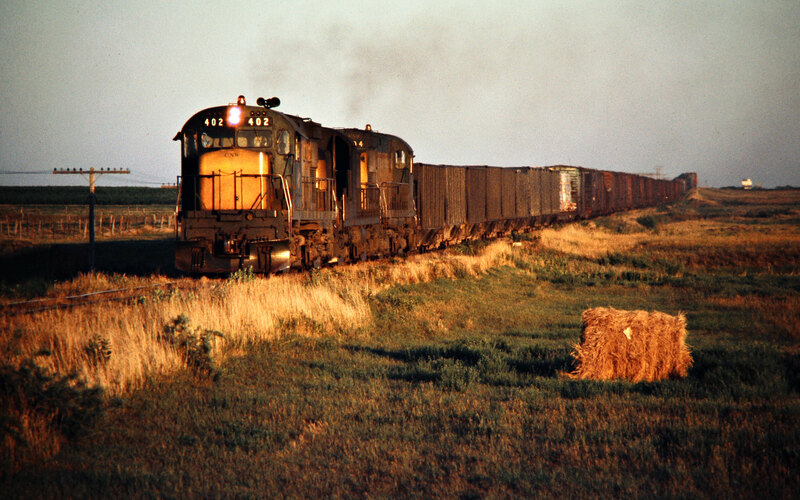 Eastbound Chicago and North Western Railway railway freight train in Highmore South Dakota, on July 24, 1976. 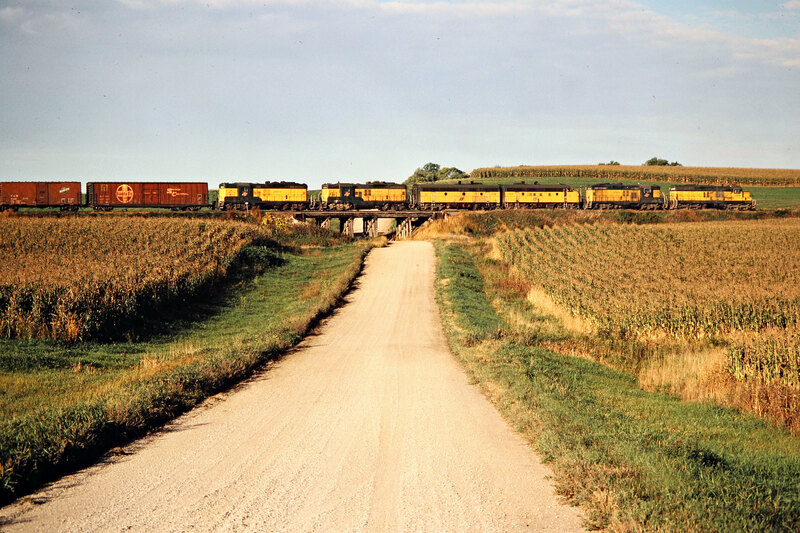 Photograph by John F. Bjorklund, © 2015, Center for Railroad Photography and Art. Bjorklund-25-13-09. 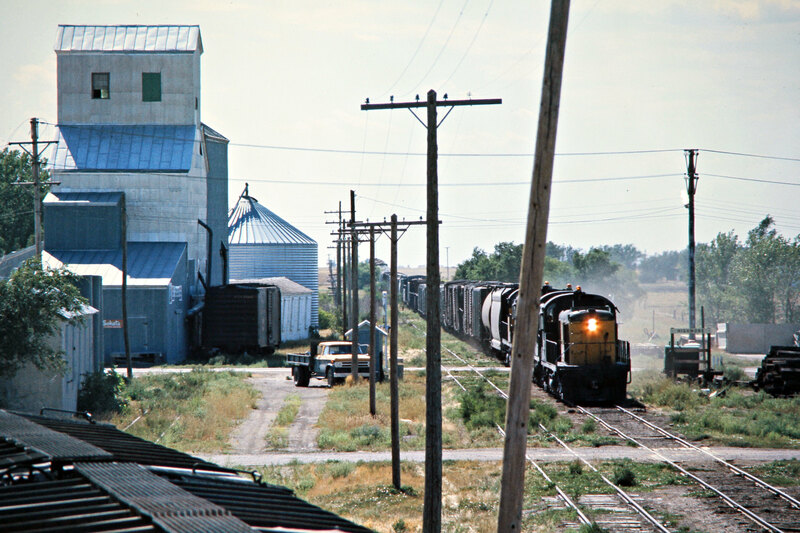 Eastbound Chicago and North Western Railway freight train in Holabird, South Dakota, on July 24, 1976. 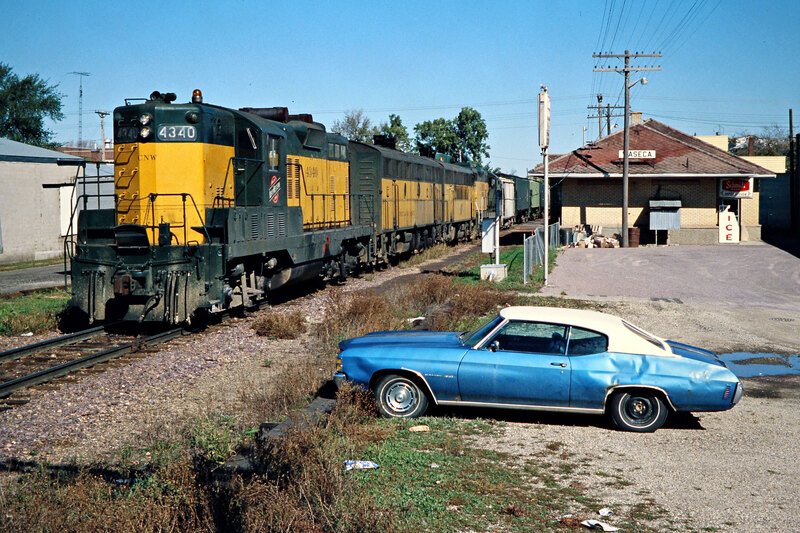 Photograph by John F. Bjorklund, © 2015, Center for Railroad Photography and Art. Bjorklund-25-13-13. 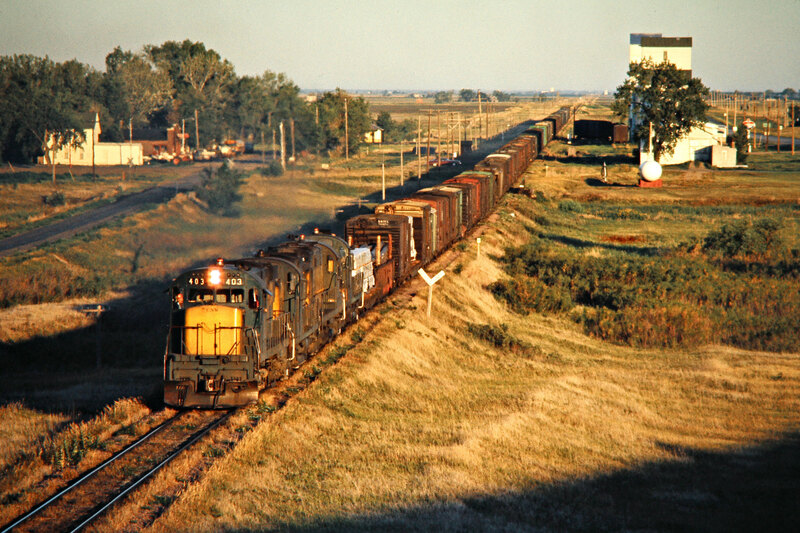 Eastbound Chicago and North Western Railway freight train in Holabird, South Dakota, on July 24, 1976. 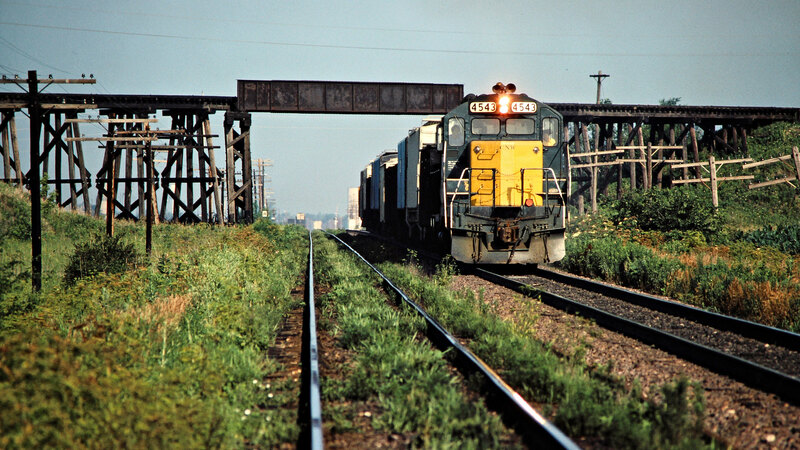 Photograph by John F. Bjorklund, © 2015, Center for Railroad Photography and Art. Bjorklund-25-13-16. 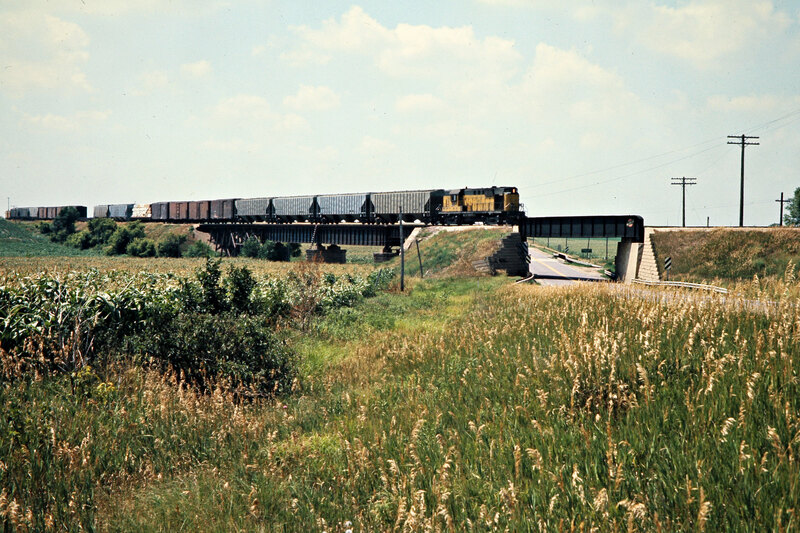 Southbound Chicago and North Western Railway freight train in Dunkerton, Iowa, on May 29, 1977. 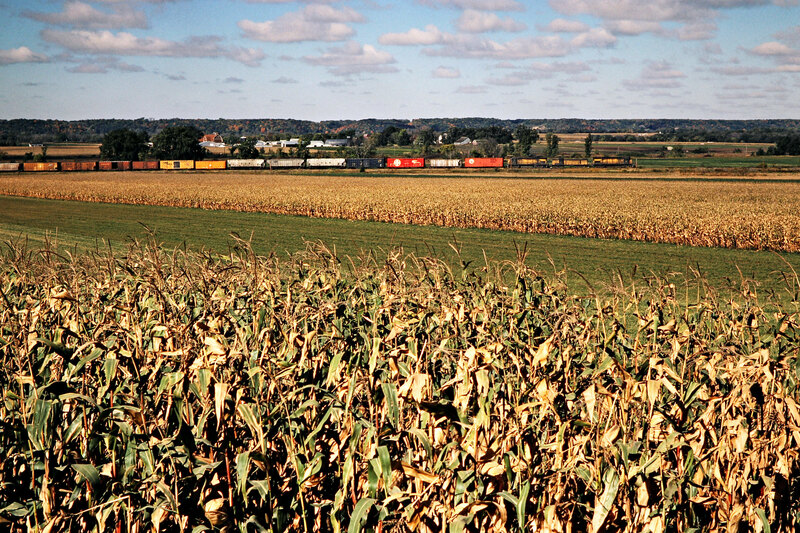 Photograph by John F. Bjorklund, © 2015, Center for Railroad Photography and Art. Bjorklund-25-17-14. 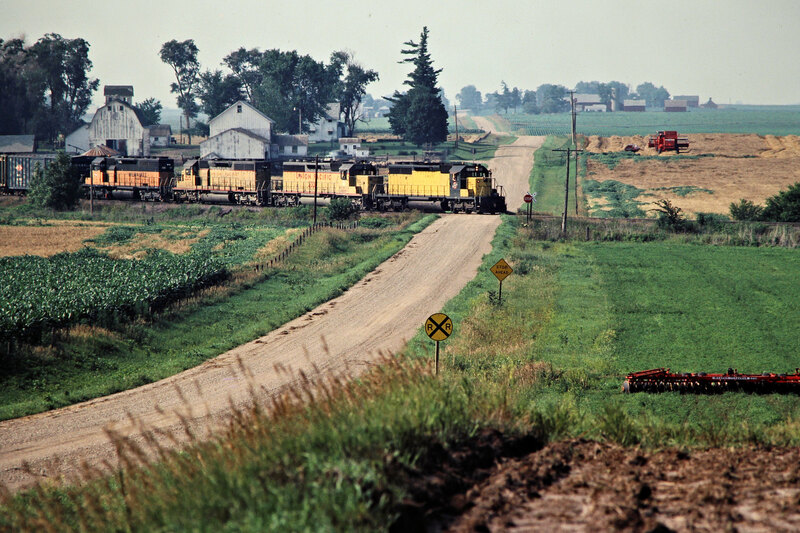 Southbound Chicago and North Western Railway freight train in Dunkerton, Iowa, on May 29, 1977. 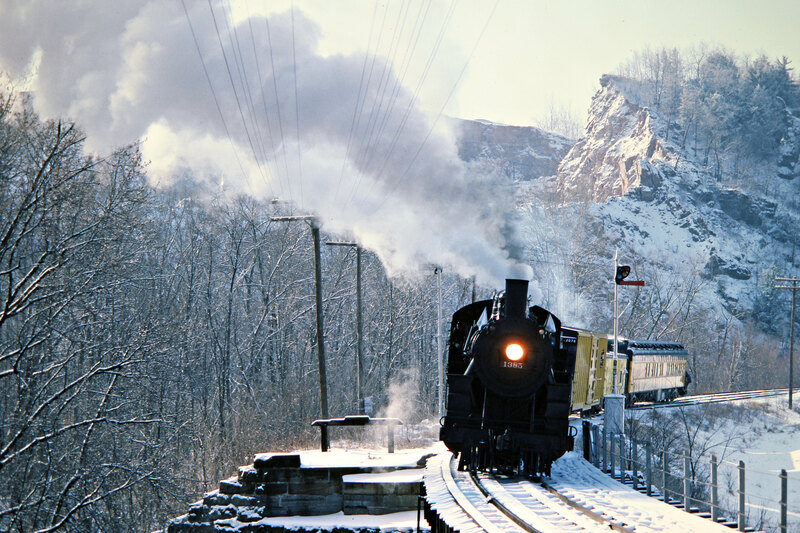 Photograph by John F. Bjorklund, © 2015, Center for Railroad Photography and Art. 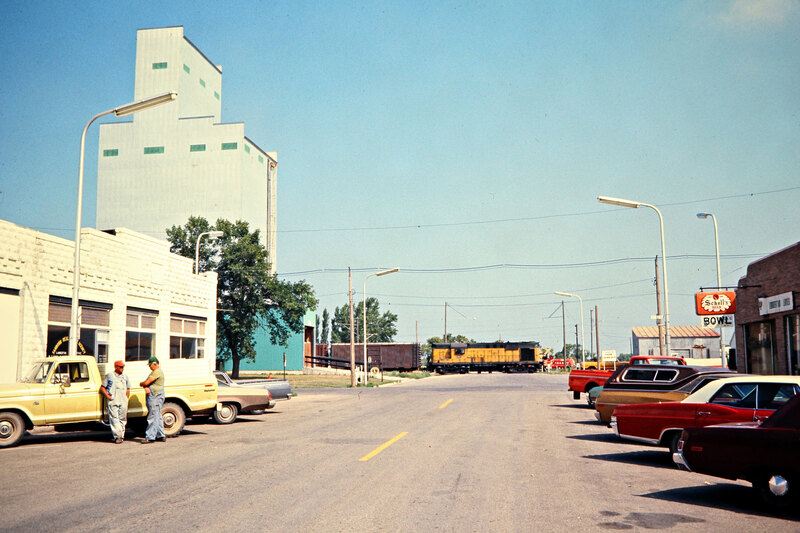 Bjorklund-25-17-22. 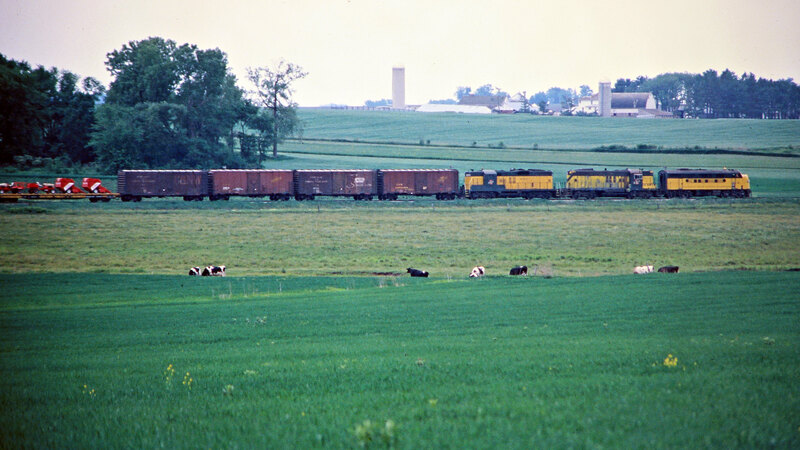 Caboose on an eastbound Chicago and North Western Railway freight train in Melbourne, Iowa, on May 29, 1977. 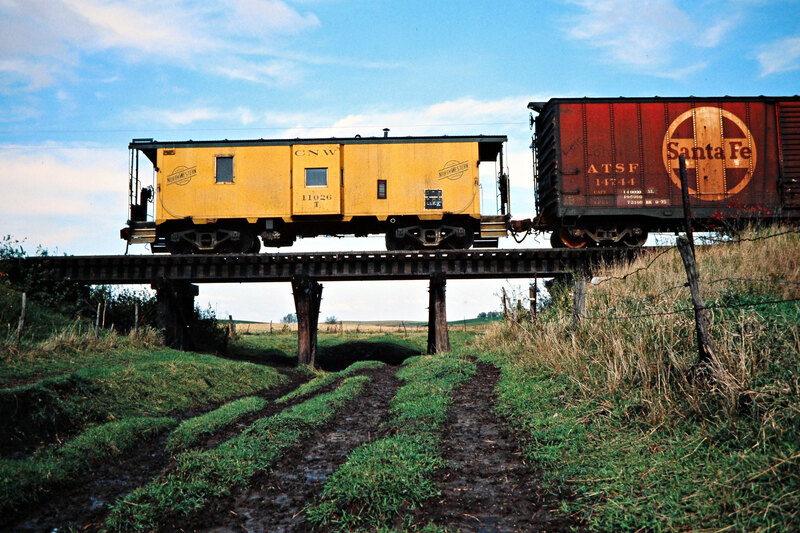 Photograph by John F. Bjorklund, © 2015, Center for Railroad Photography and Art. 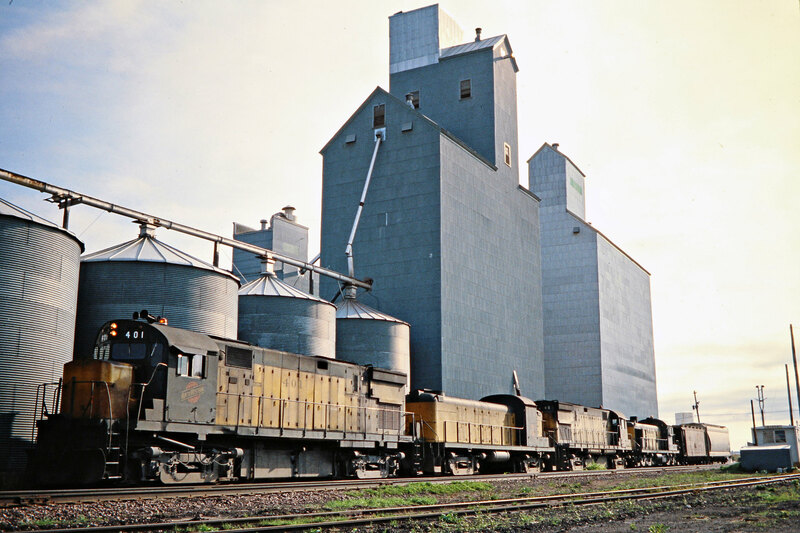 Bjorklund-25-18-07. 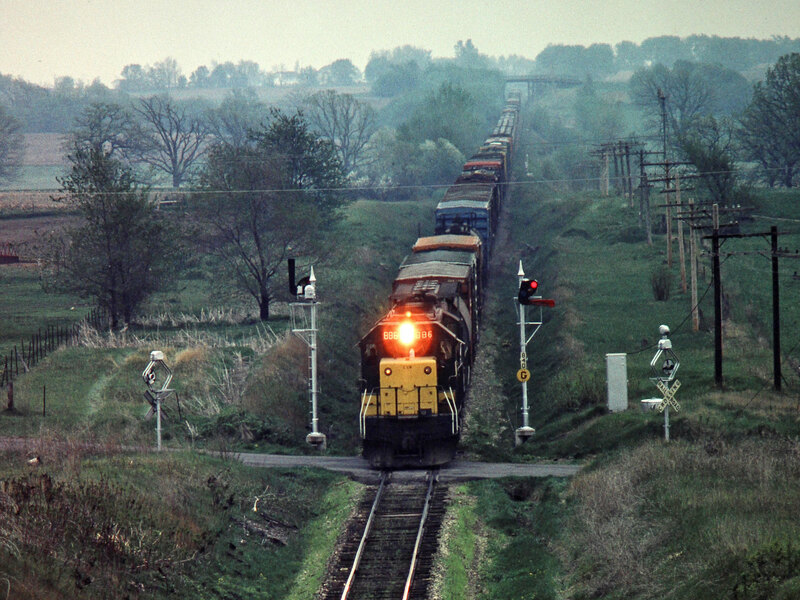 Southbound Chicago and North Western Railway freight train in Reinbeck, Iowa, on May 29, 1977. 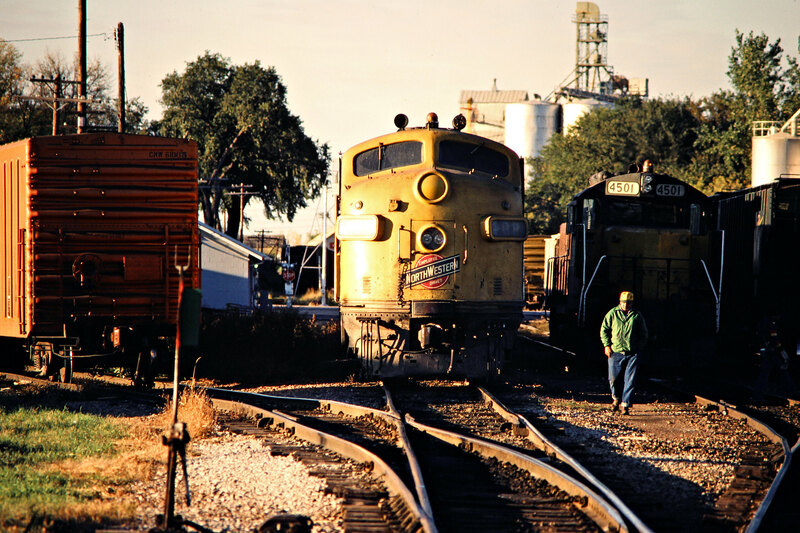 Photograph by John F. Bjorklund, © 2015, Center for Railroad Photography and Art. 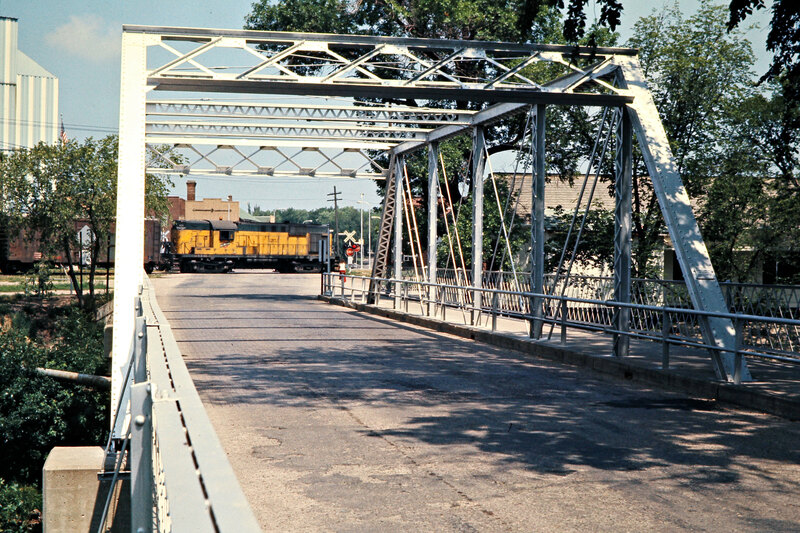 Bjorklund-25-18-20. 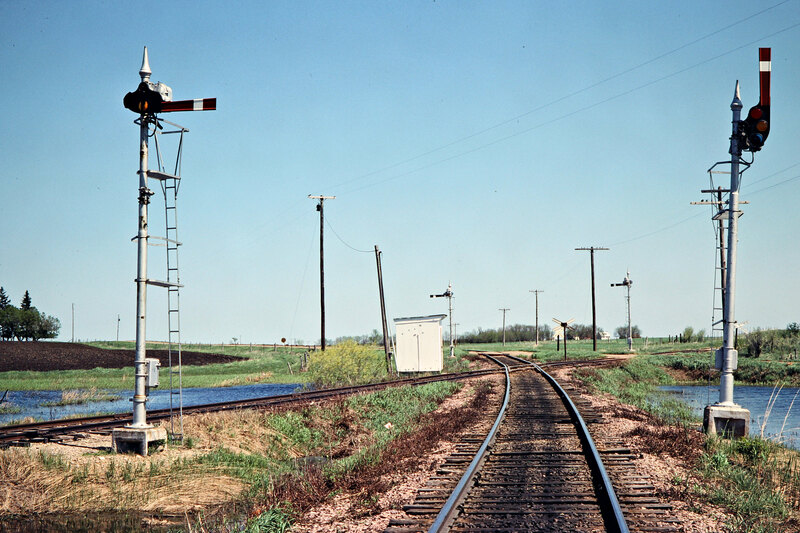 Chicago and North Western Railway semaphore in Tama, Iowa, on May 30, 1977. 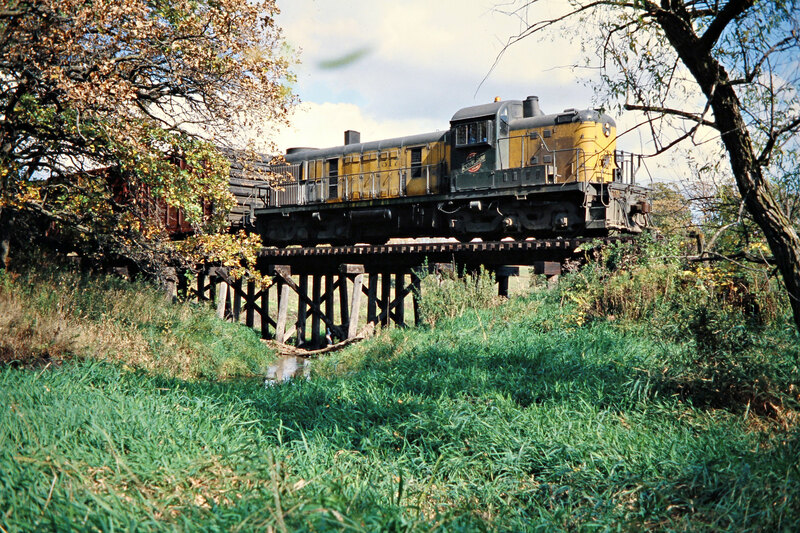 Photograph by John F. Bjorklund, © 2015, Center for Railroad Photography and Art. 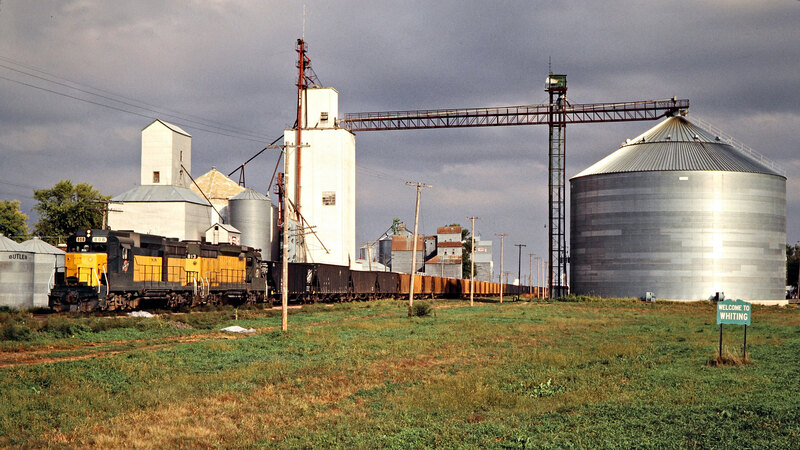 Bjorklund-25-19-15. 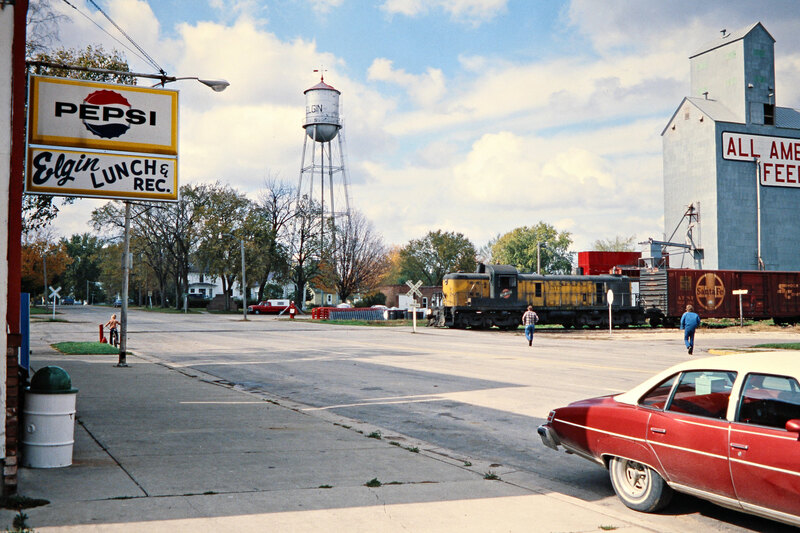 Westbound Chicago and North Western Railway freight train approaching the train order stand in Tama, Iowa, on May 30, 1977. 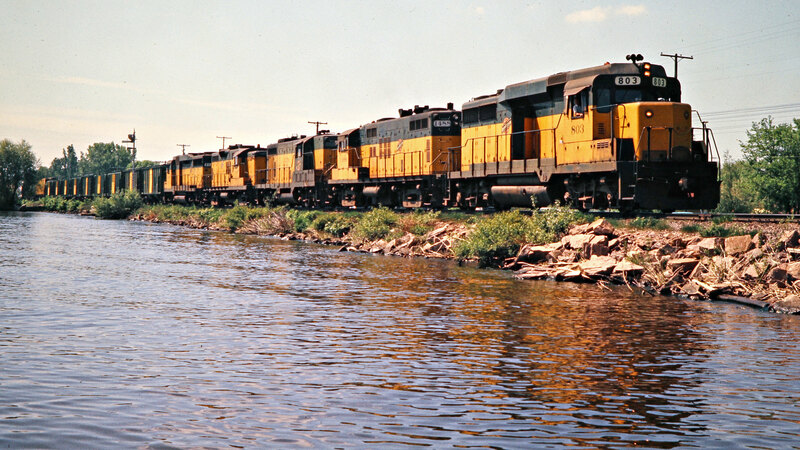 Photograph by John F. Bjorklund, © 2015, Center for Railroad Photography and Art. 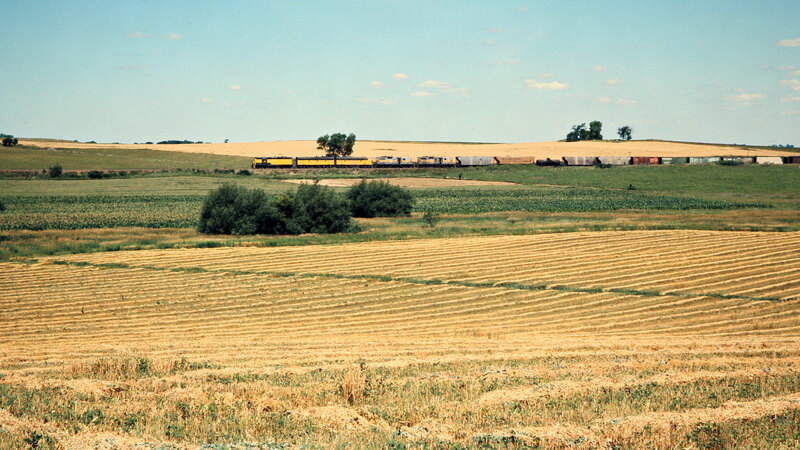 Bjorklund-25-20-03. 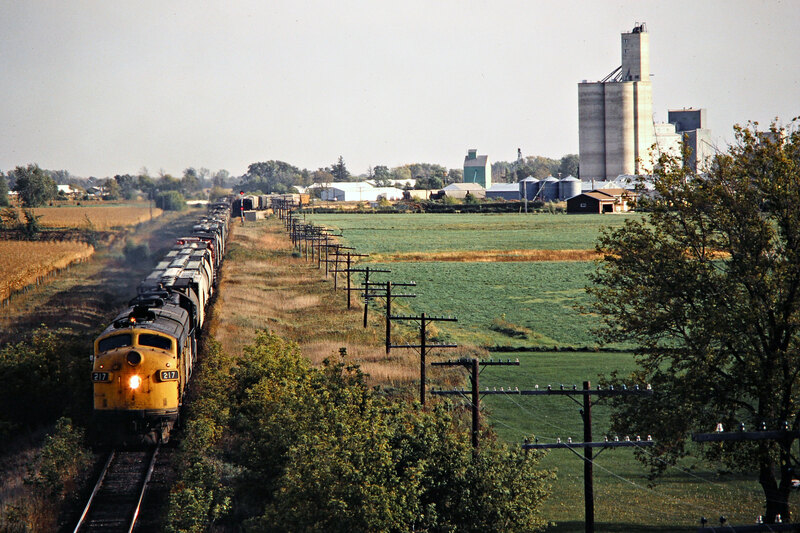 Westbound Chicago and North Western Railway freight train receiving orders at Tower CK in Winona, Minnesota, on October 1, 1977. 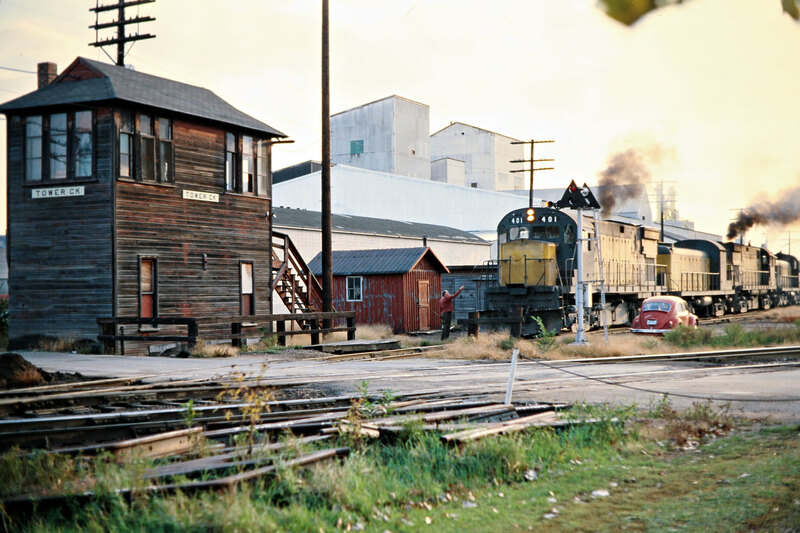 Photograph by John F. Bjorklund, © 2015, Center for Railroad Photography and Art. 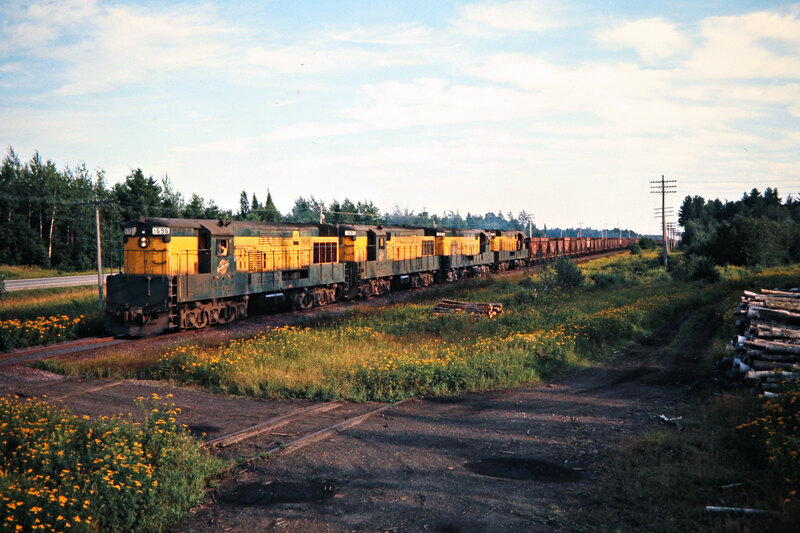 Bjorklund-25-22-13. 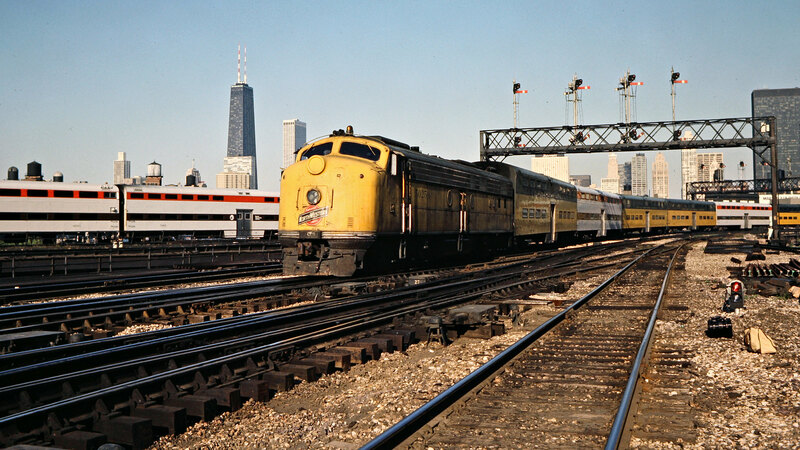 Chicago and North Western Railway Alco RS3 locomotive no. 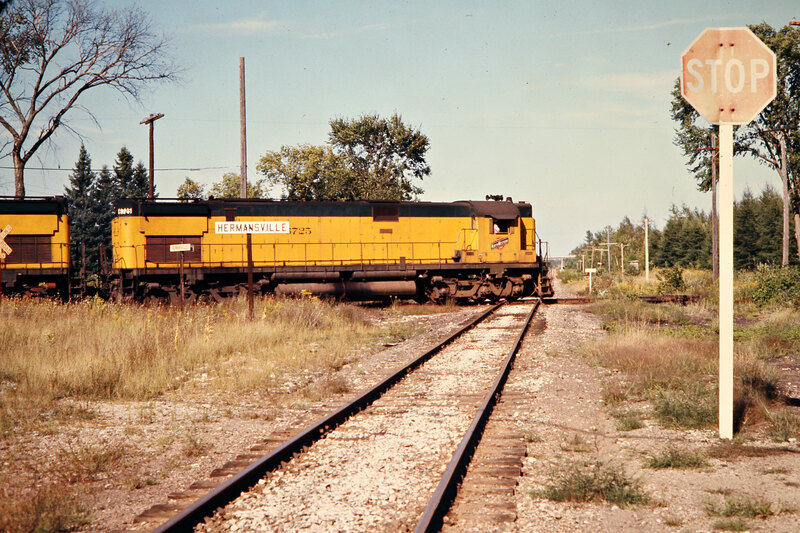 1553 in Winona, Minnesota, on October 1, 1977. 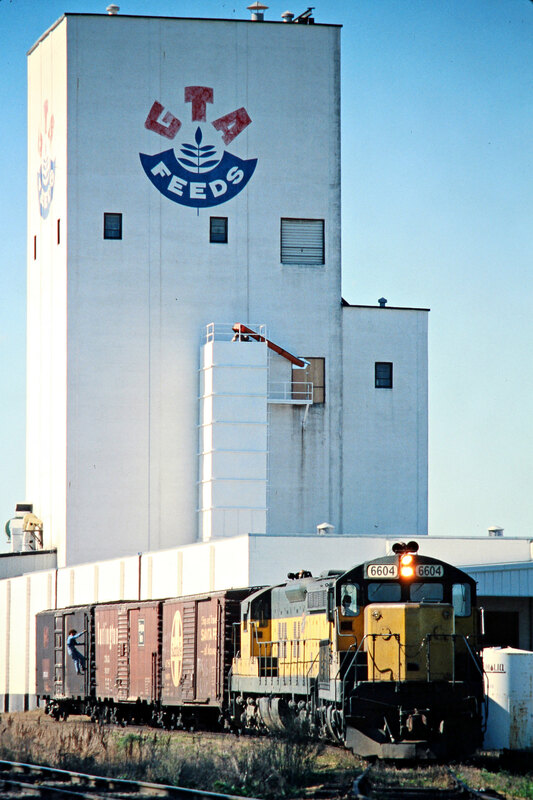 Photograph by John F. Bjorklund, © 2015, Center for Railroad Photography and Art. Bjorklund-25-22-17. 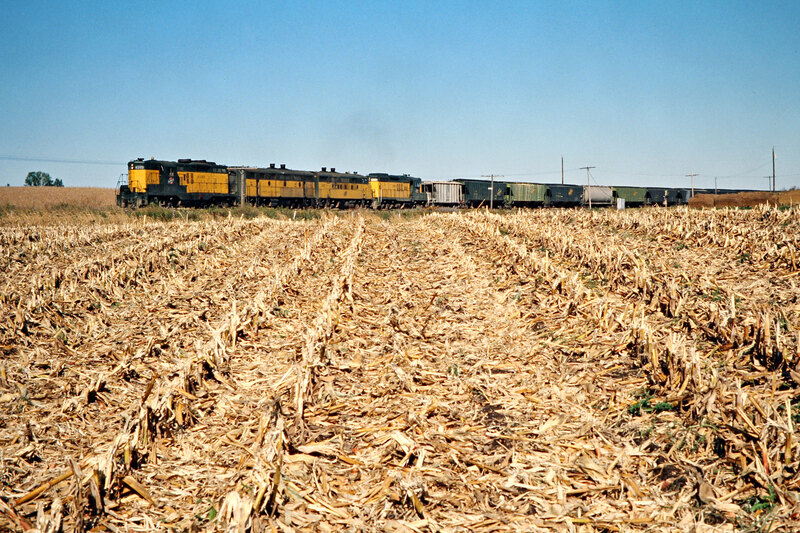 Westbound Chicago and North Western Railway freight train in Eyota, Minnesota, on October 1, 1977. 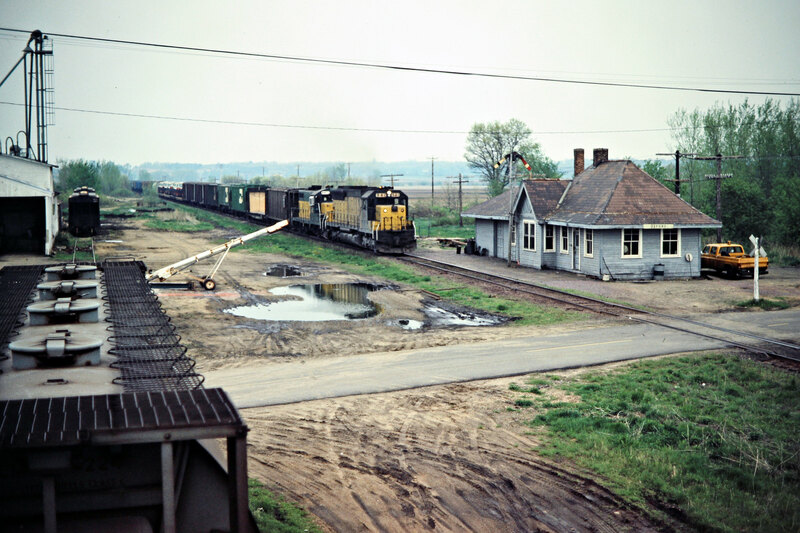 Photograph by John F. Bjorklund, © 2015, Center for Railroad Photography and Art. 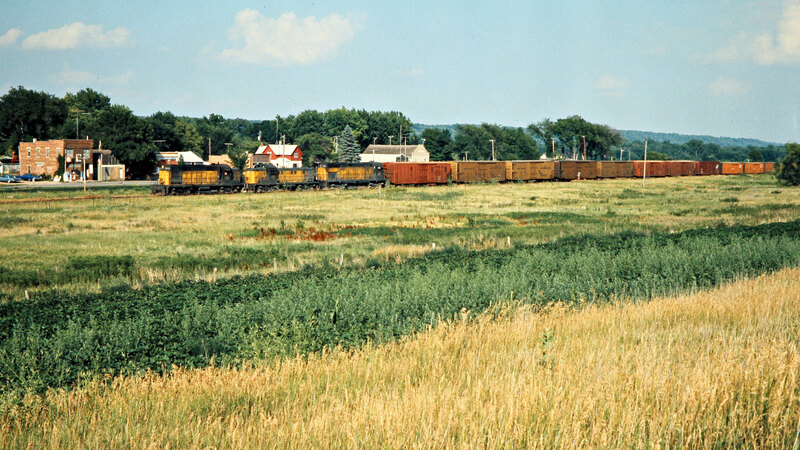 Bjorklund-25-23-13. 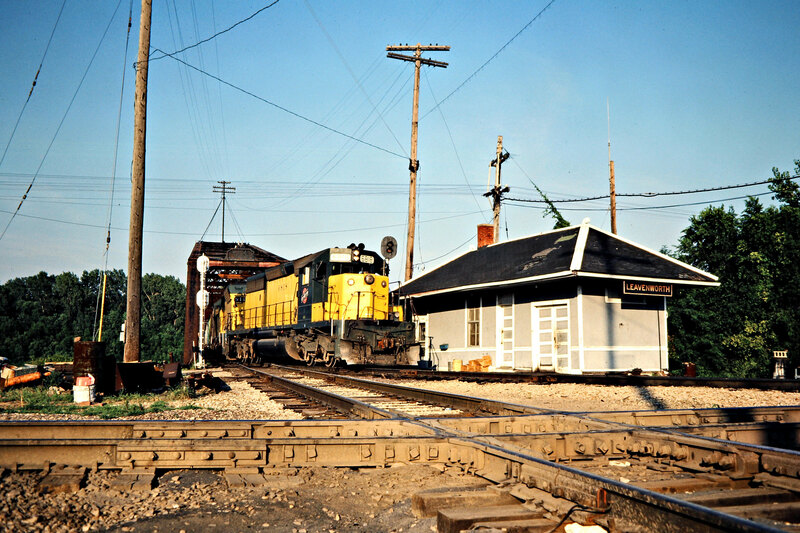 Northbound Chicago and North Western Railway caboose in Elgin, Minnesota, on October 10, 1977. 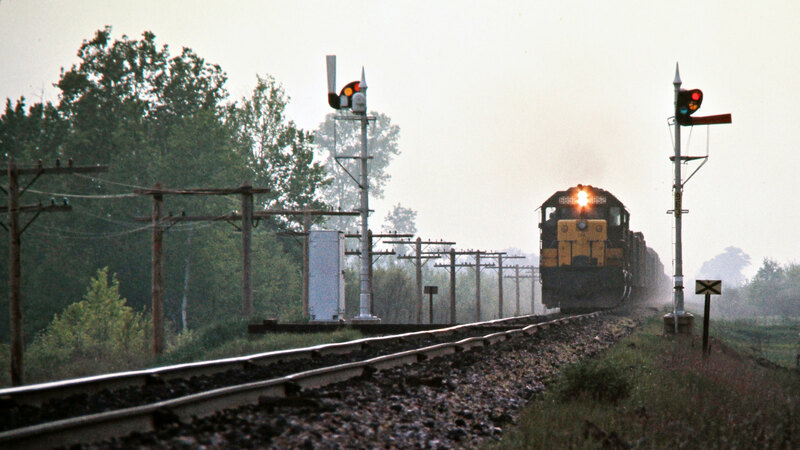 Photograph by John F. Bjorklund, © 2015, Center for Railroad Photography and Art. 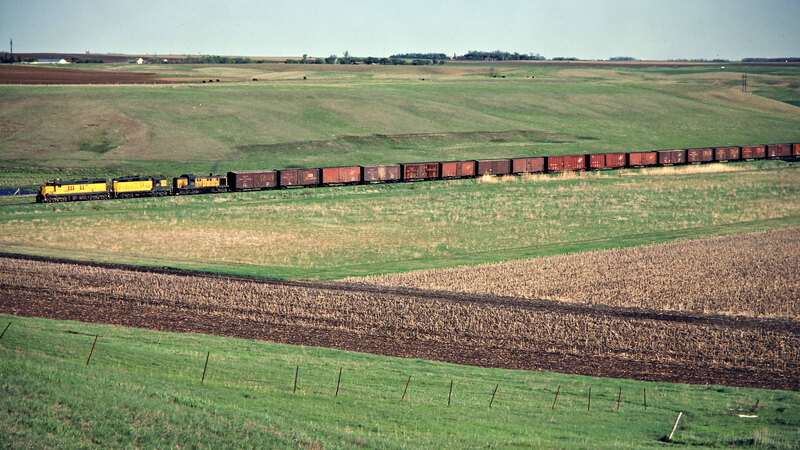 Bjorklund-25-24-09.